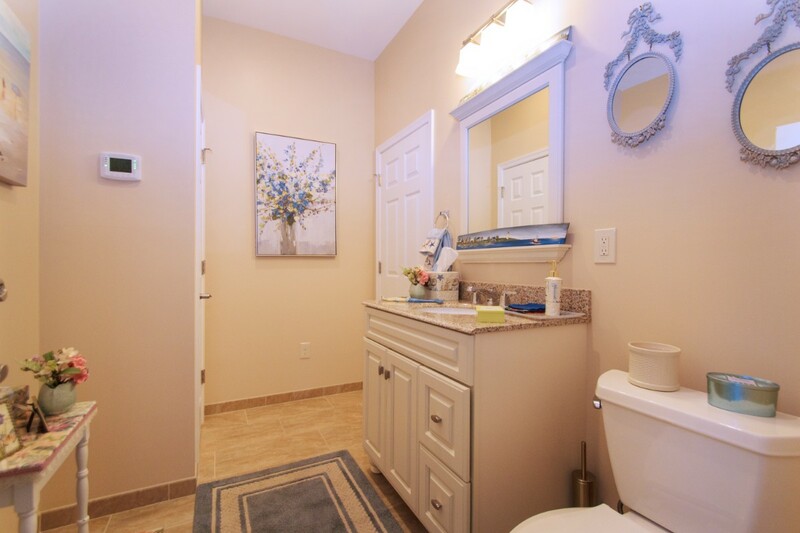 "Natural Beauty" has it all! 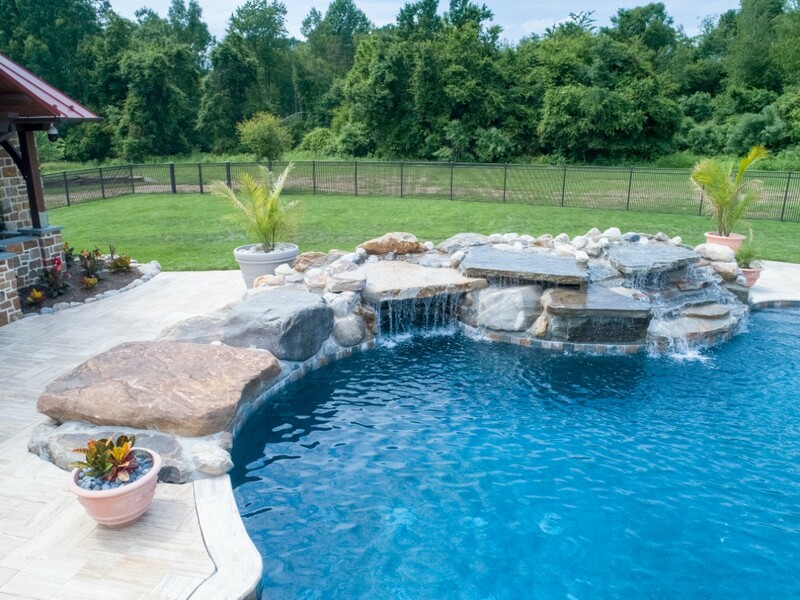 Enjoy this large pool and spa with beach entry, raised spa, tanning ledge, and boulder waterfalls and dive rock with a swim-in grotto. 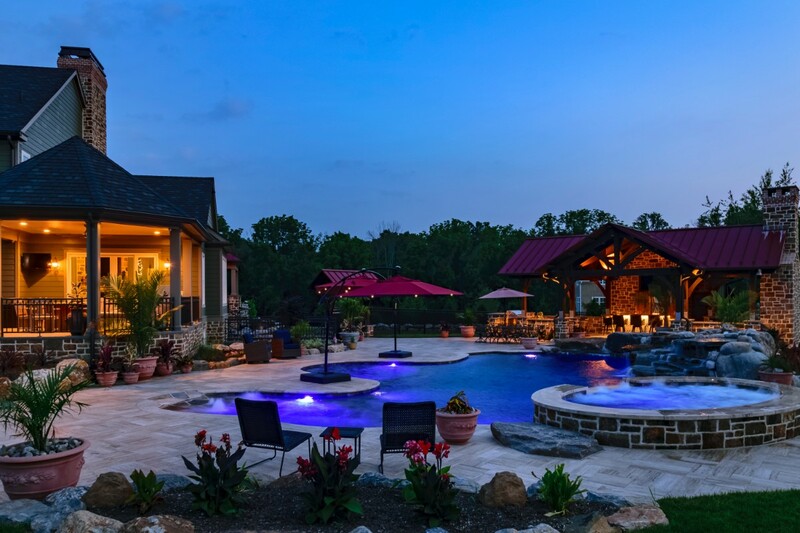 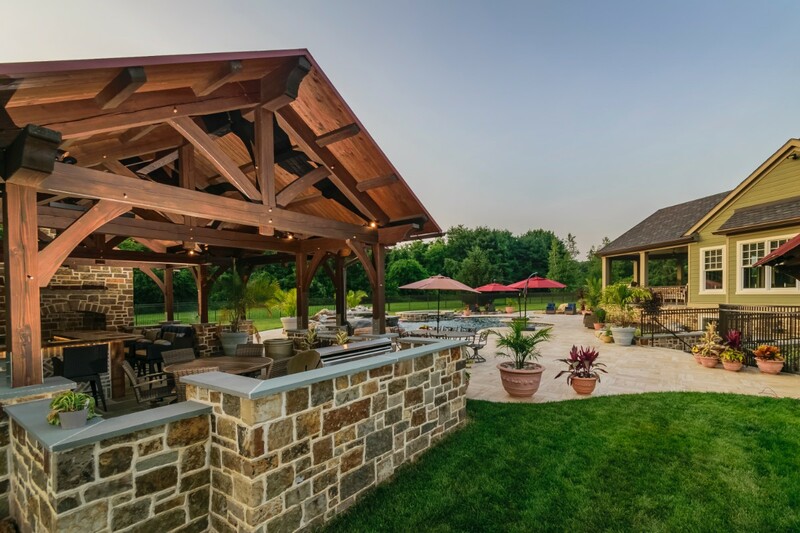 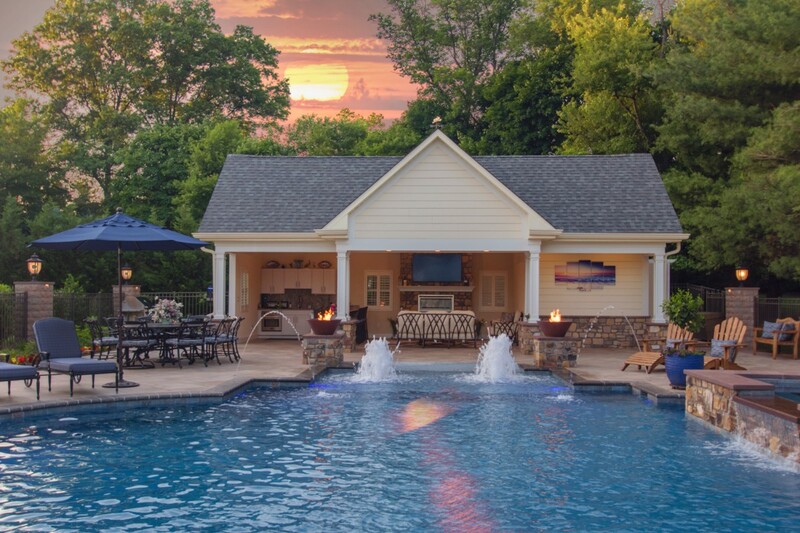 When you and your friends are tired of splashing around, sit by the pool house bar, outdoor kitchen, and fireplace. 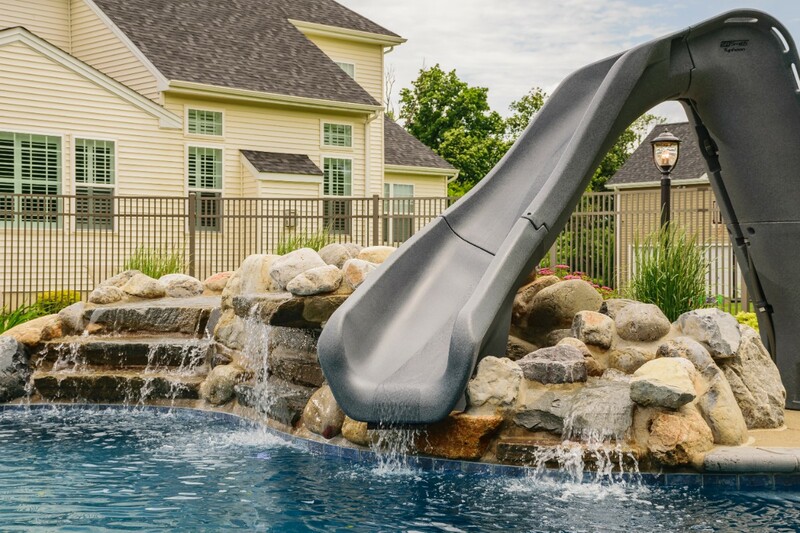 Hours of fun right in your back yard! 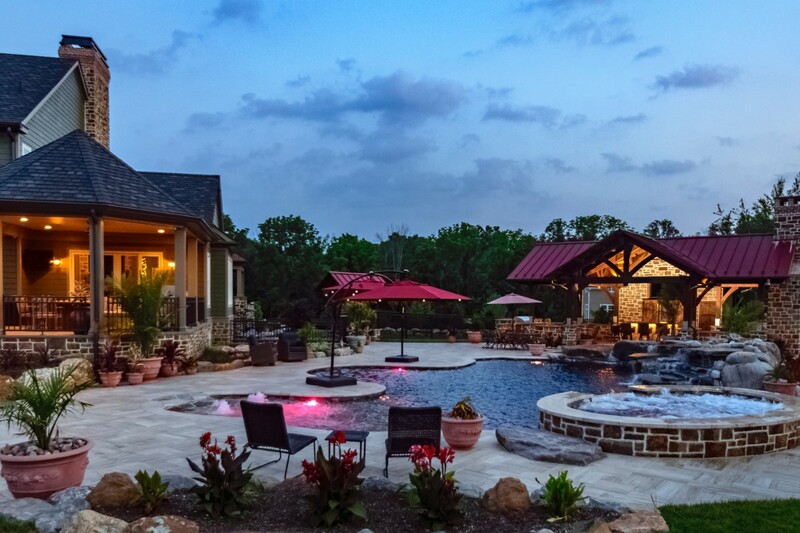 "5 Star Resort" solves the need for future vacations with friends and family. 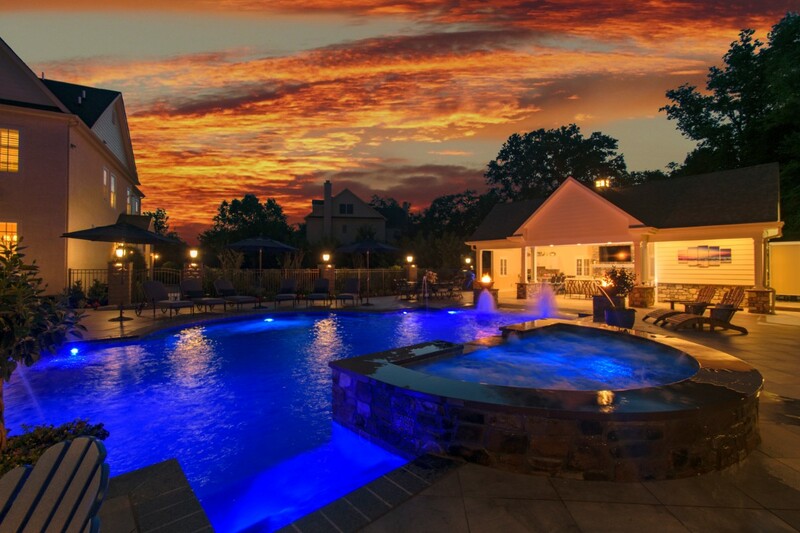 Walk out of your home and enjoy the amenities only promised by resorts a long plane ride away. 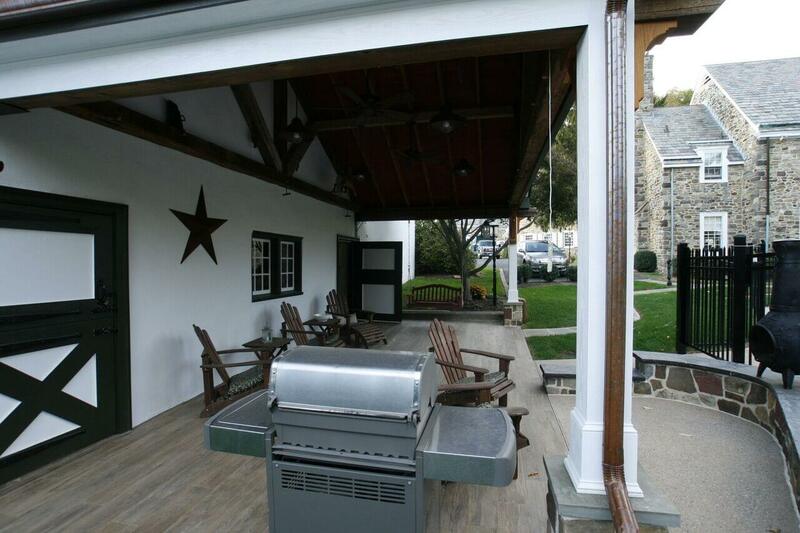 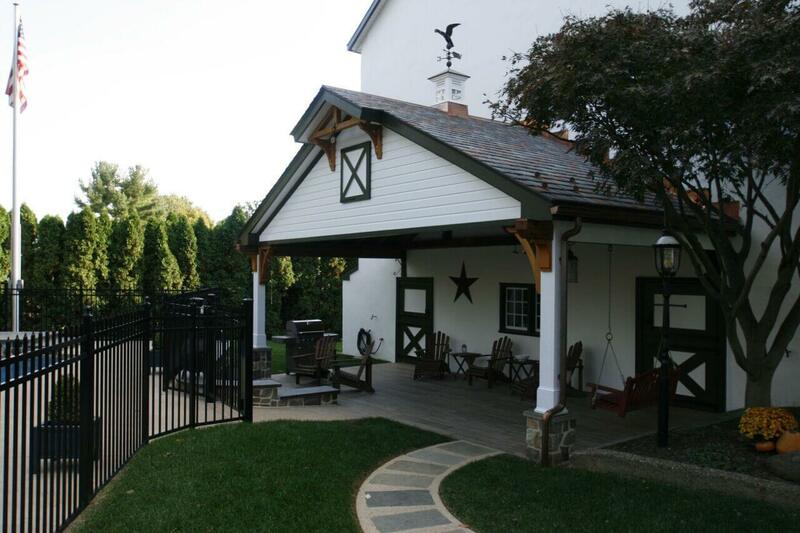 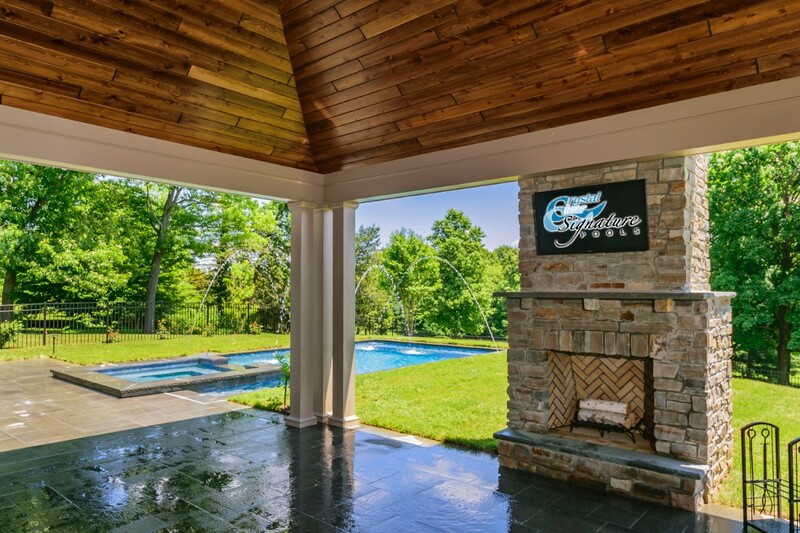 Custom pool house with full kitchen, fireplace, radiant heat, tv and audio, bathroom, and outdoor shower. 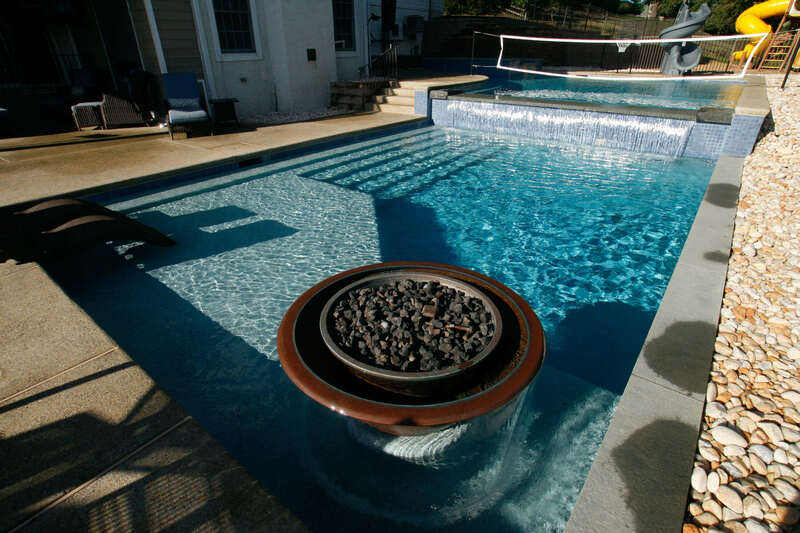 Large pool and spa showcase a modern beach entry, fire bowls, and jet water features. 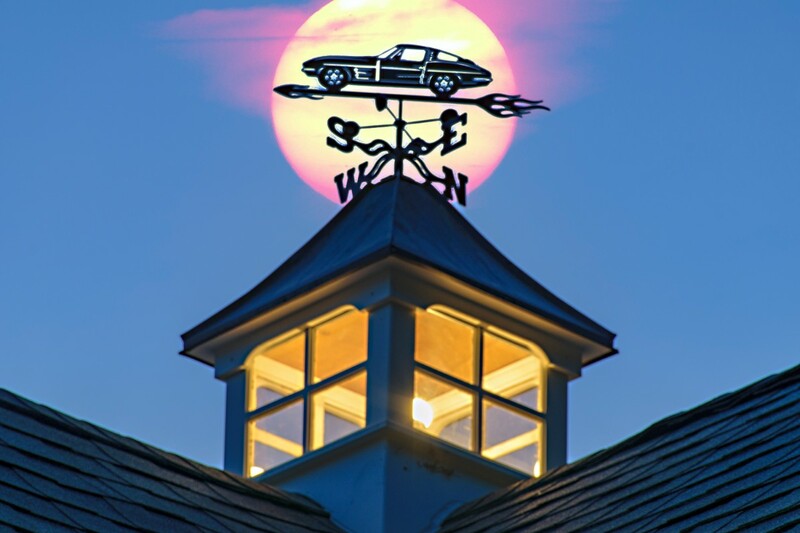 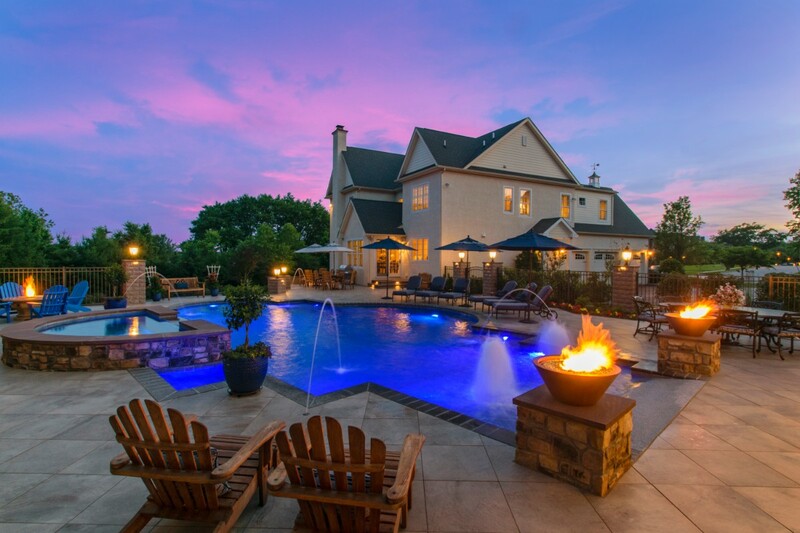 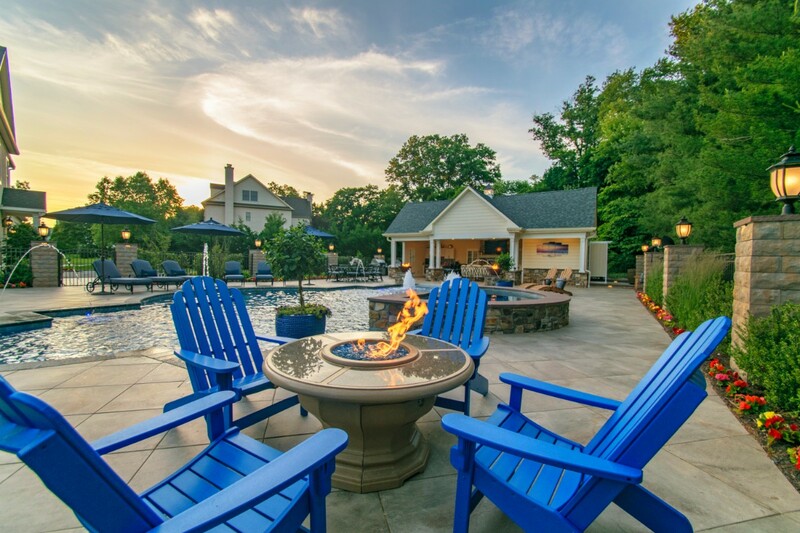 When the sun goes down, sit by the fire pit and enjoy the view! 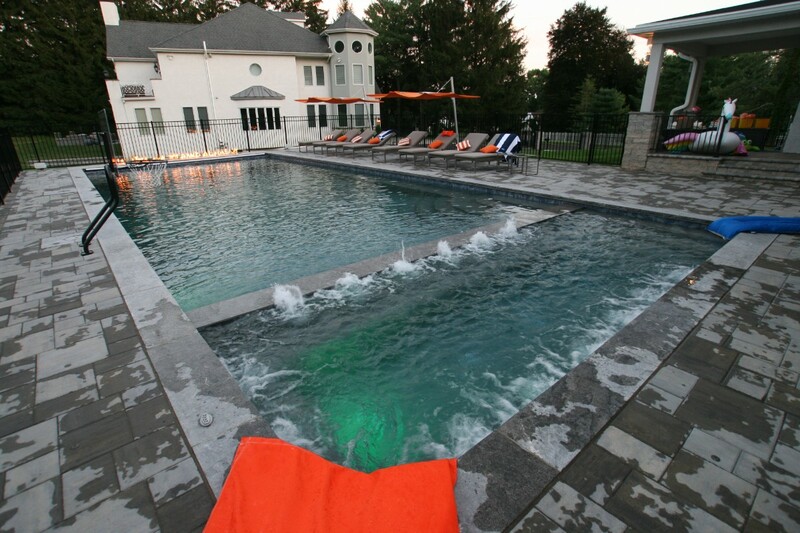 "Let's Play" was a renovation transforming an old and tired pool into a clean, modern pool and spa. 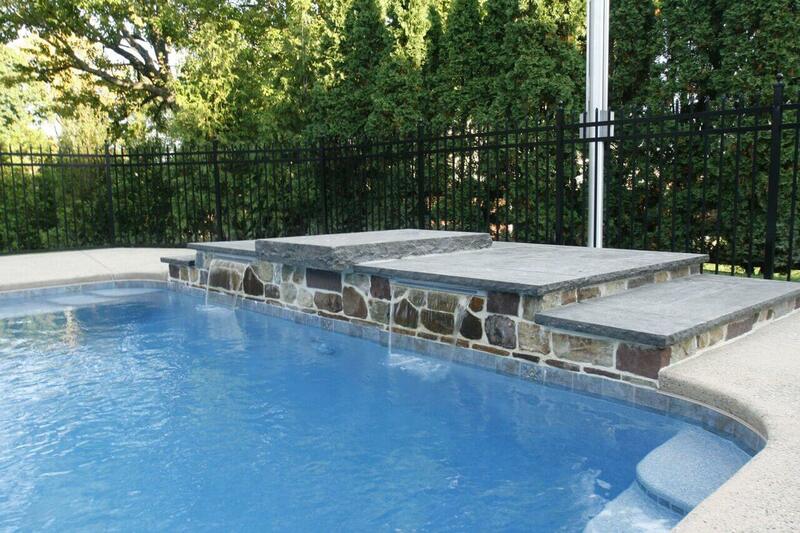 Entertain your family and friends on the large tanning ledge, 6" raised spa, diving board, fire pit, and outdoor kitchen. 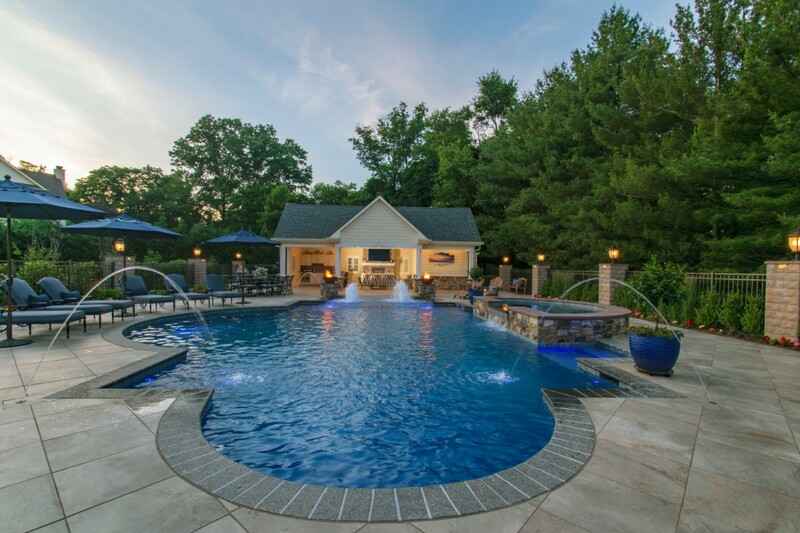 "Elegant Escape" was a complete renovation adding many modern amenities enjoyed within and around the pool. 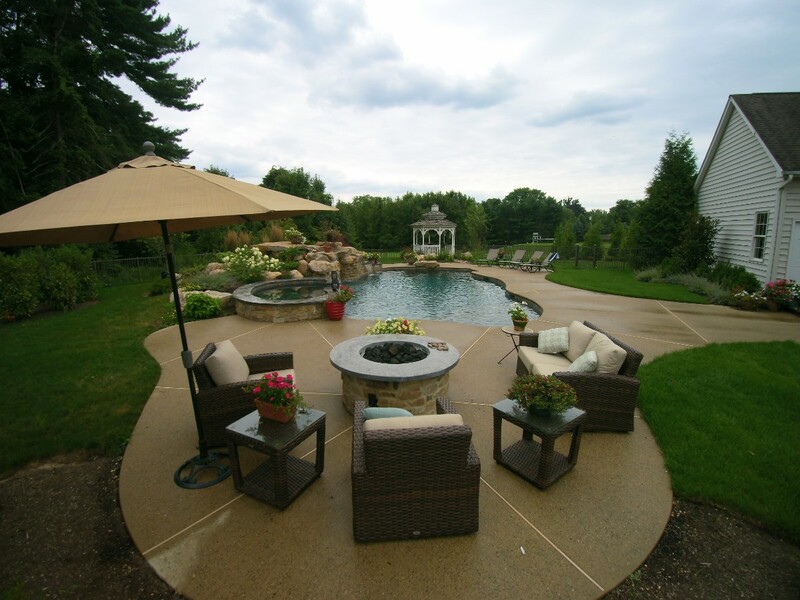 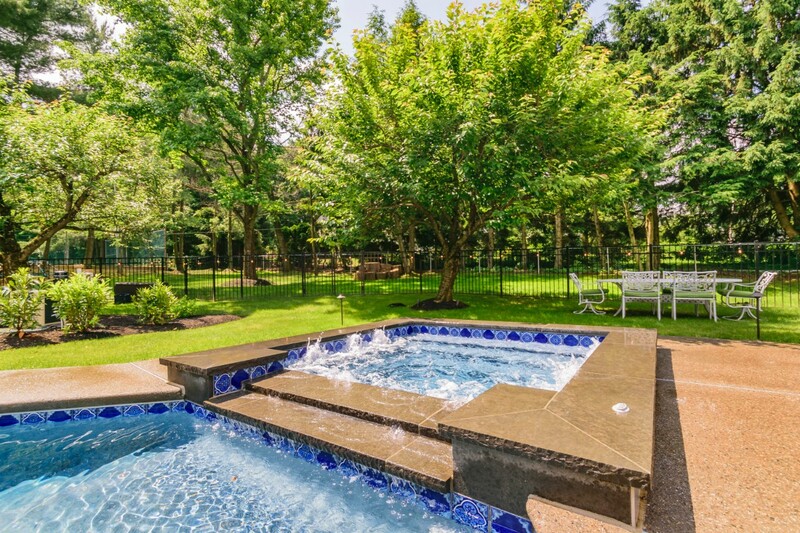 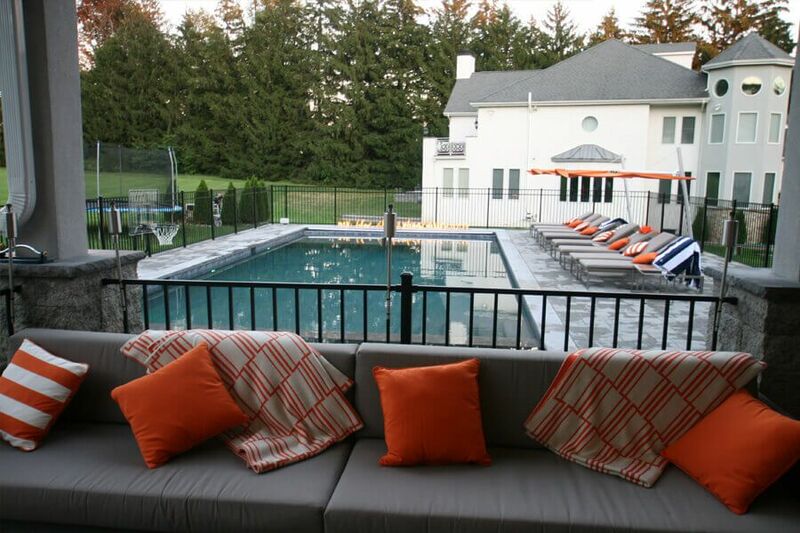 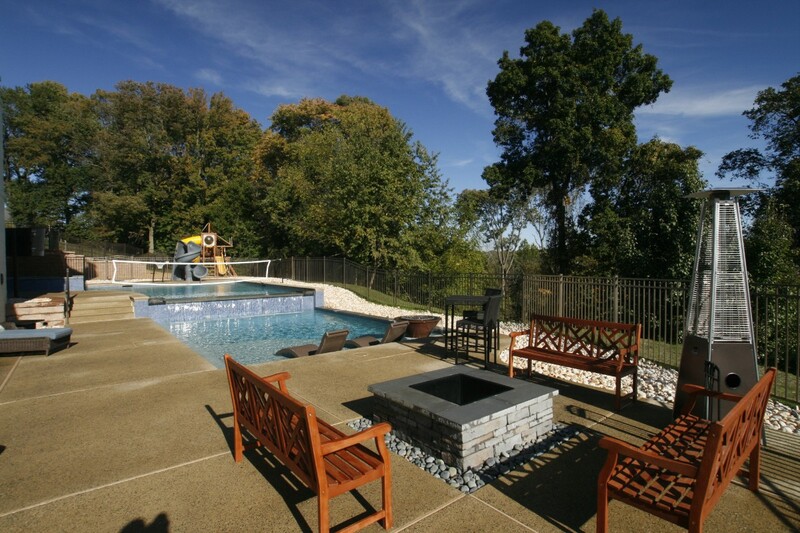 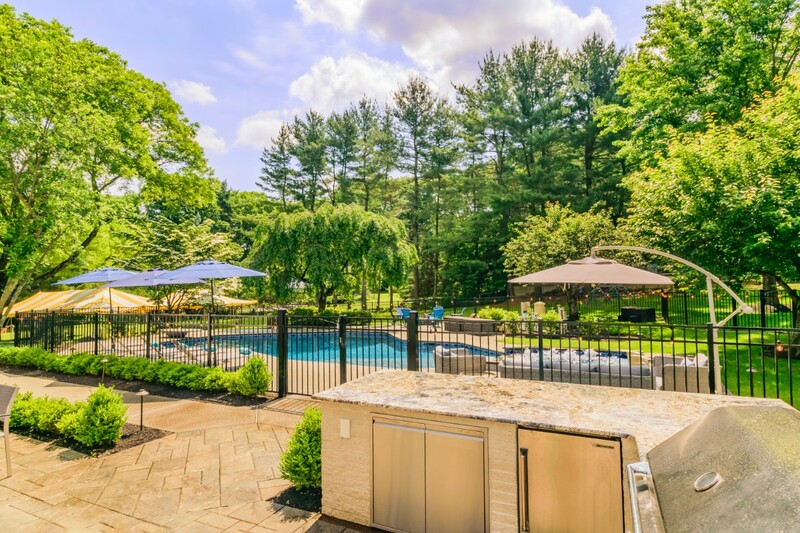 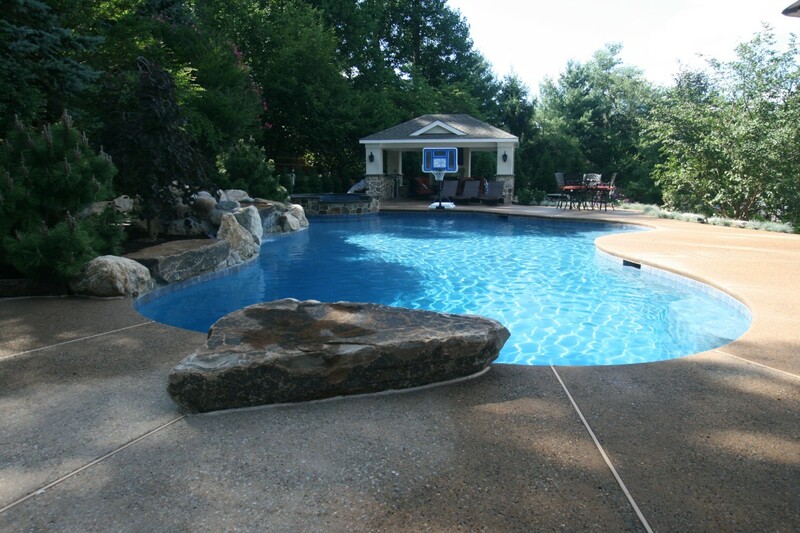 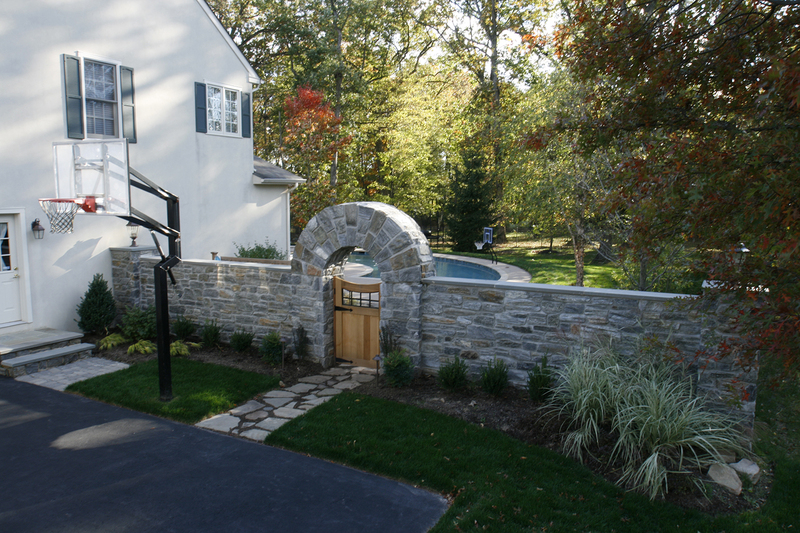 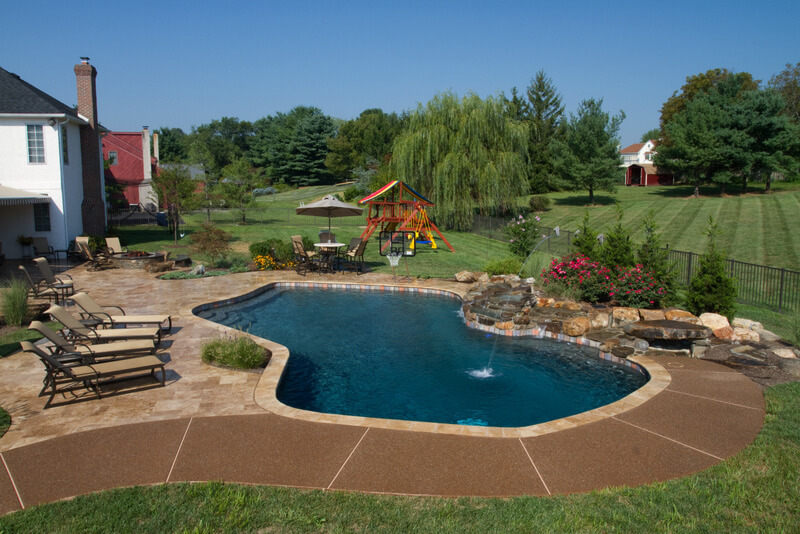 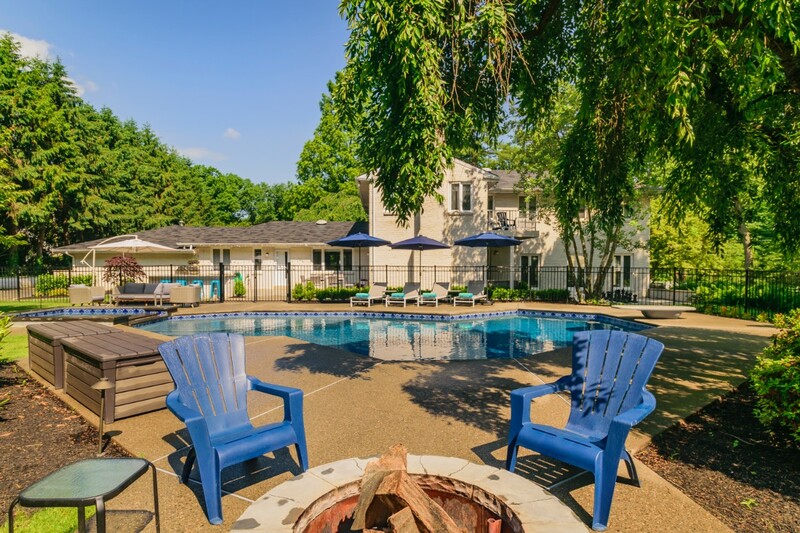 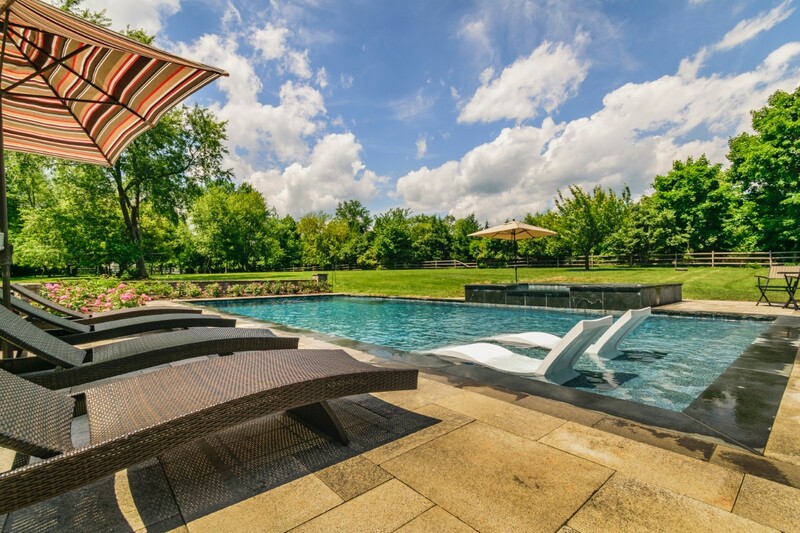 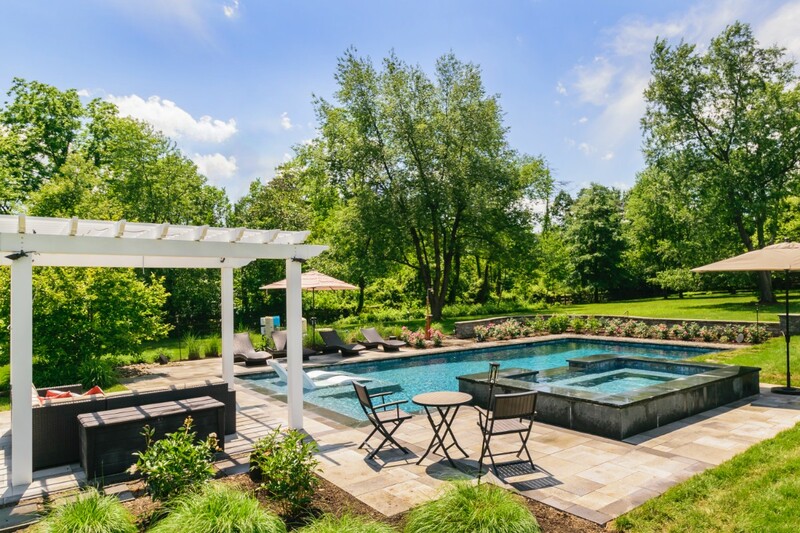 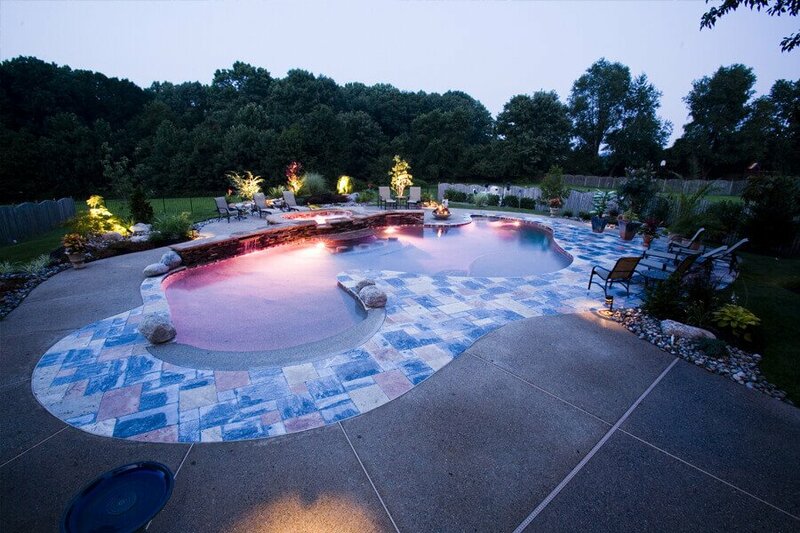 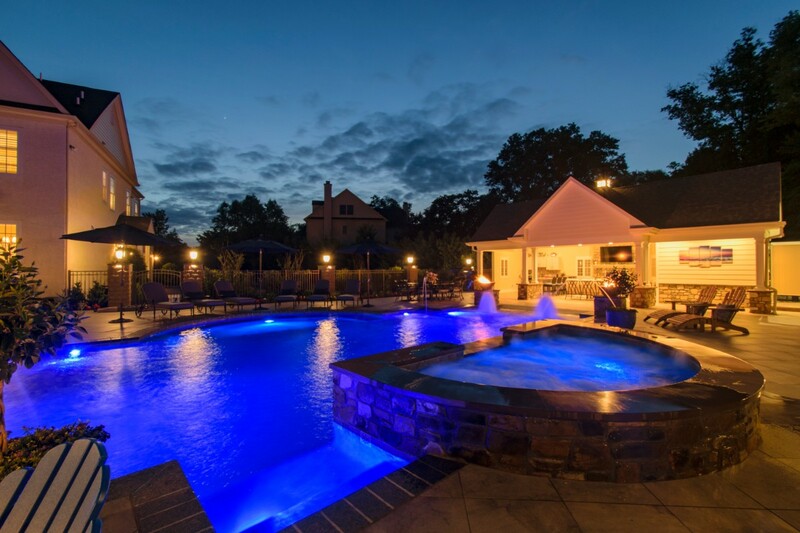 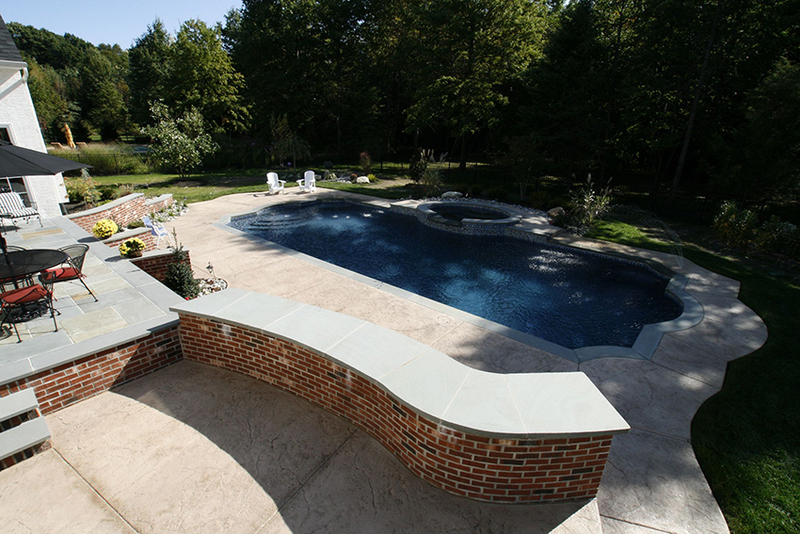 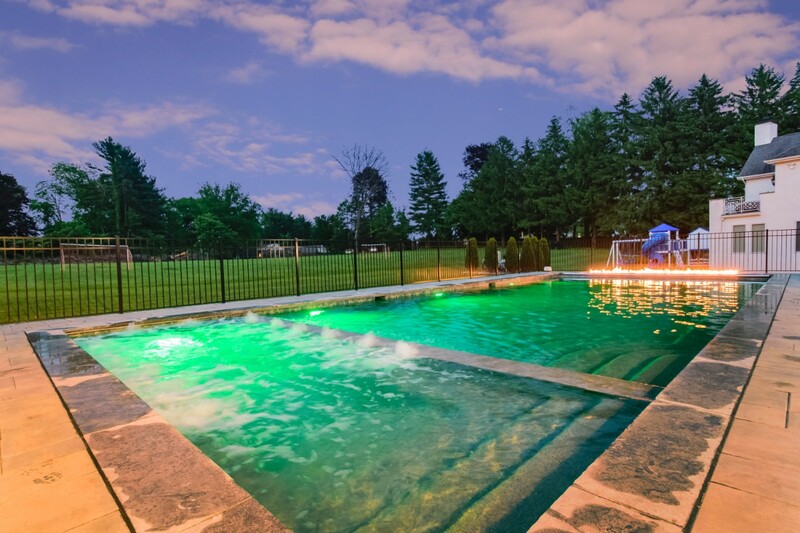 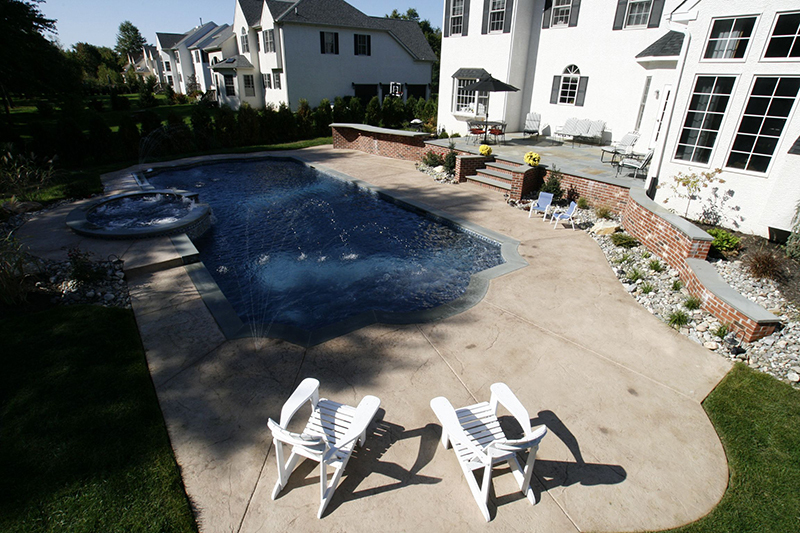 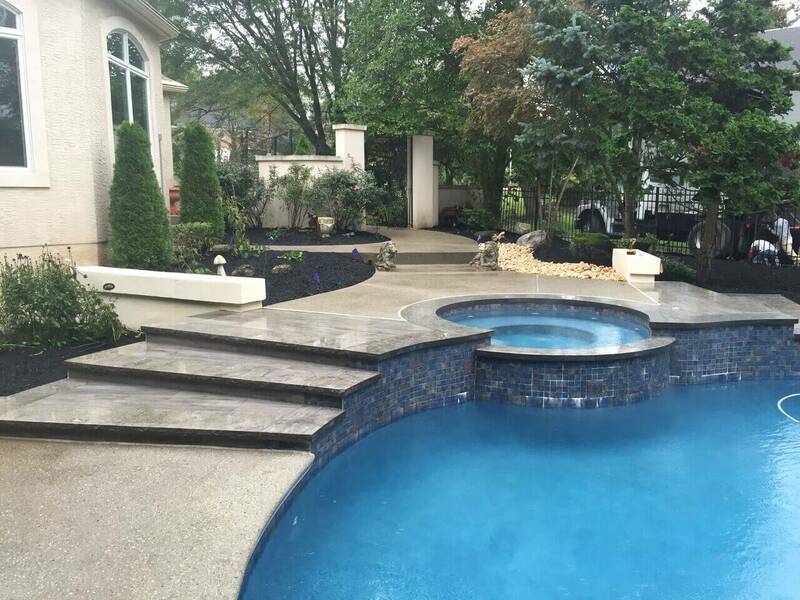 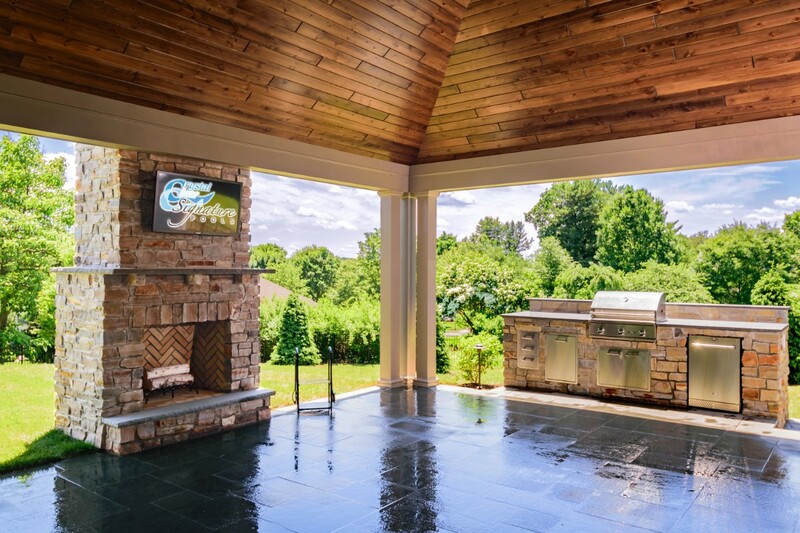 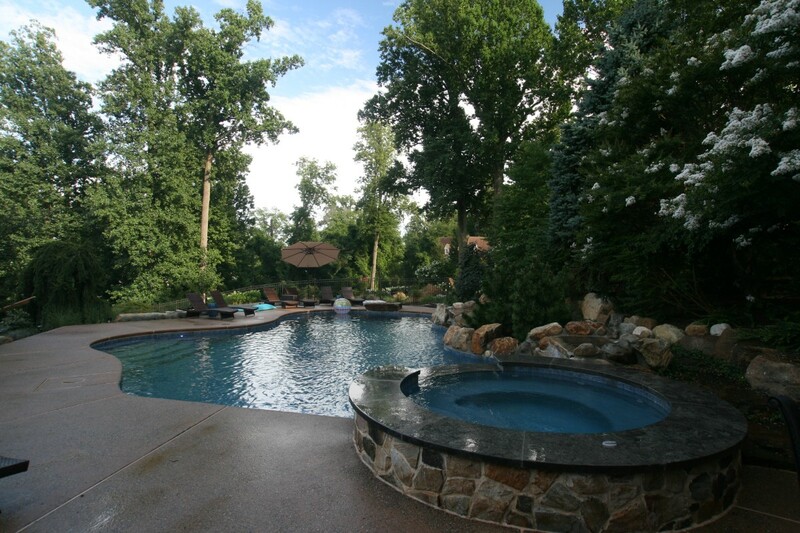 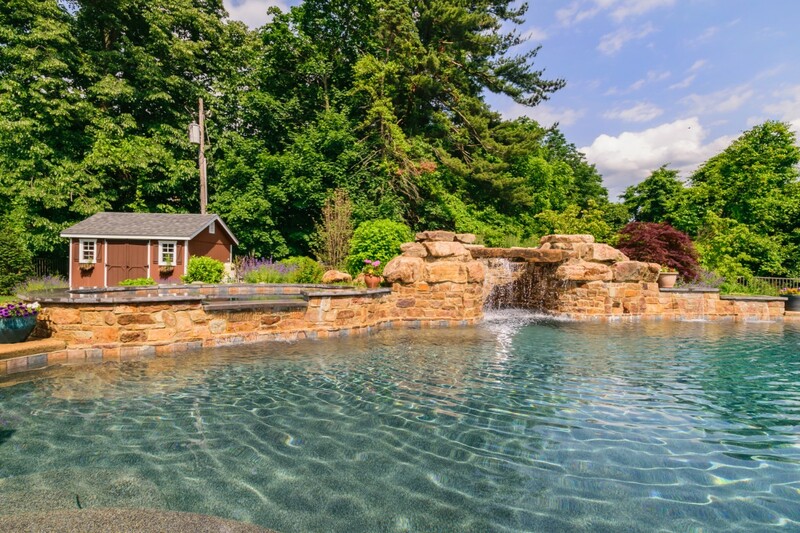 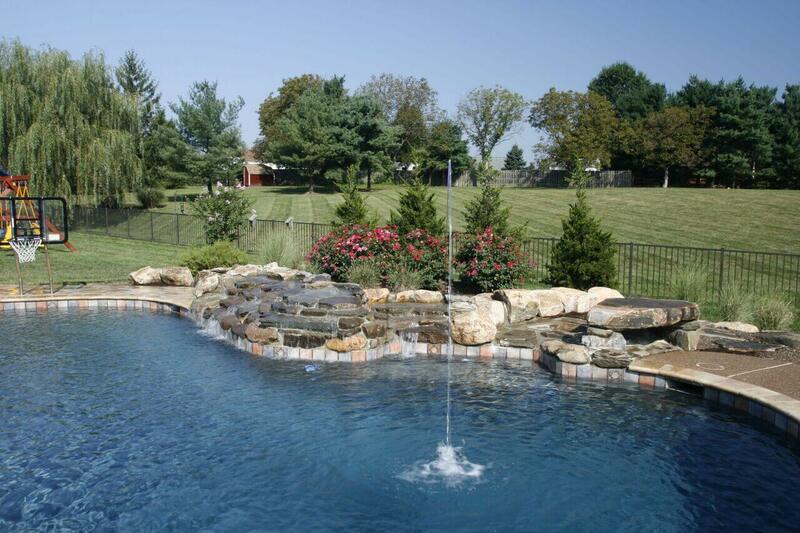 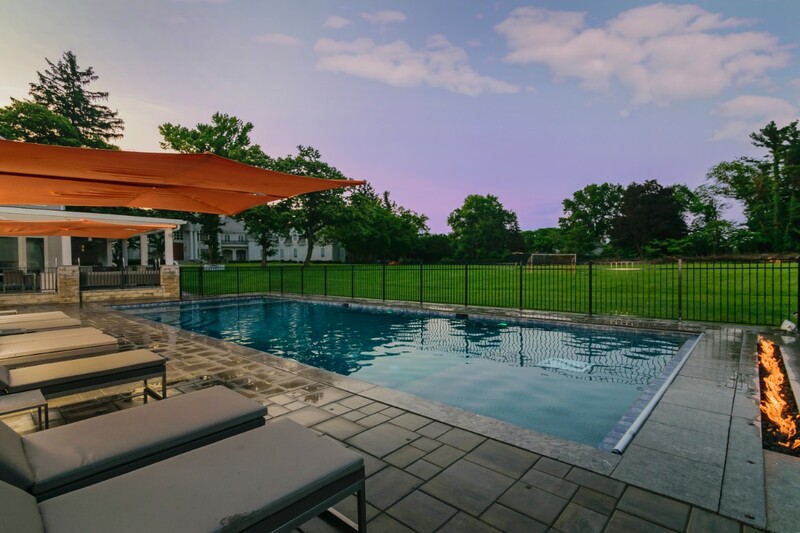 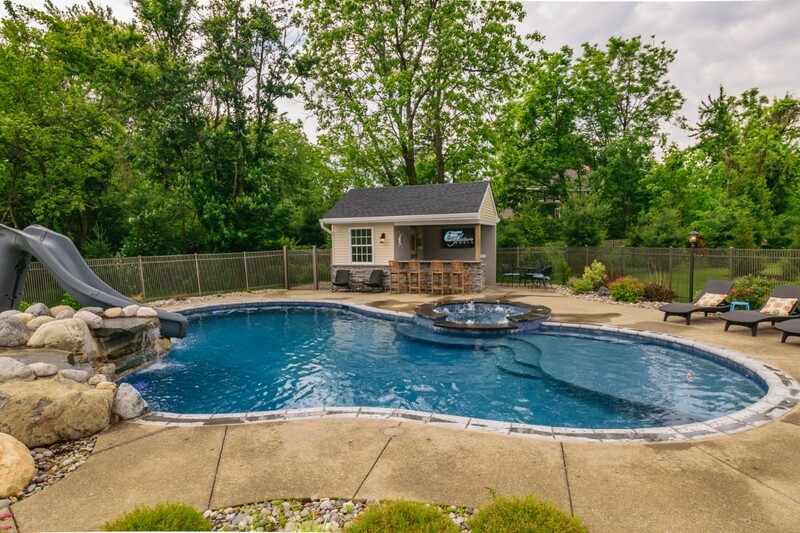 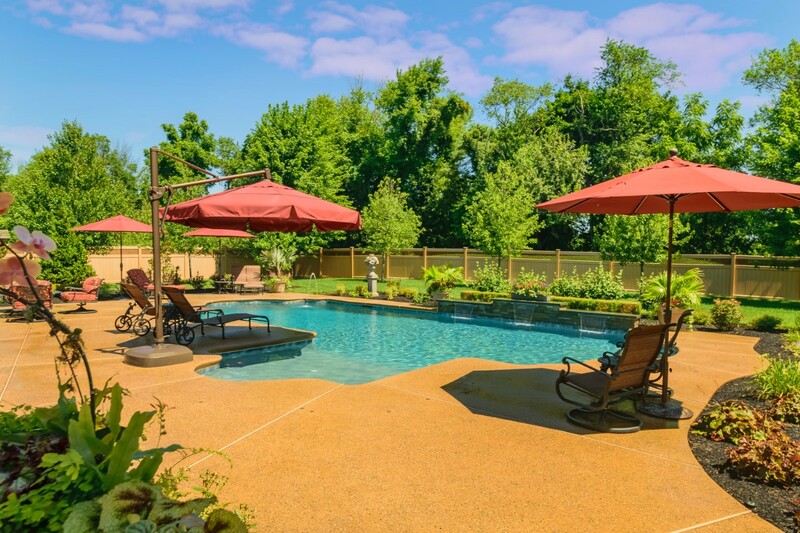 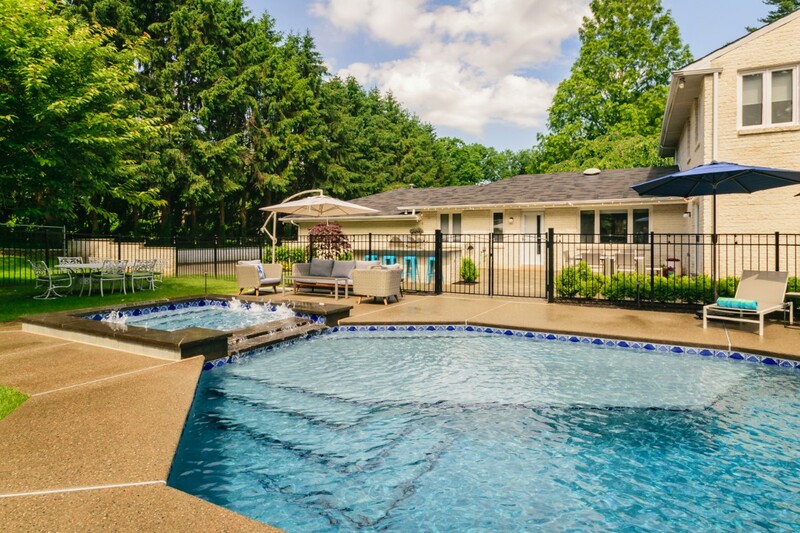 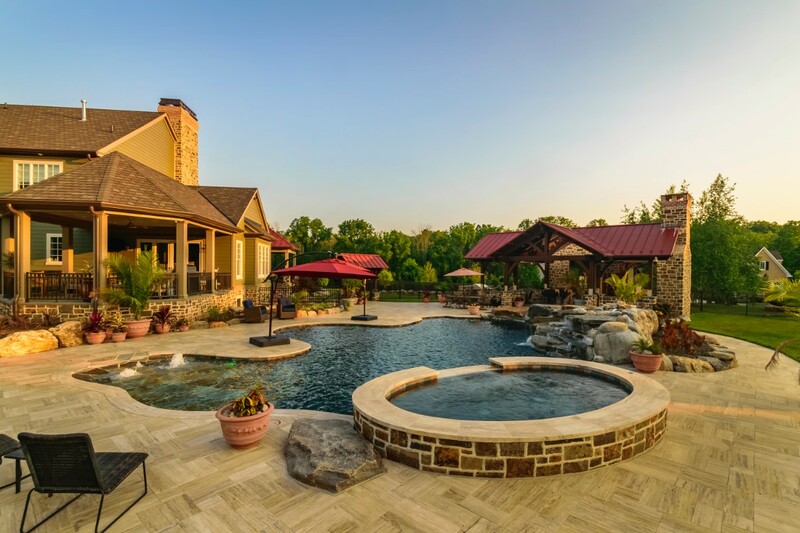 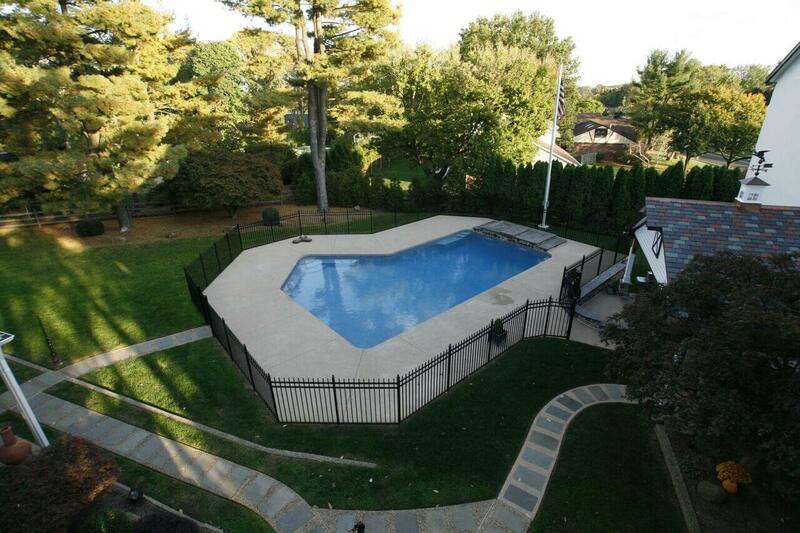 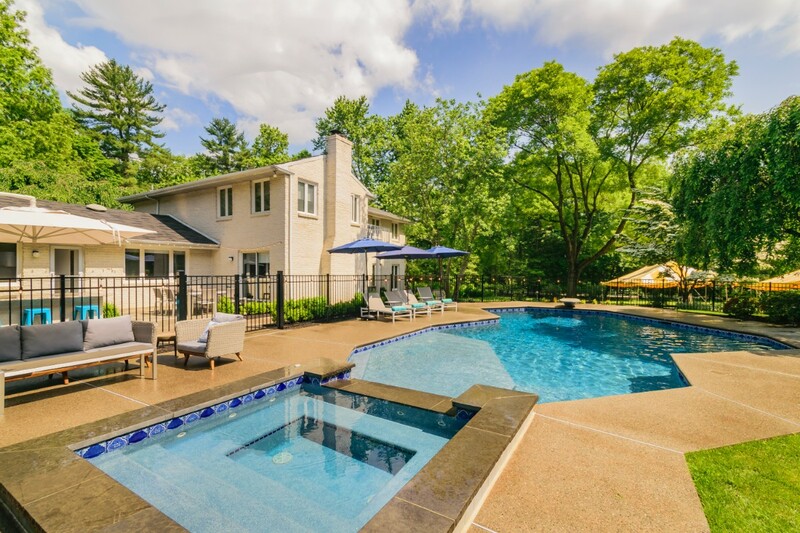 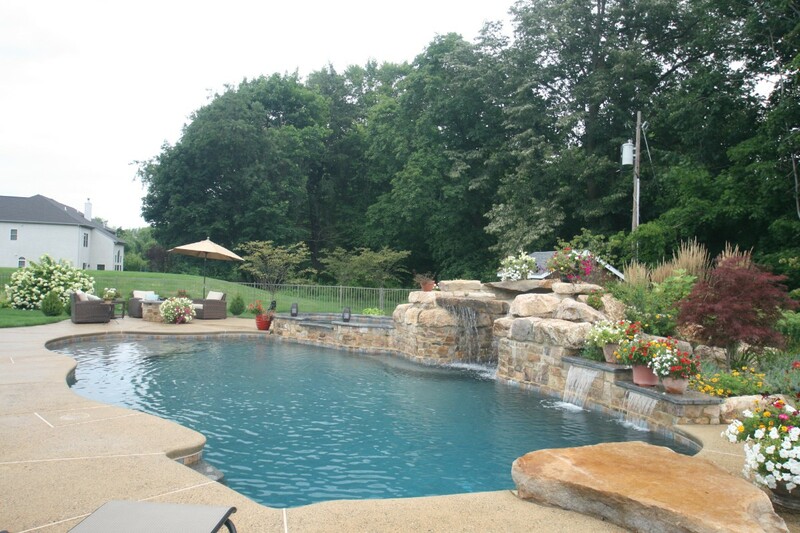 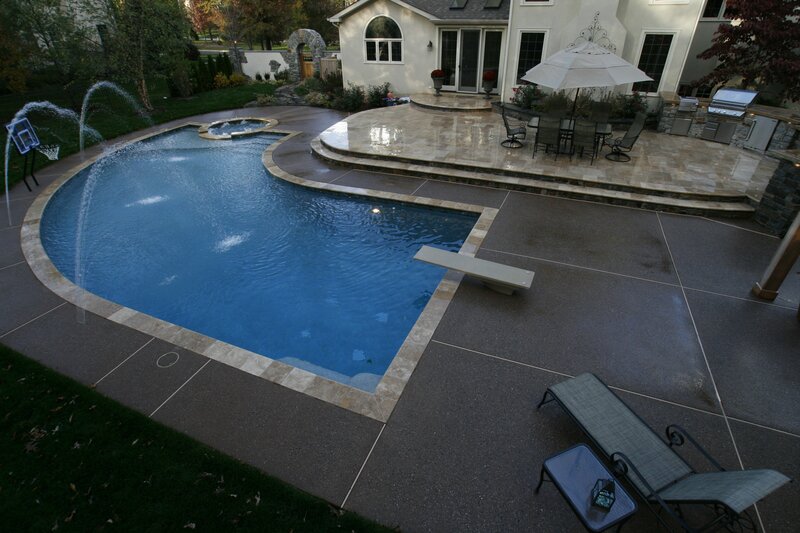 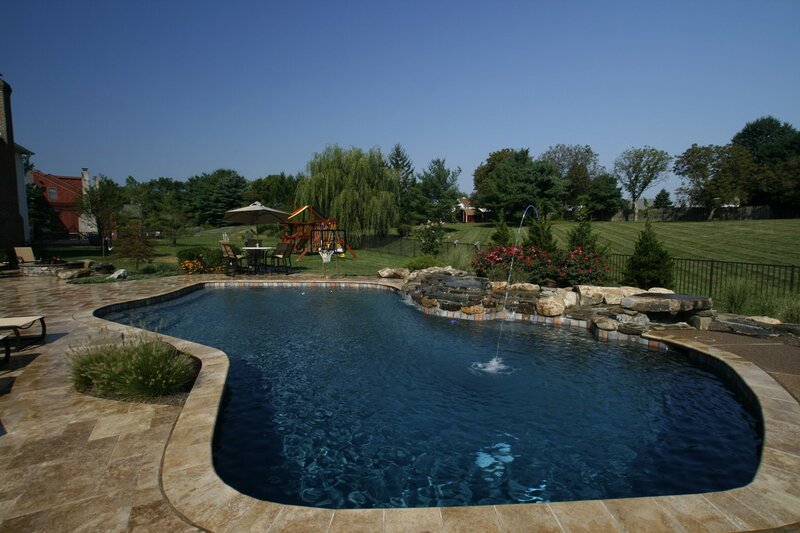 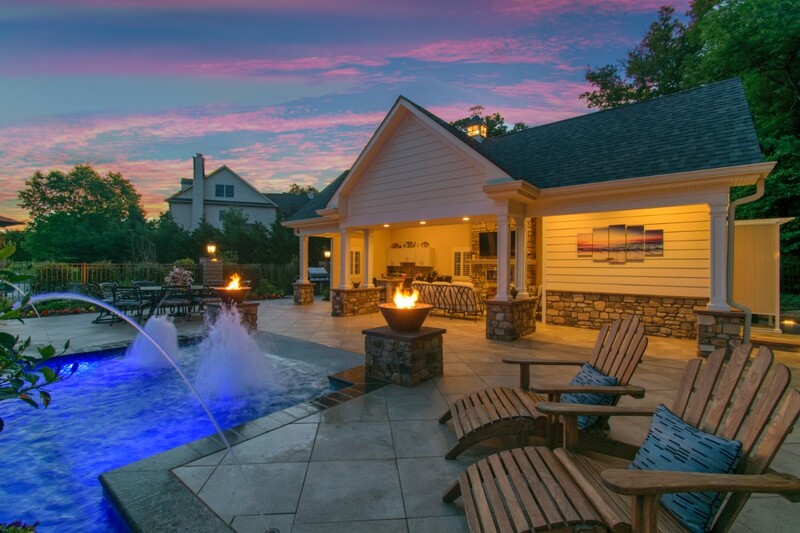 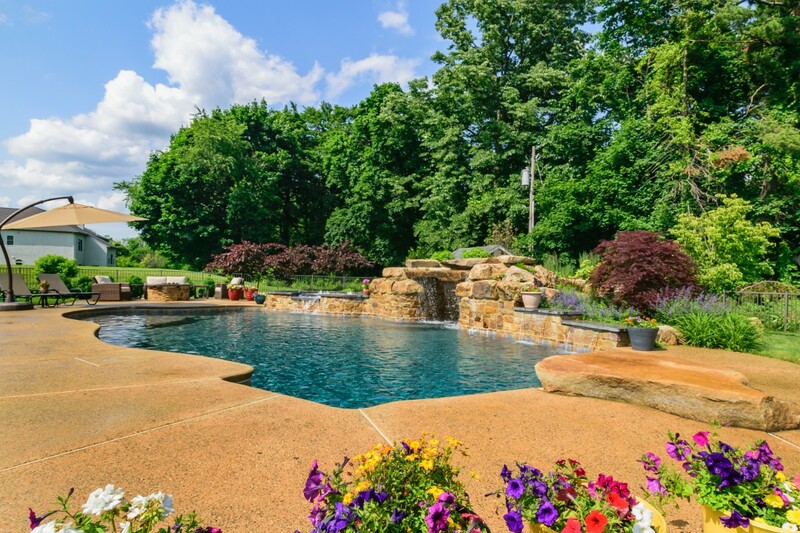 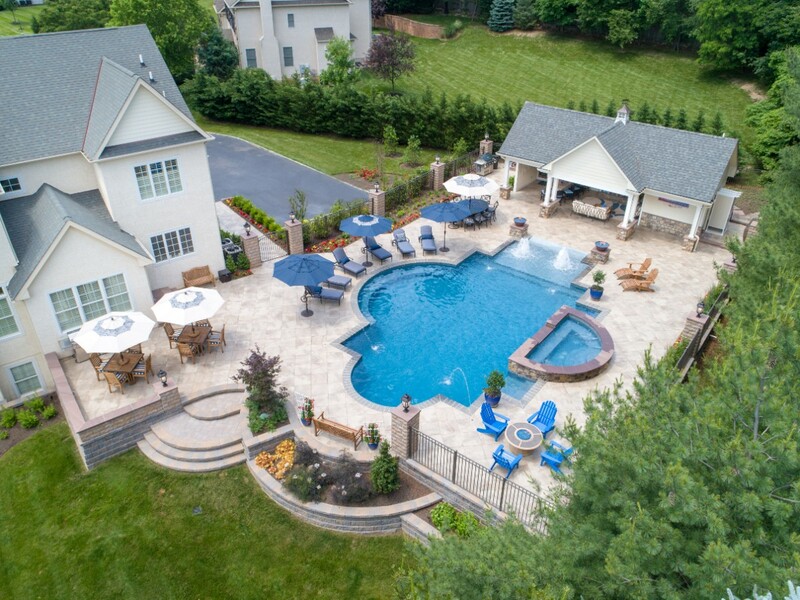 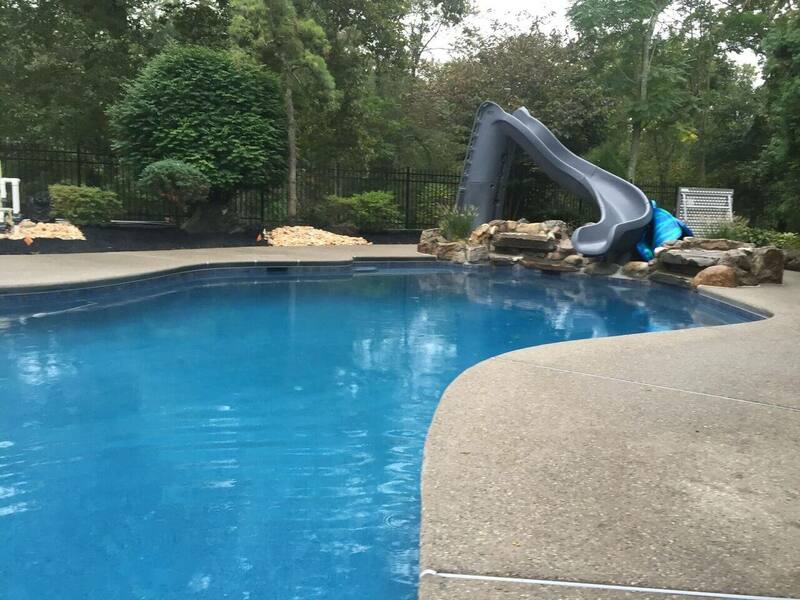 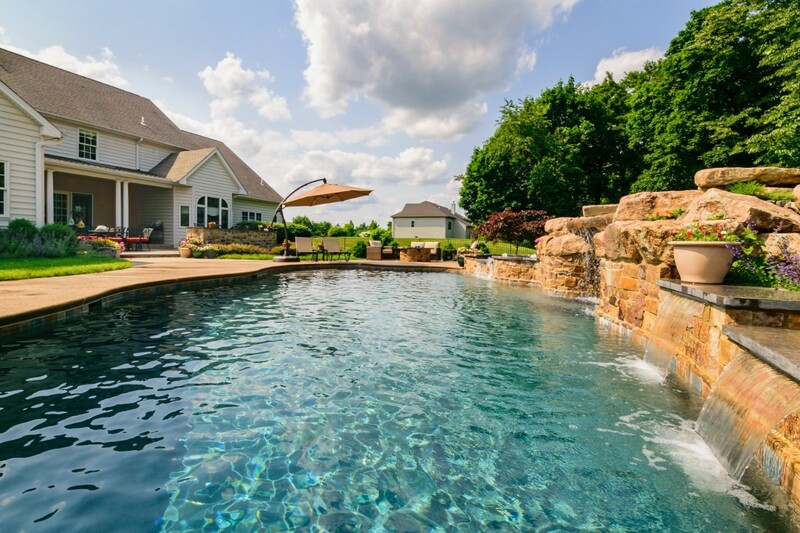 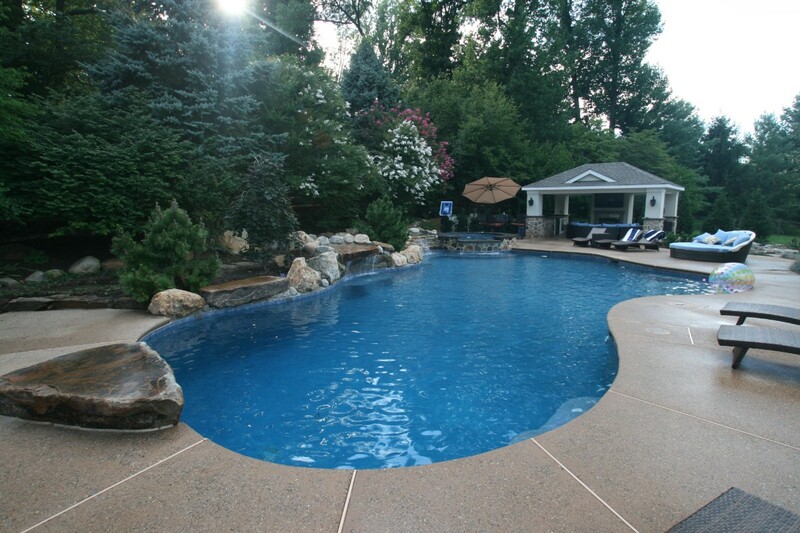 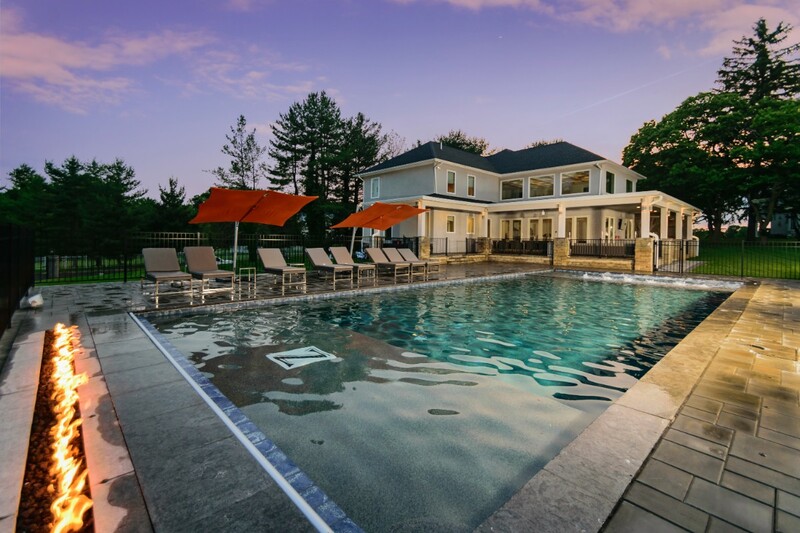 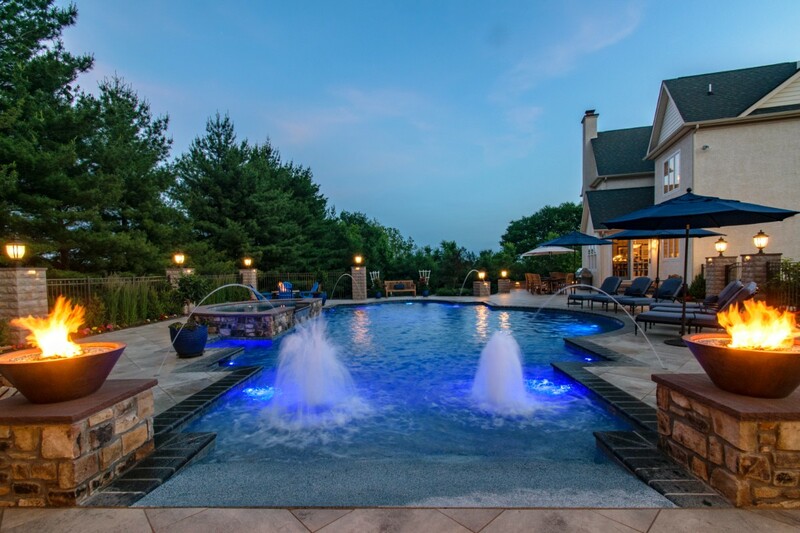 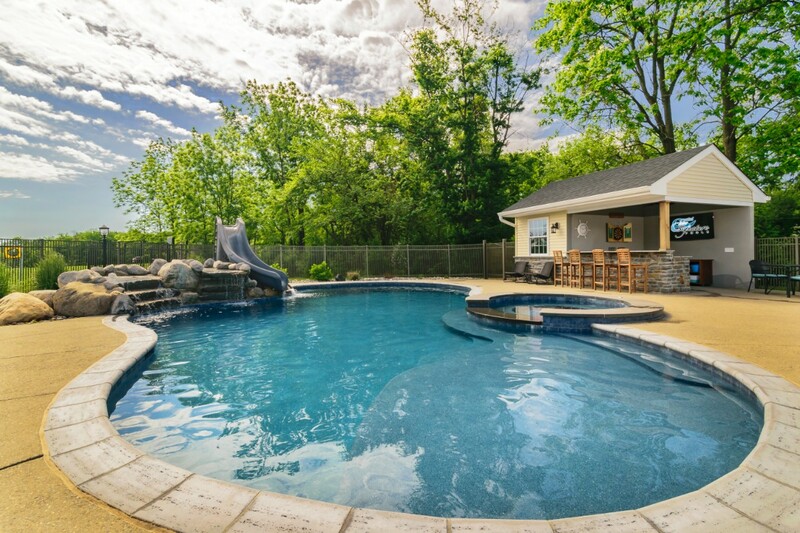 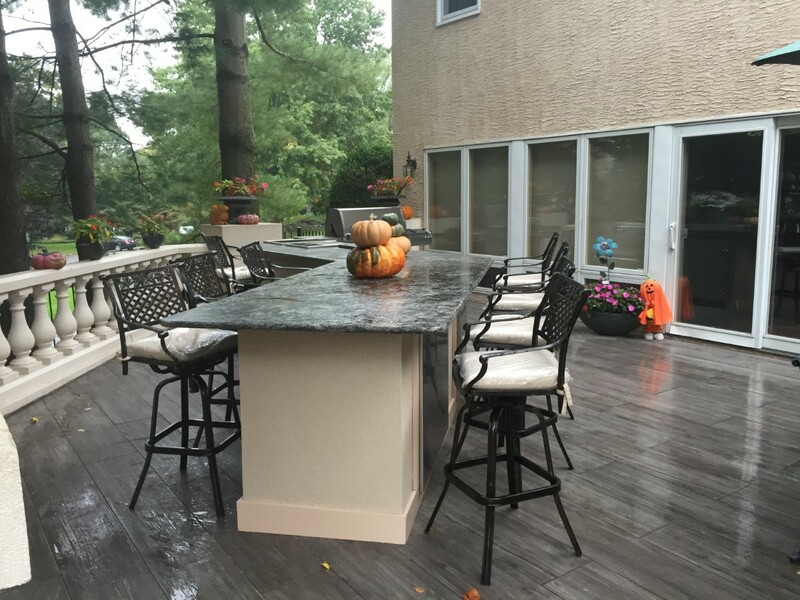 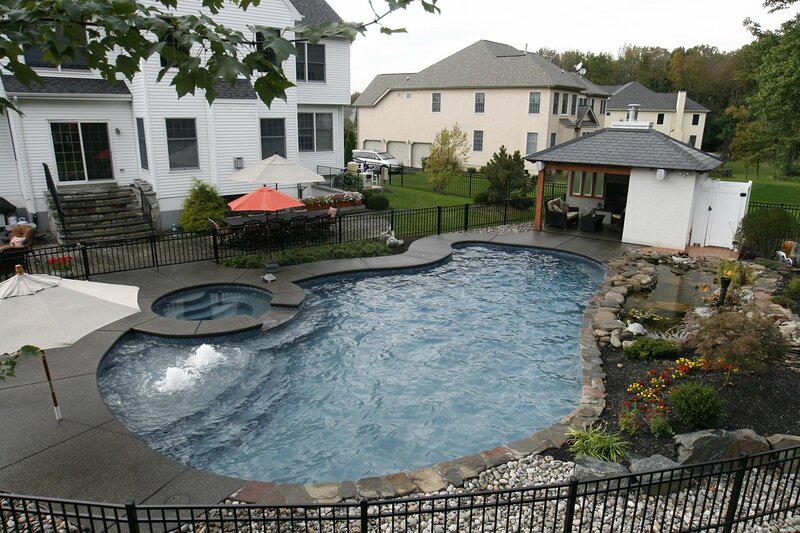 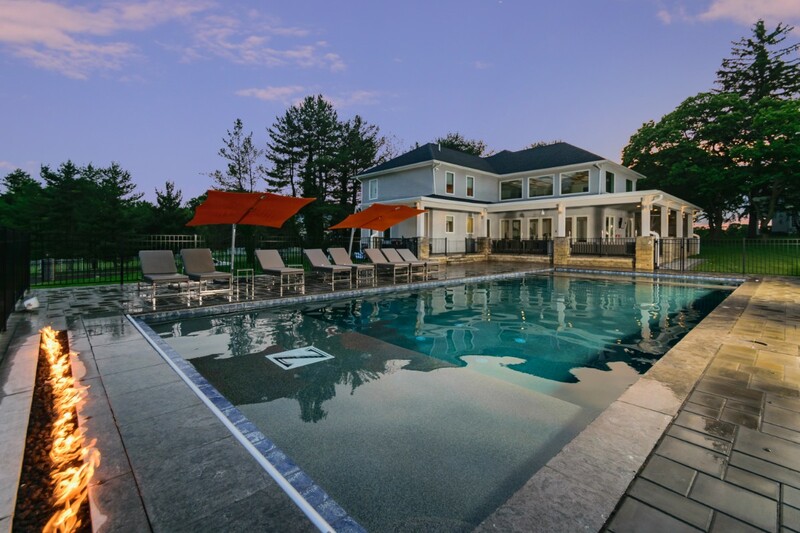 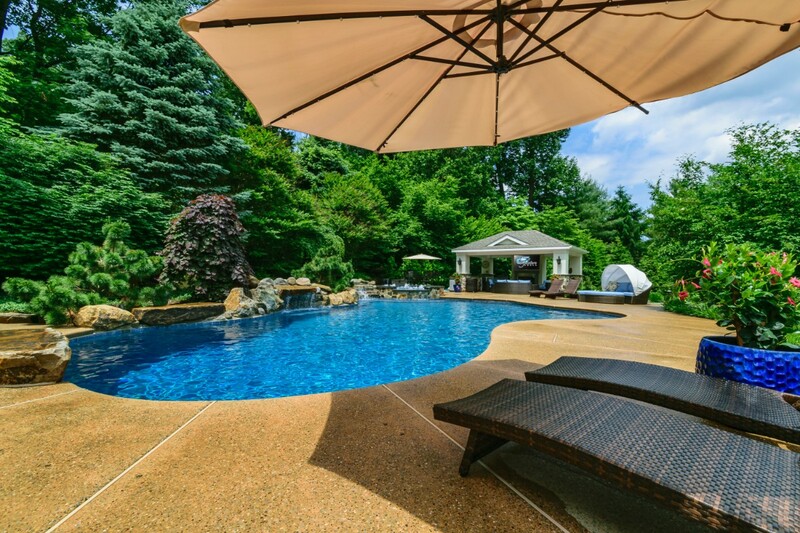 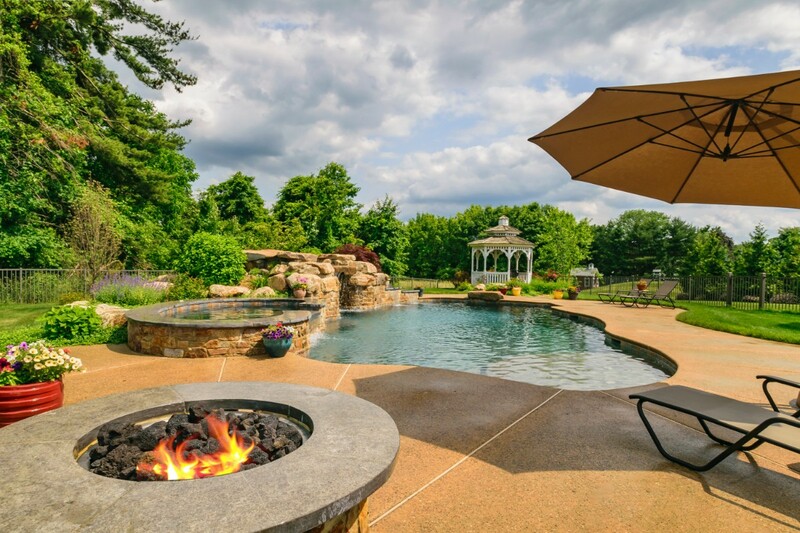 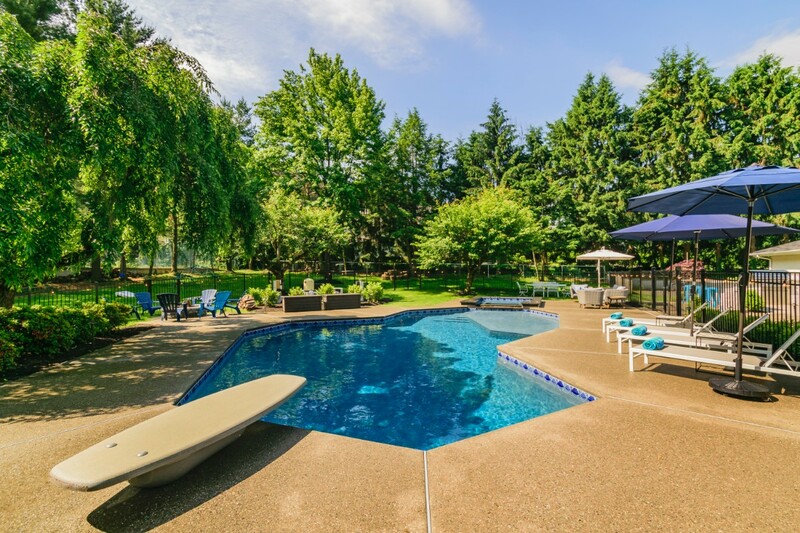 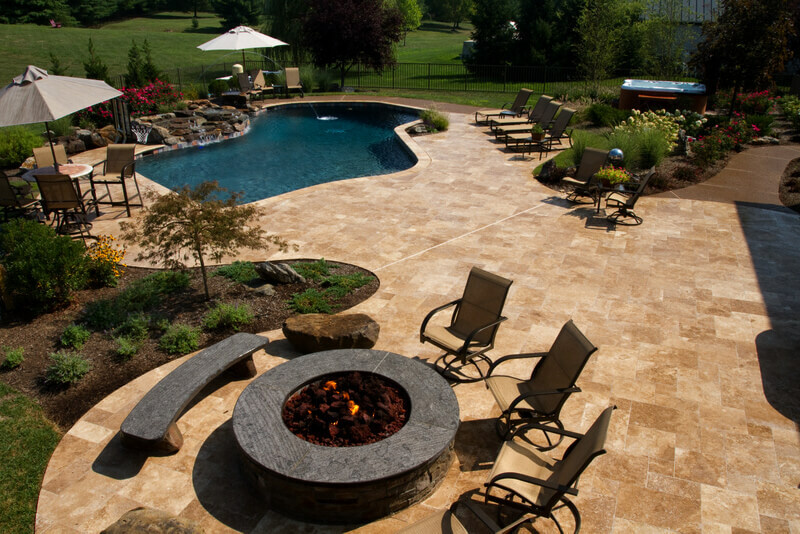 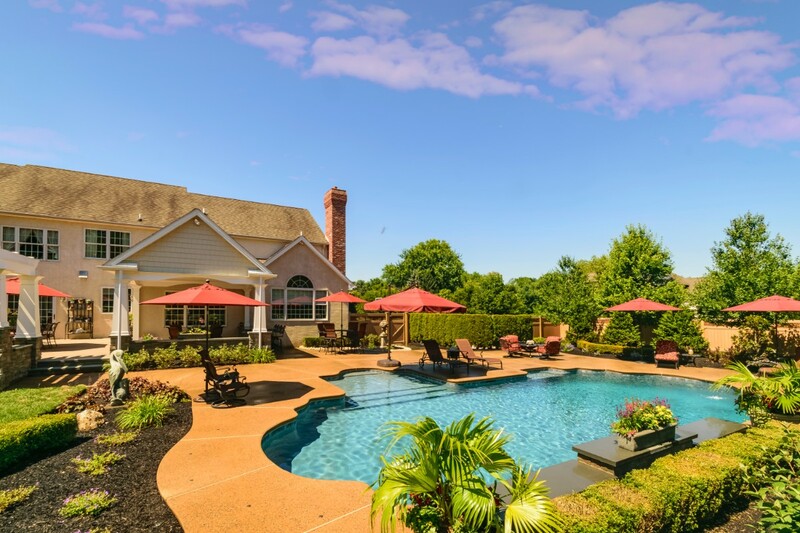 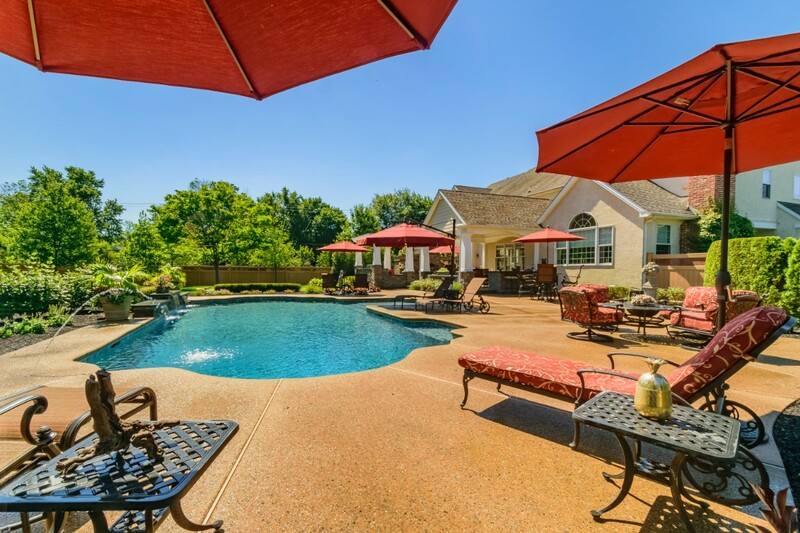 This newly renovated pool now showcases a raised spa, tanning ledge, and outdoor audio! 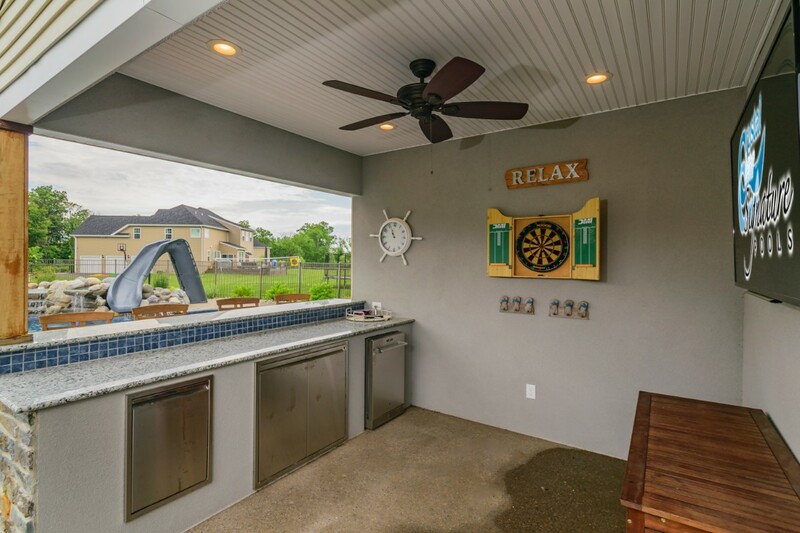 "Let's Party" focuses on the fun elements! 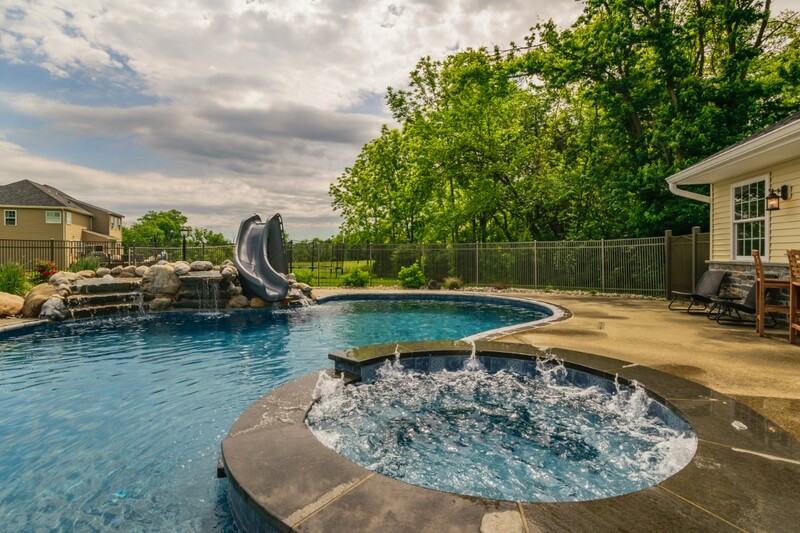 Enjoy the large tanning ledge while your friends and family soak in the raised spa, zoom down the slide, and relax by the water fall. 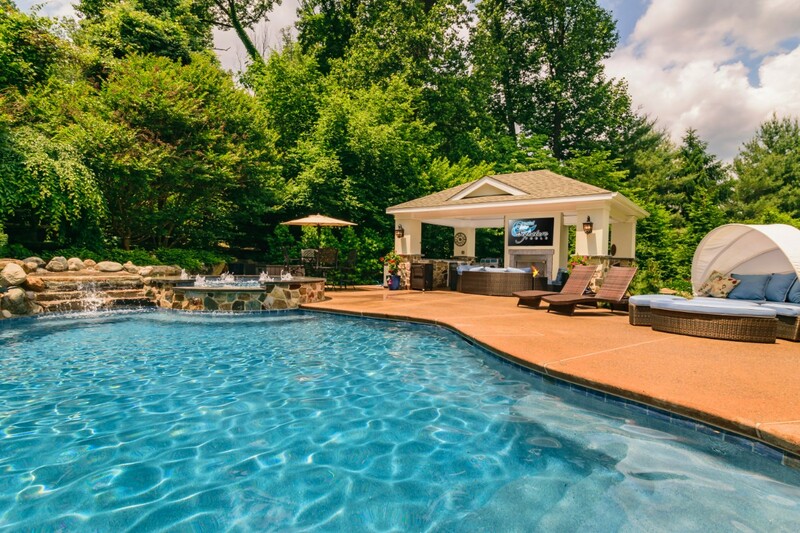 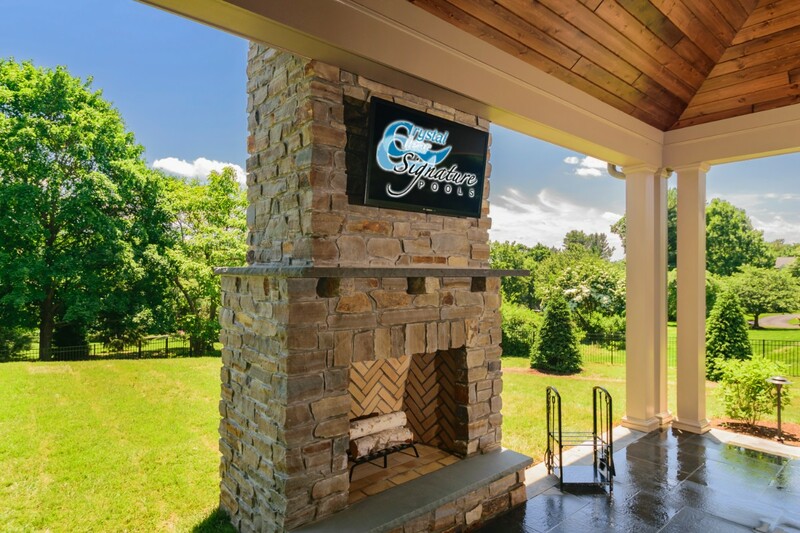 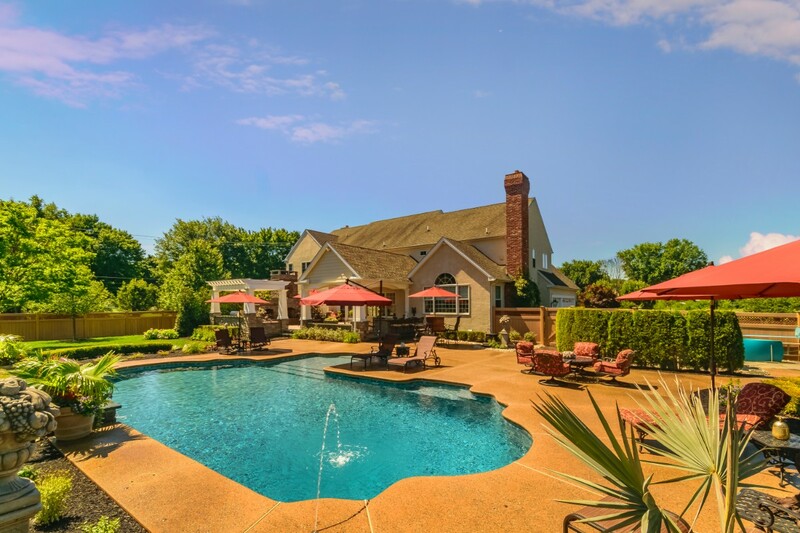 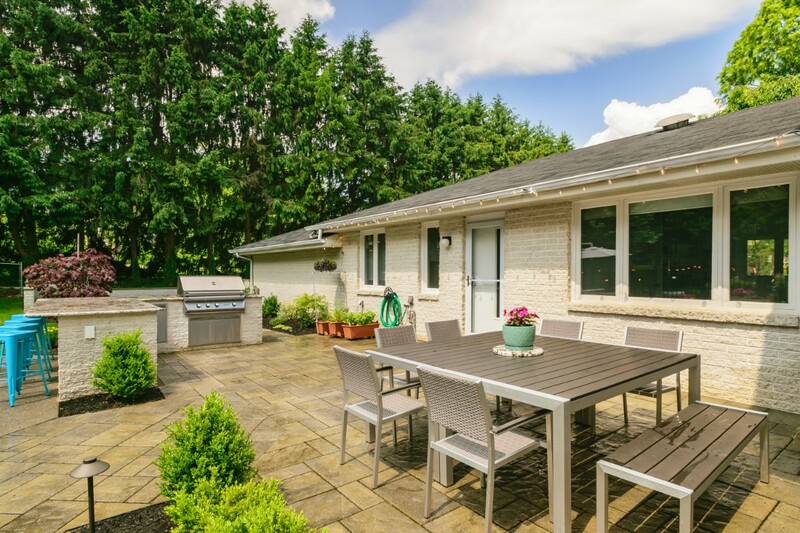 Outside of the pool and spa, you can dine by the pool house while enjoying a sporting event on the TV and listening to your favorite music on the outdoor audio. 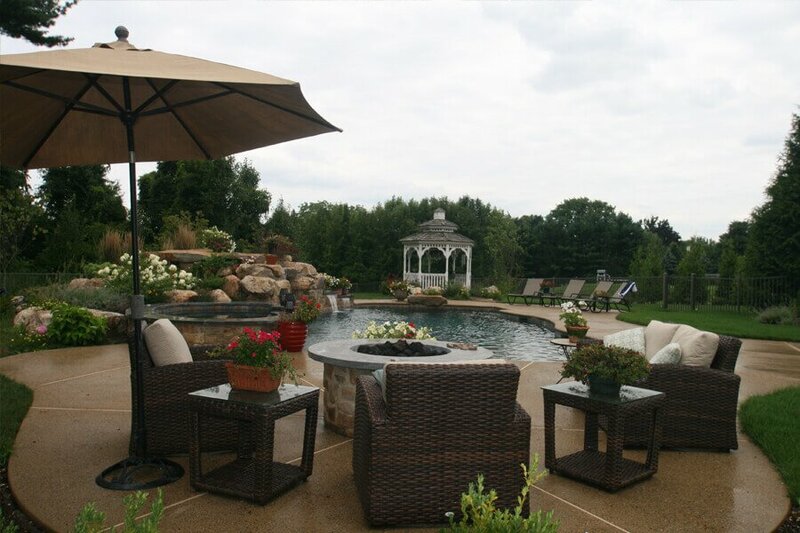 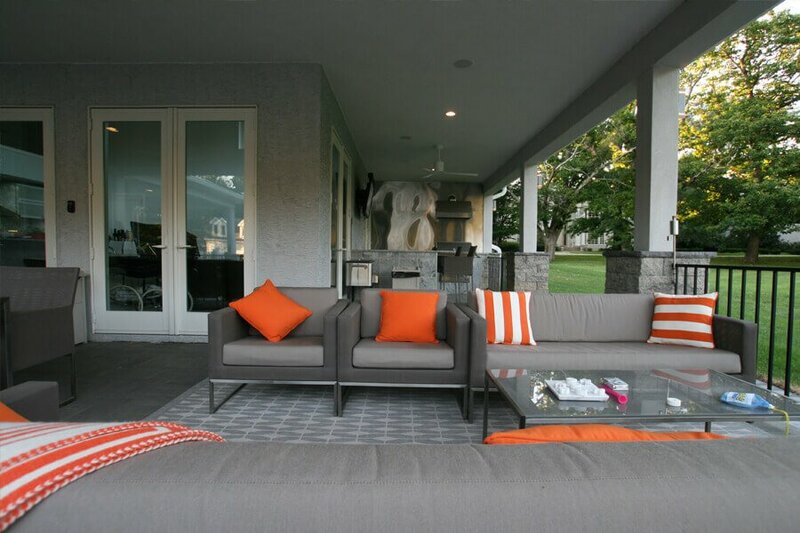 "Simple Elegance" creates a clean, formal backyard escape with features to be enjoyed throughout the seasons. 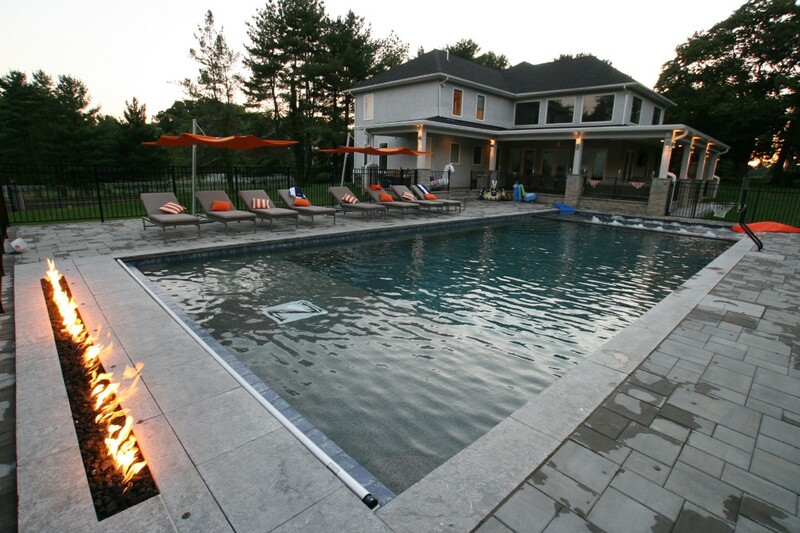 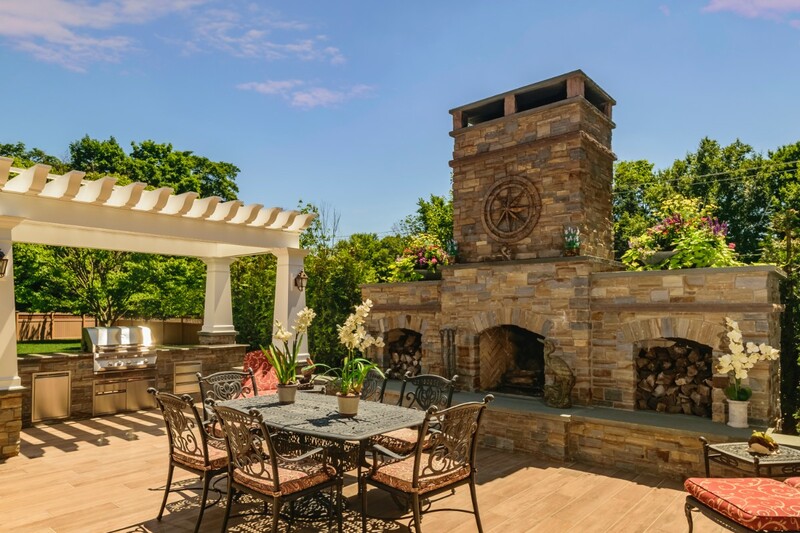 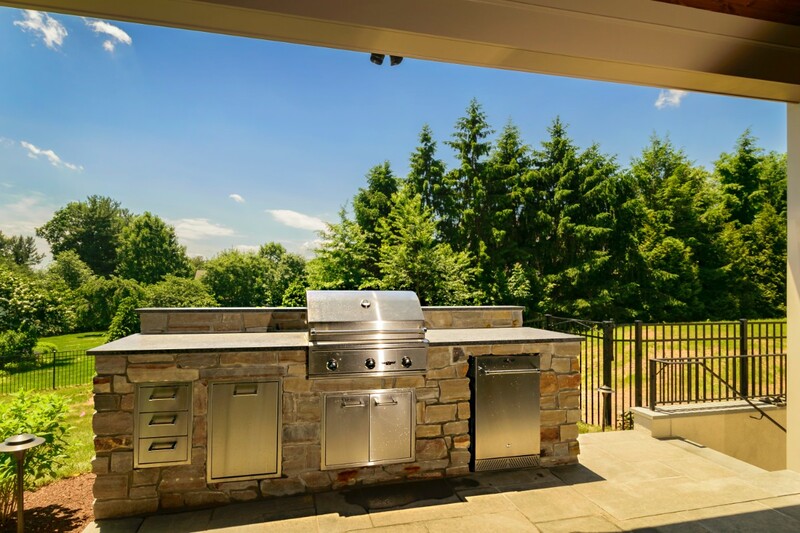 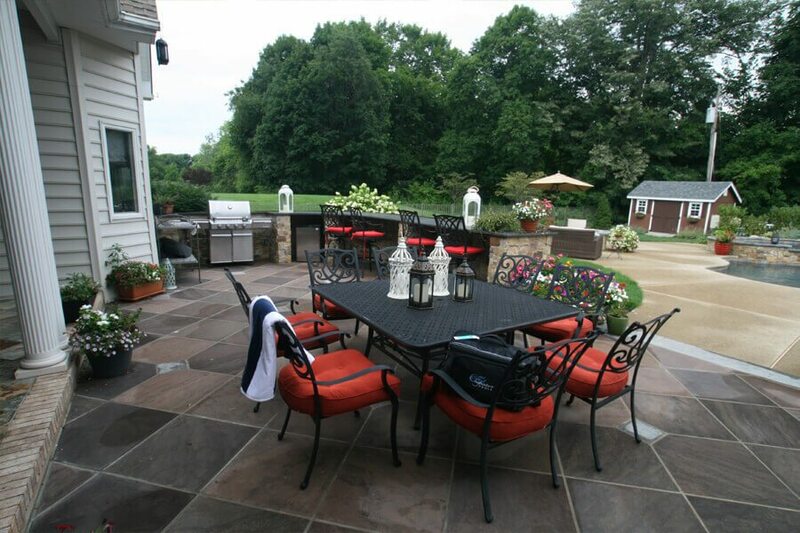 Outdoor dining in the spring, swim in the summer, and cozy up to the fire place in the cooler months! 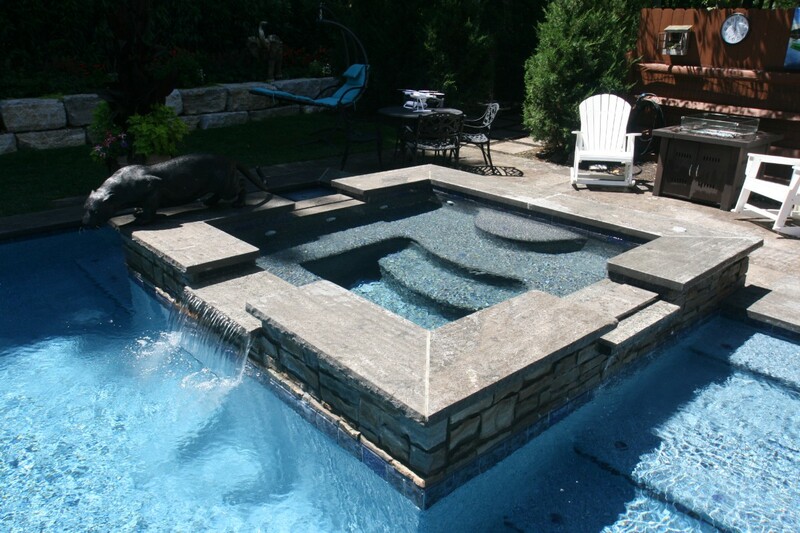 "Clean Lines" presents a fun and simple pool and spa combo for family and friends to enjoy. 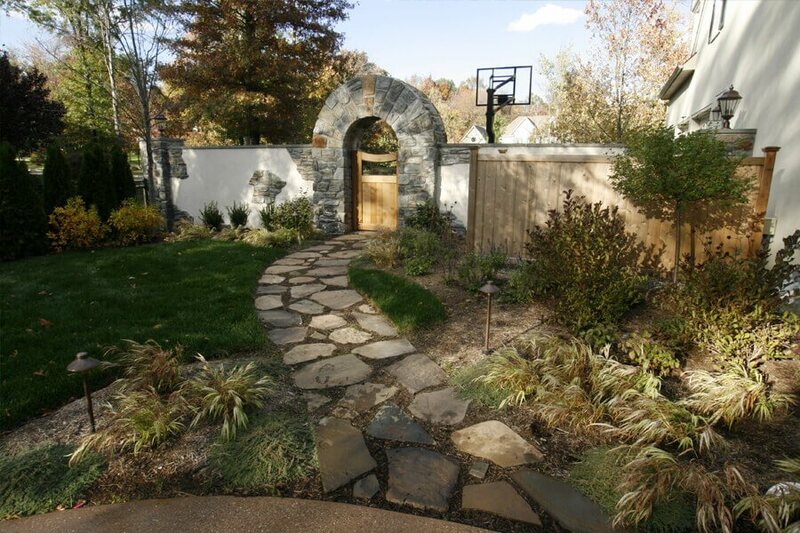 The clean lines blend in with the surrounding hardscape and simple landscape. 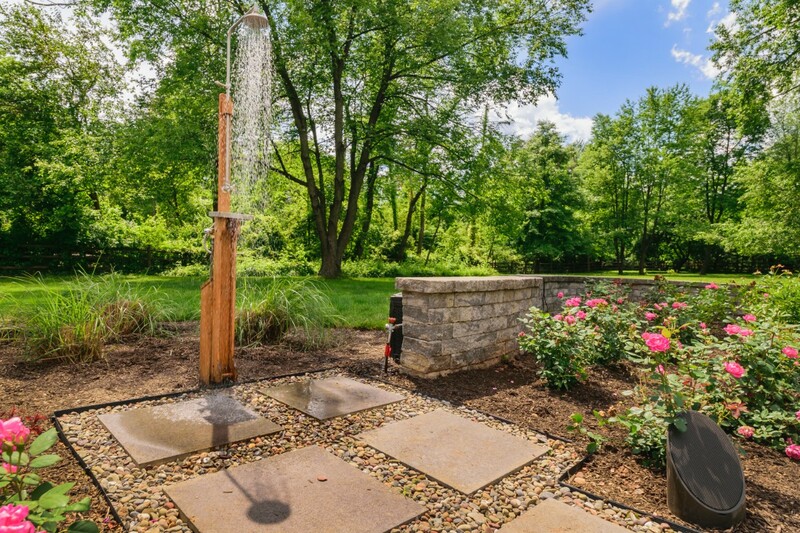 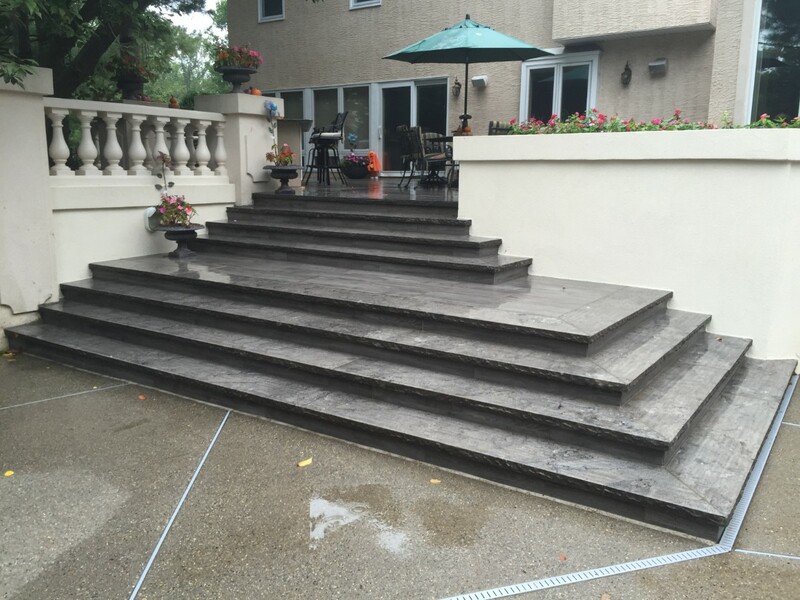 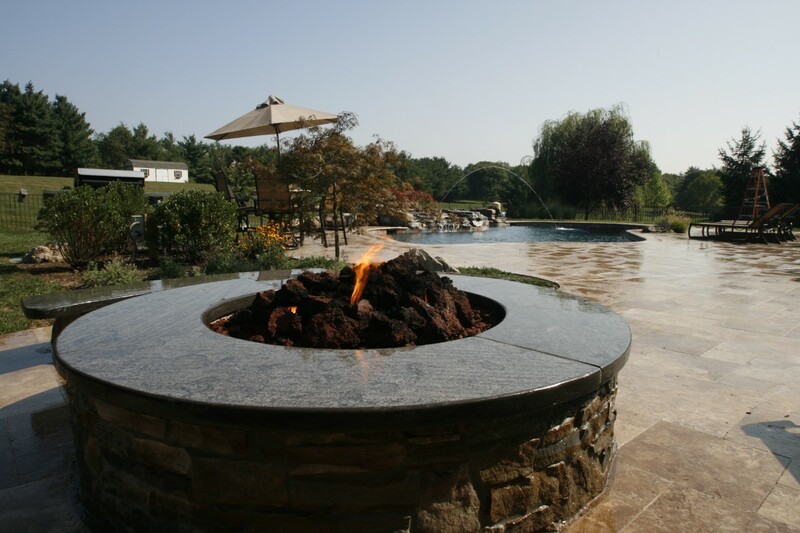 The water jets can dominate the space or provide some relaxing background sound while enjoying the fire place. 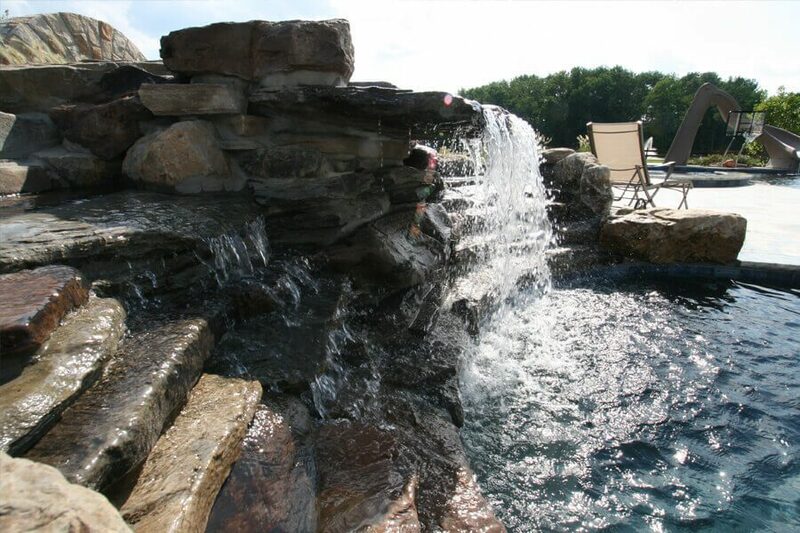 "Rockwall Waterfall" was designed a center piece grotto with large water wall. 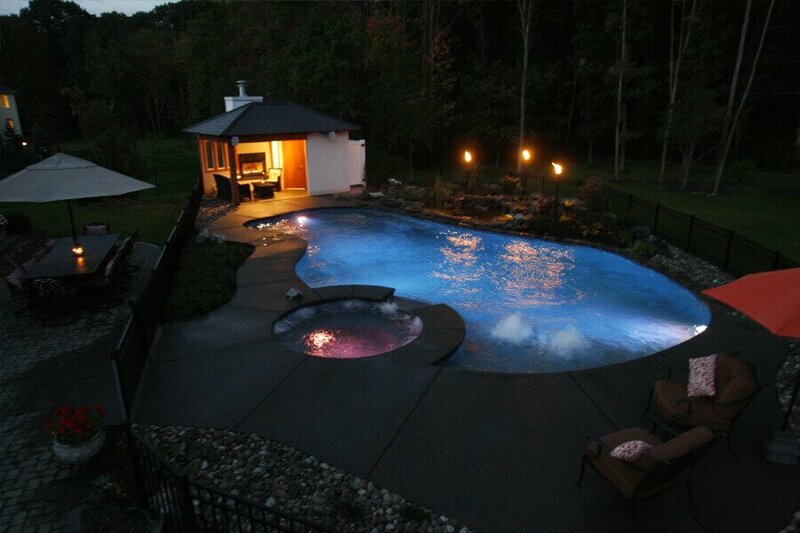 The grotto space provides a 'hide-away' from the rest of the pool space. 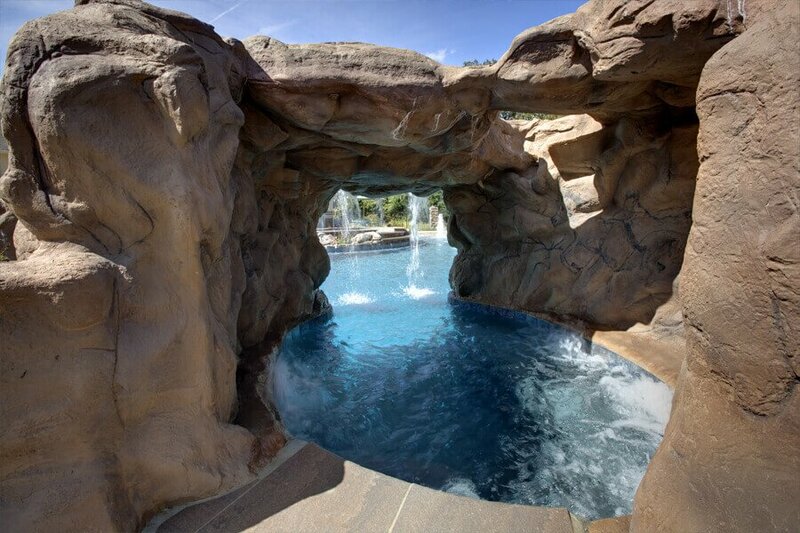 Along with the grotto, every day use includes a tanning ledge, large spa, dive rock, and much more. 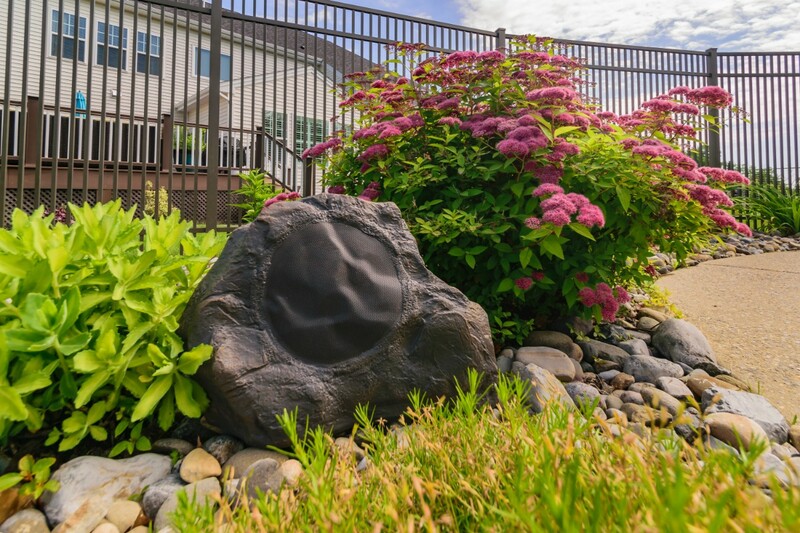 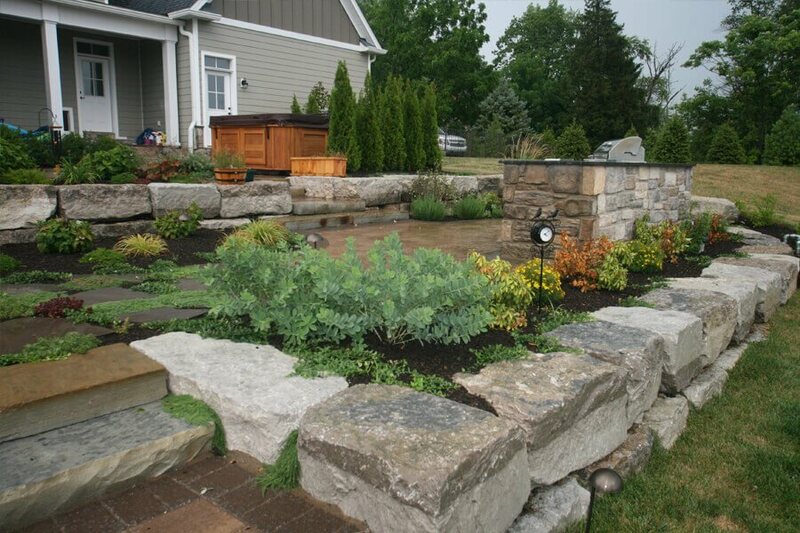 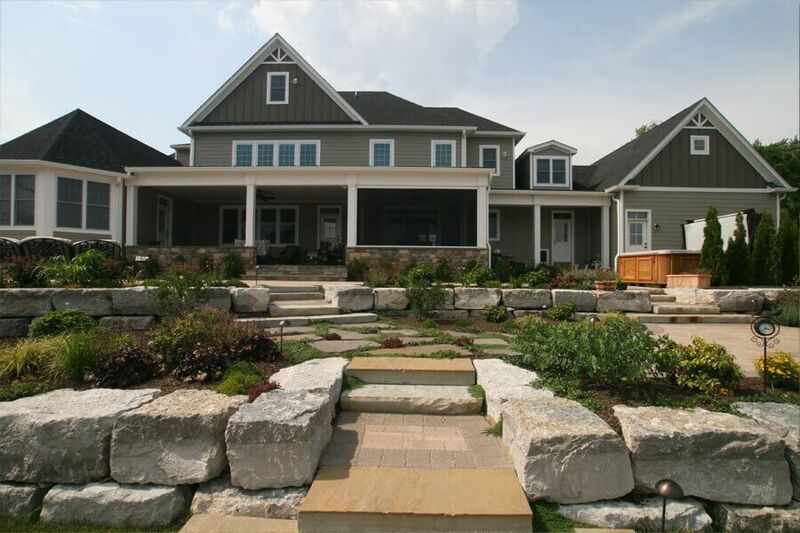 When designing "Rocky Terrain" it was important to focus on landscaping, function, and creating a resort like setting. 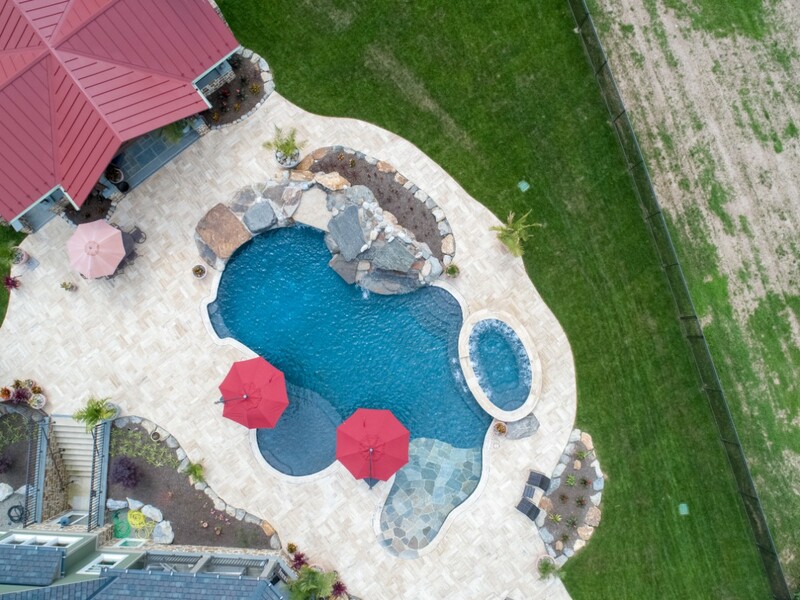 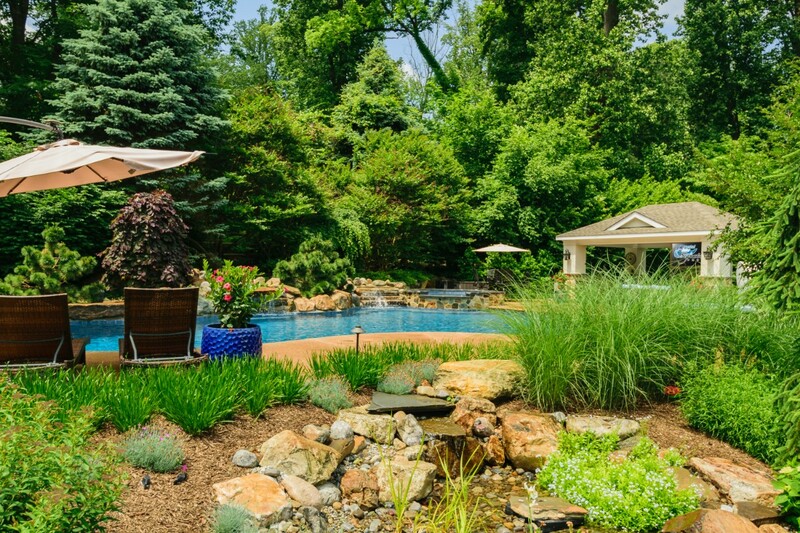 Crystal Clear Signature Pools created a backyard paradise to match the home owner's personality. 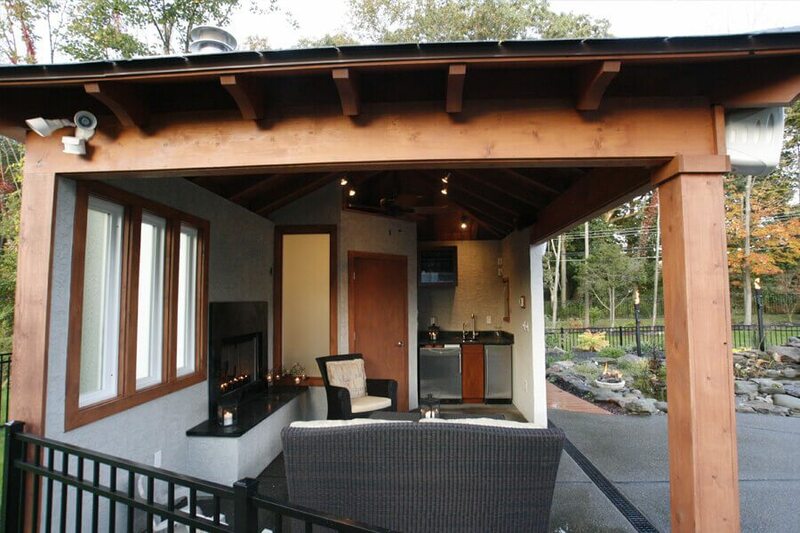 "Eas'Z' Street" is traditional and modern. 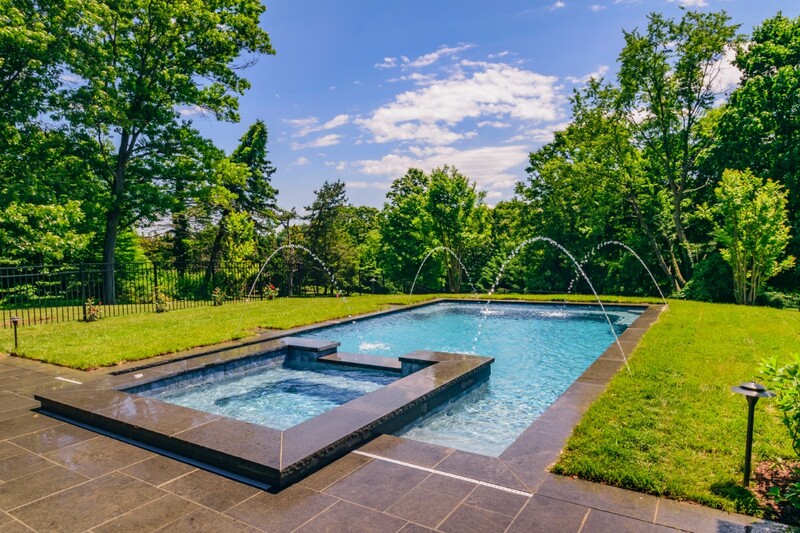 The large pool was designed with clean, functional lines to focus on views from the main house and pool house. 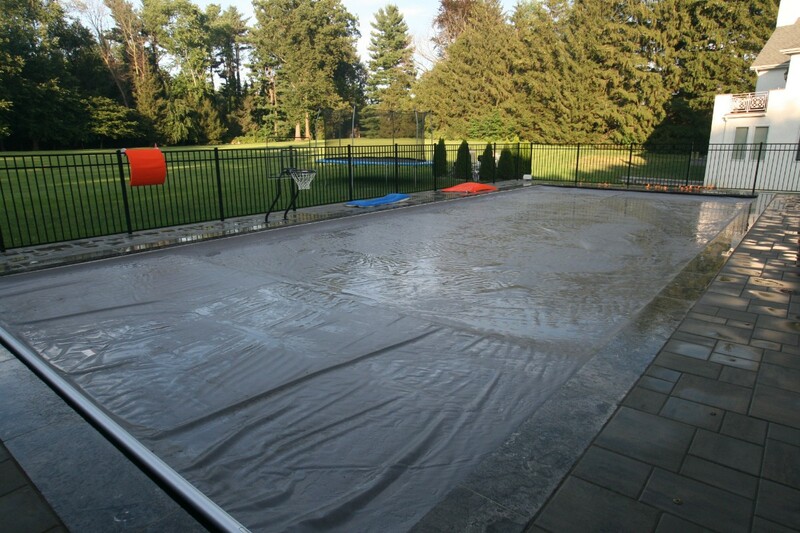 Including in the pool is a retractable automatic cover for safety. 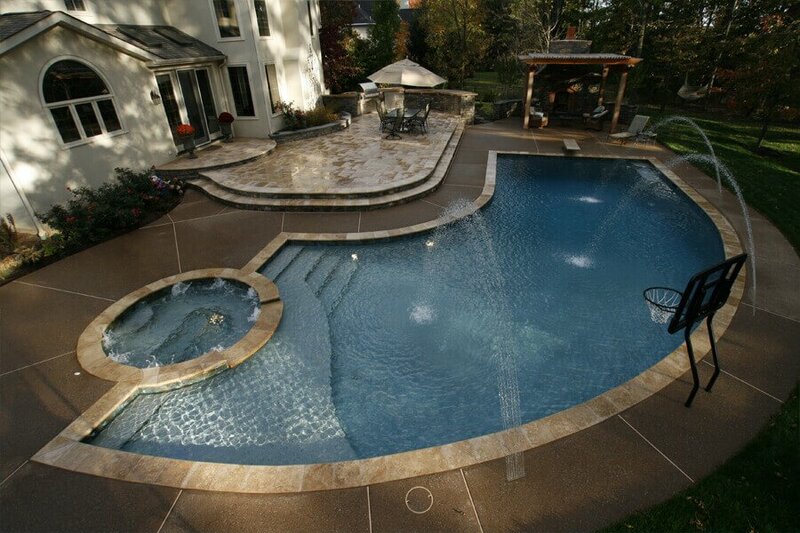 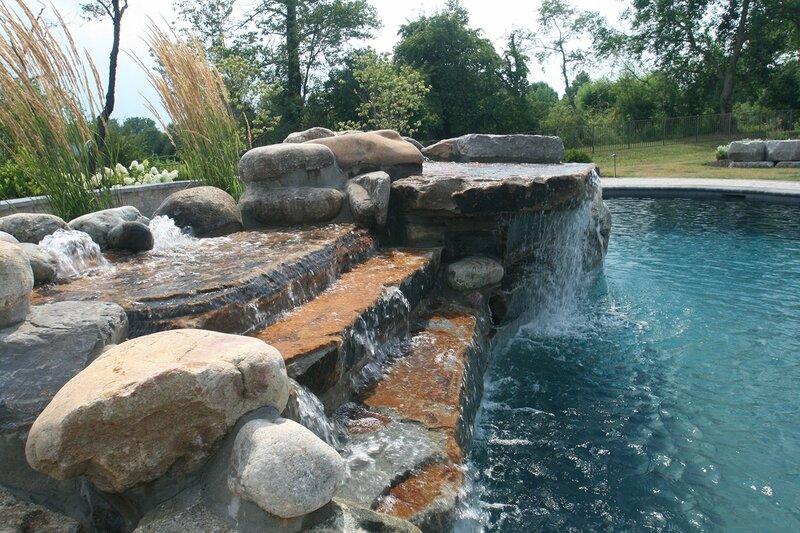 The pools main features are the large same level spa, deep end tanning ledge, and 16' linear fire pit. 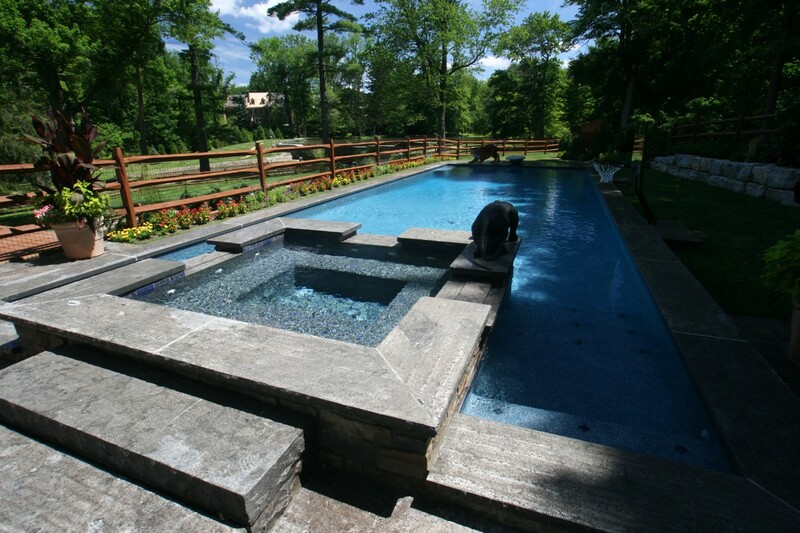 Crystal Clear Signature Pools took on the "Paradise Playground" project knowing it was going to be special. 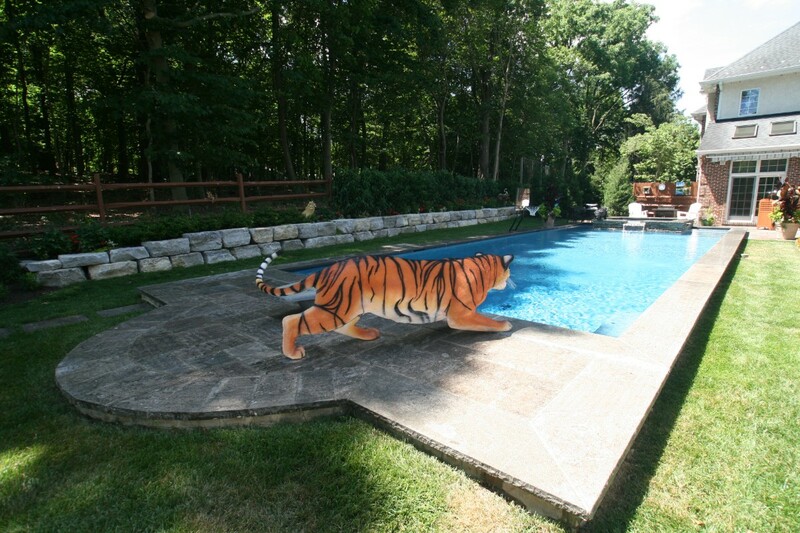 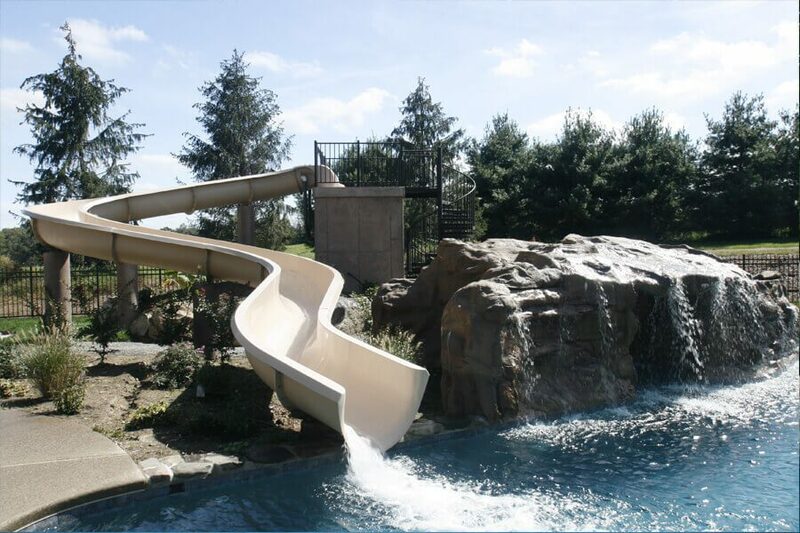 Our customer wanted something unique where their kids could enjoy a safe and fun pool. 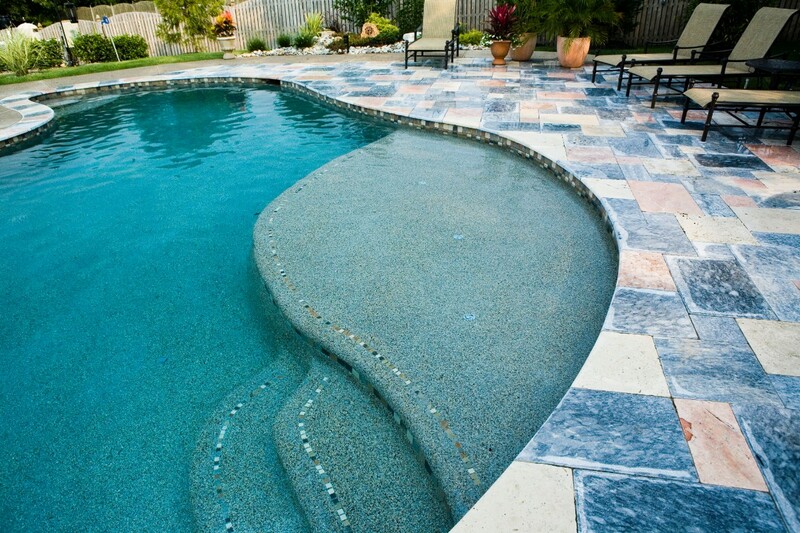 This pool was designed with not only the kids in mind but the whole family. 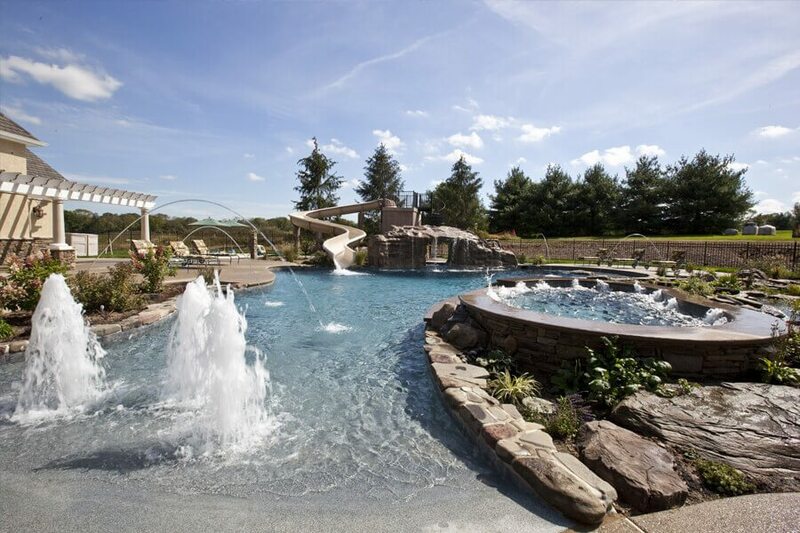 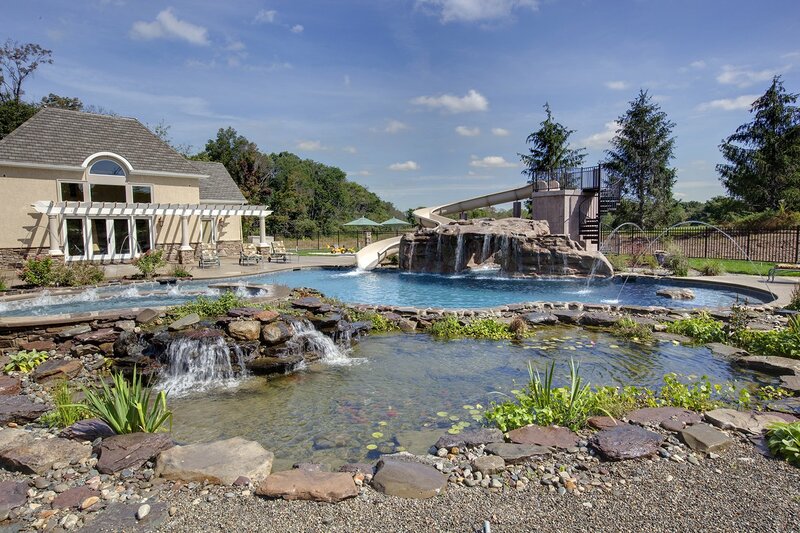 From the grotto cave, to the 12 person raised spa, to the slide where both kids and adults can have fun; this pool is the complete family fun package. 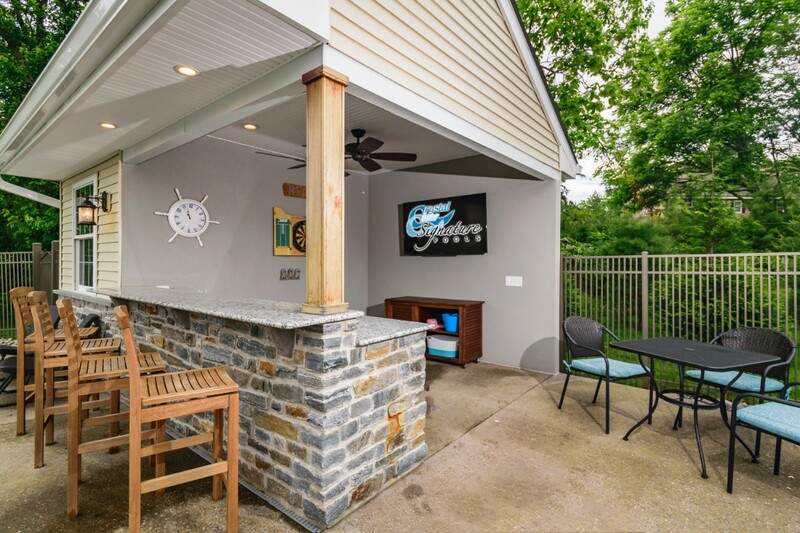 "Business in the Front, Party in the Back" is very unique. 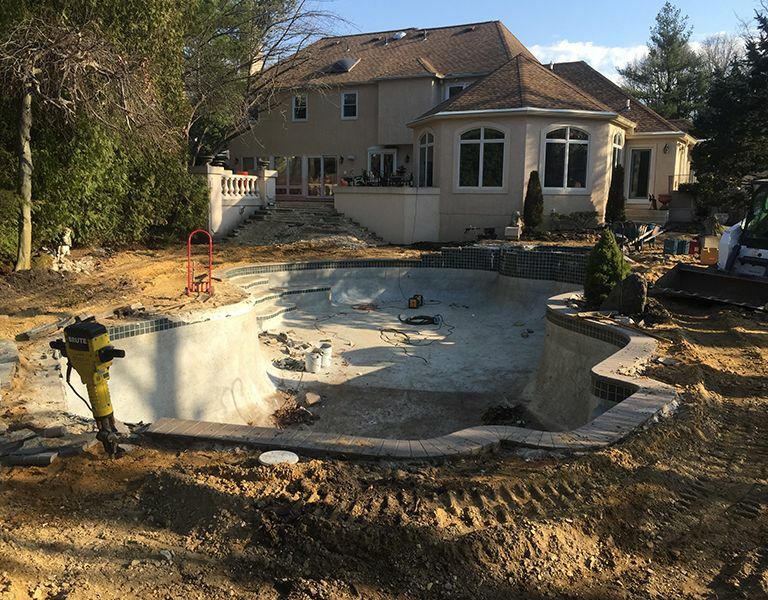 The project includes two pools with two separate systems that allows for dual temperature setting for an adult and kids pool. 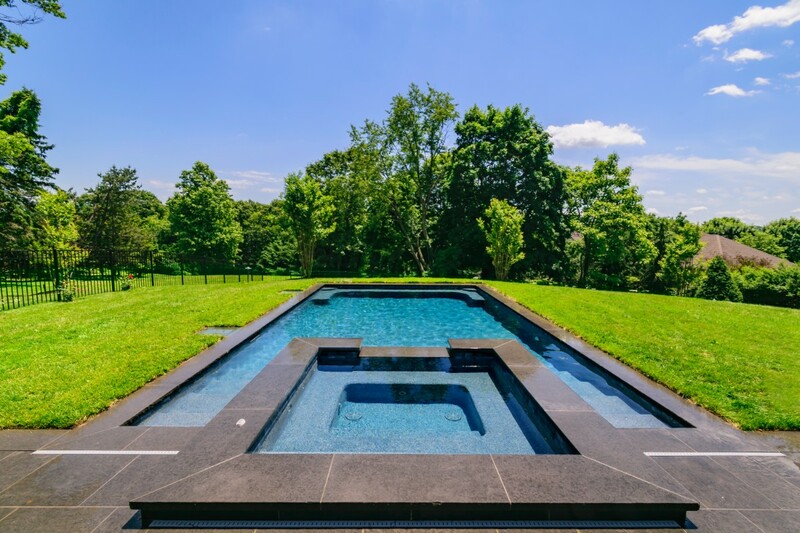 As with all of our projects, Crystal Clear Signature Pools created a personalized space with the home owner's wants and needs in mind while maintaining a functional space. 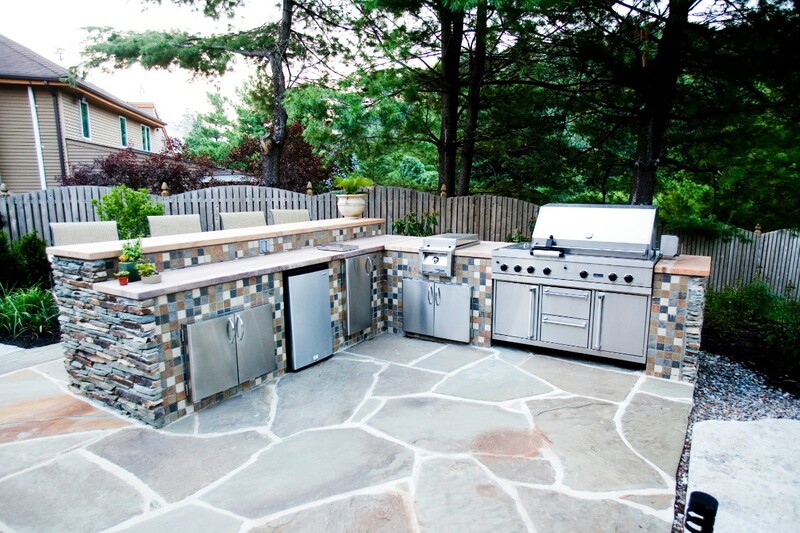 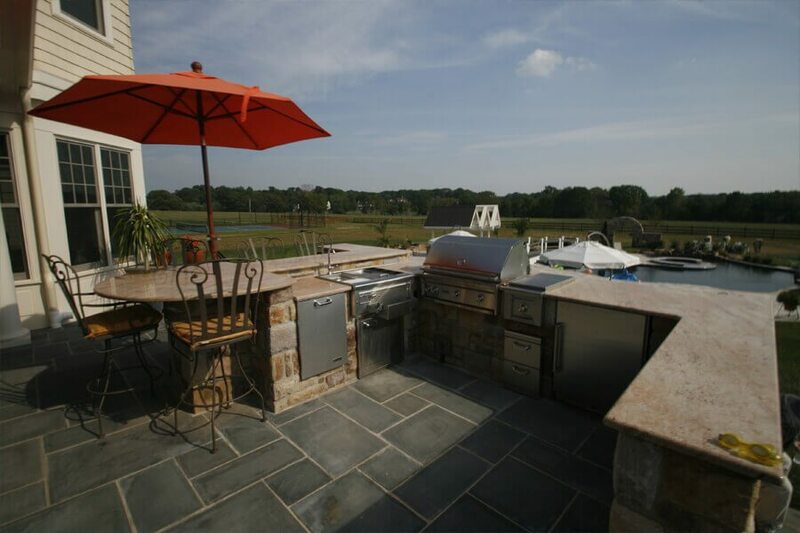 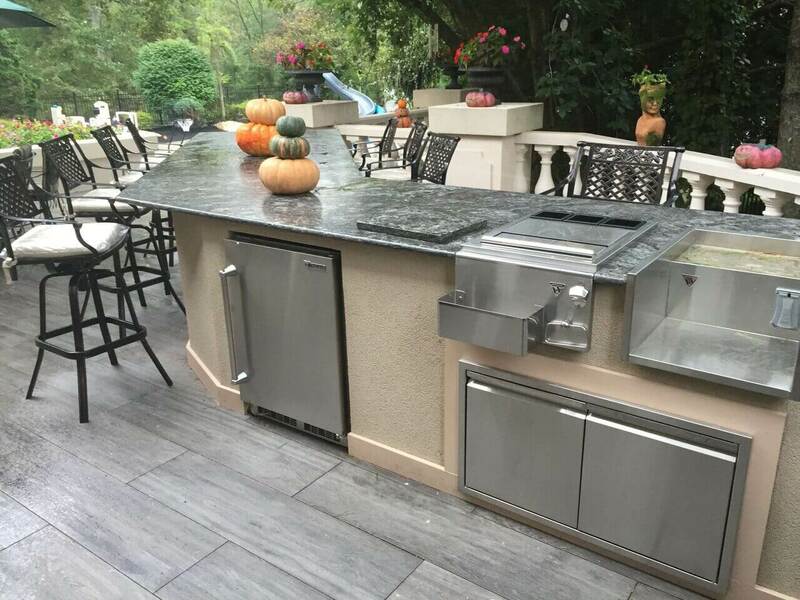 Along with the pools, the project also included an outdoor kitchen, man-made pond, and tennis court. 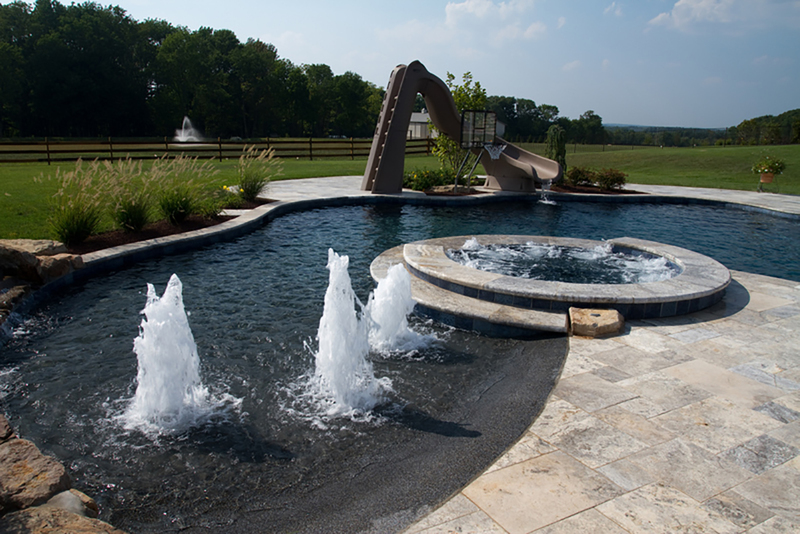 "Kidney Shape Escape" is simple, elegant, and has a big impact. 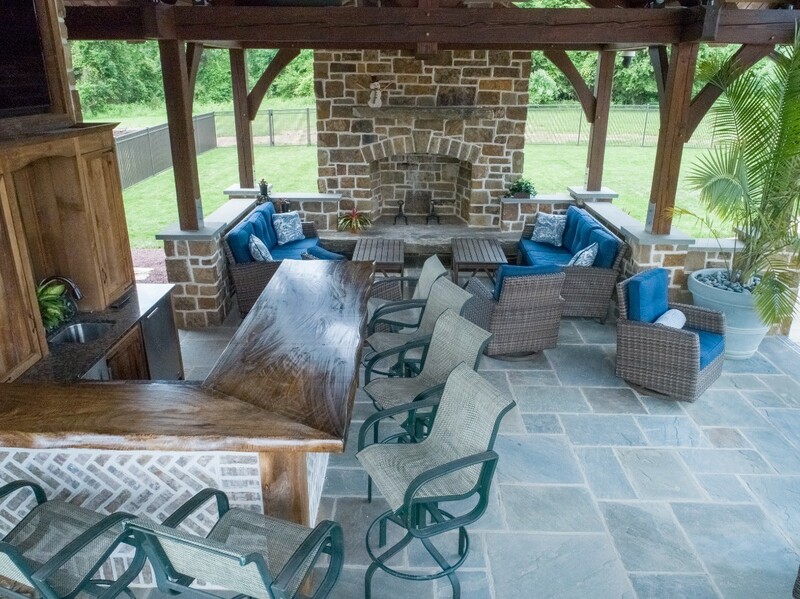 The space is fantastic for the family and entertaining guests. 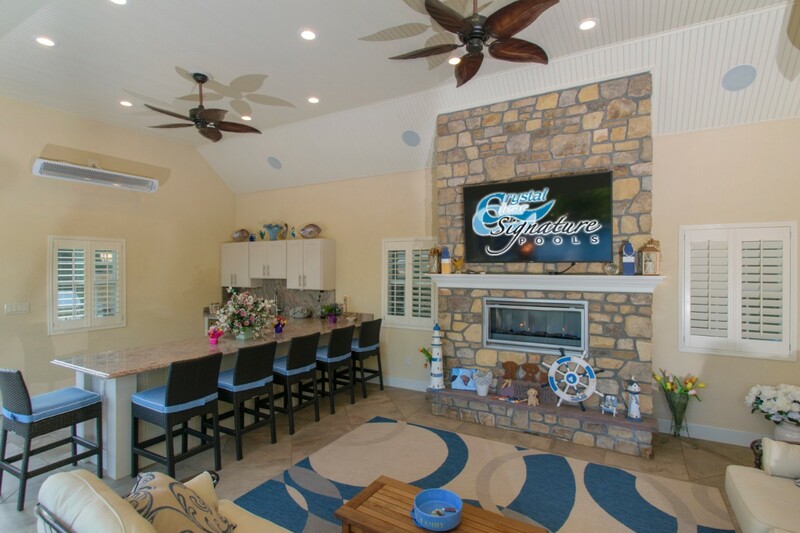 "Beachy Getaway" has a very homey decorative feel. 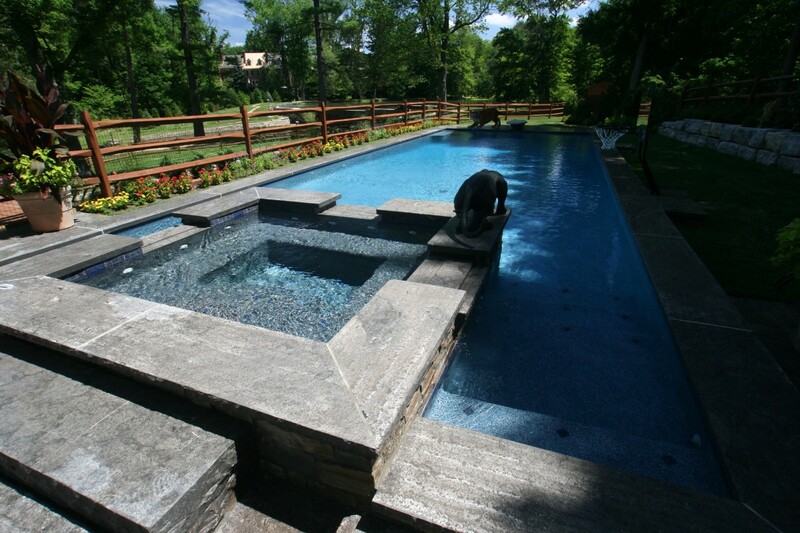 Landscaping and hardscaping all done by Crystal Clear Signature Pools make this pool complete. 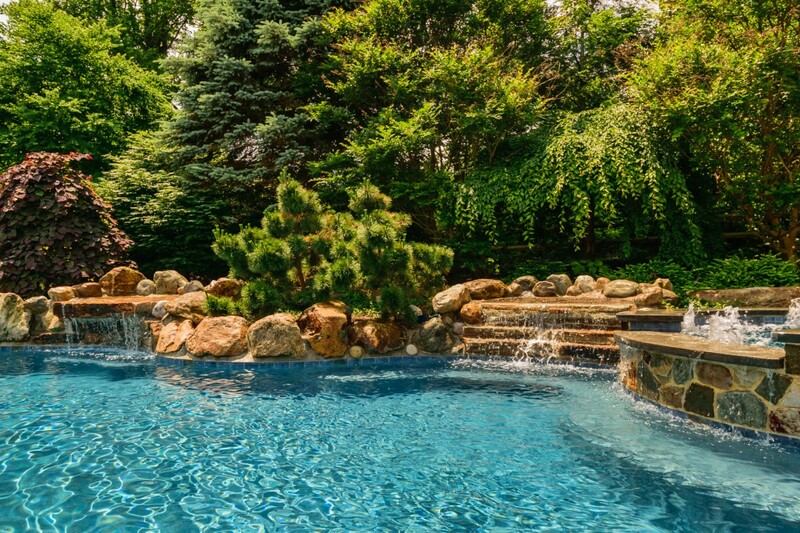 This pool reminds you of a backyard paradise, a getaway at home. 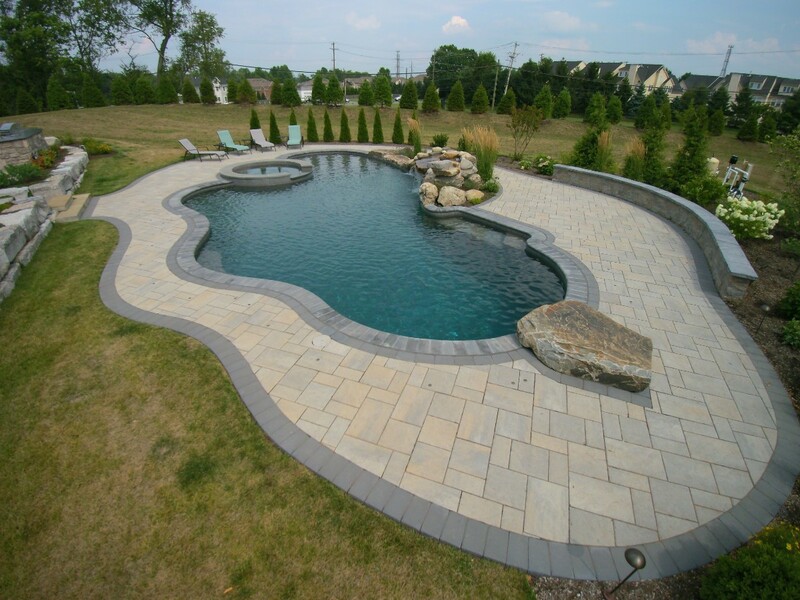 "Fun with a Curve" is the definition of simple elegance. 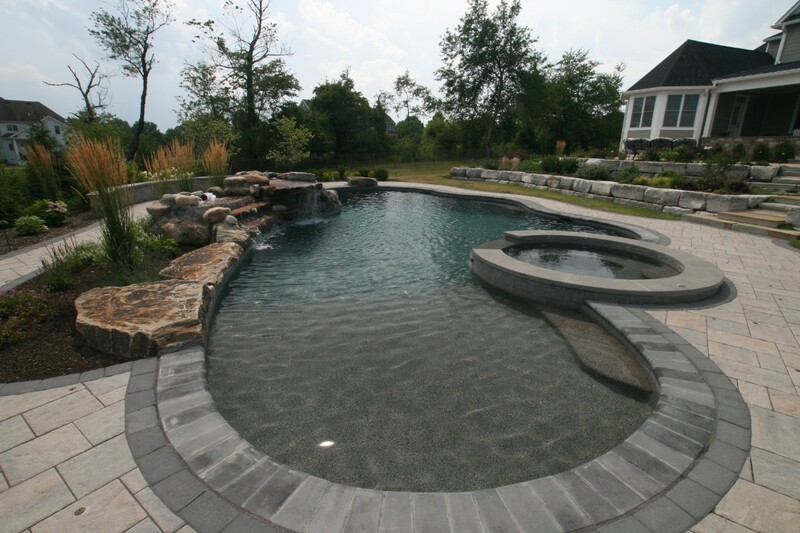 This curvilinear pool allows you to take advantage of the confined space in your back yard while following the dominant architectural lines. 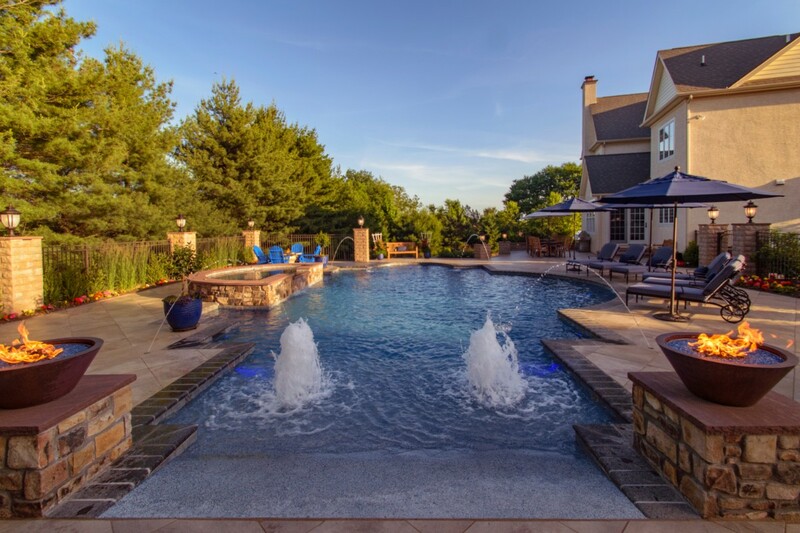 The pool design works well with a smaller yards and creates a back yard atmosphere for entertaining guests or a relaxing night for two. 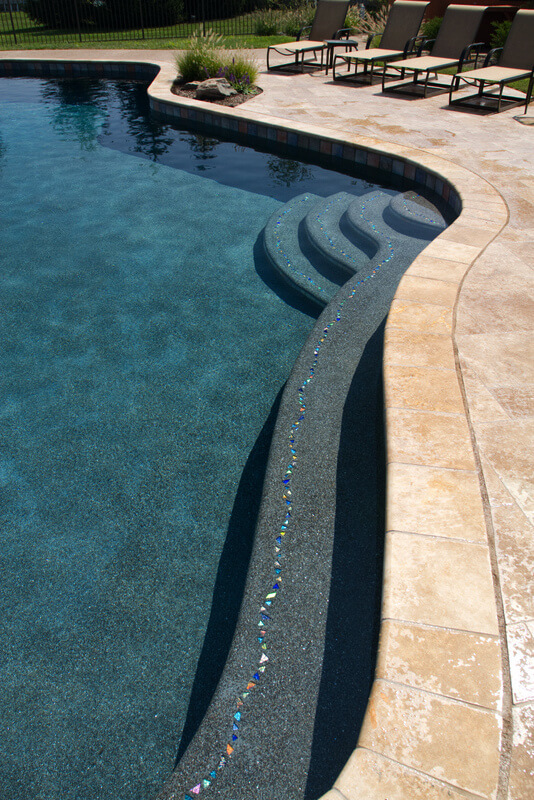 "Blue Beauty" is a traditional pool with simple features. 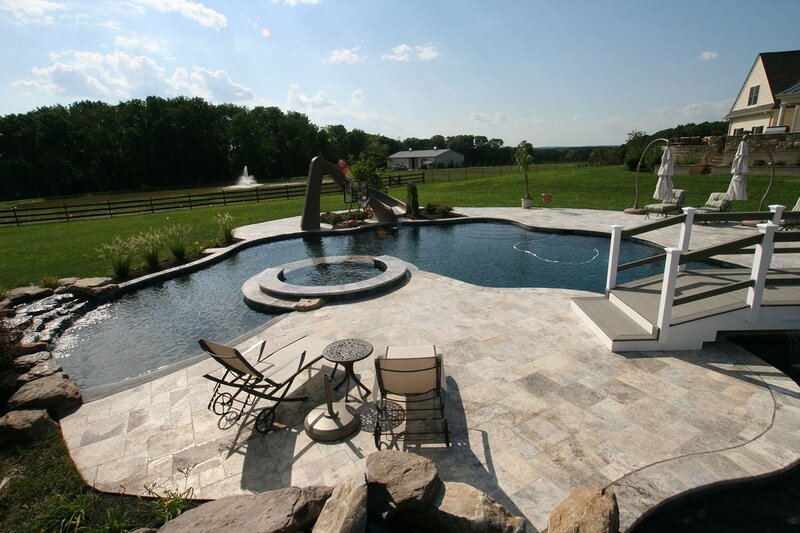 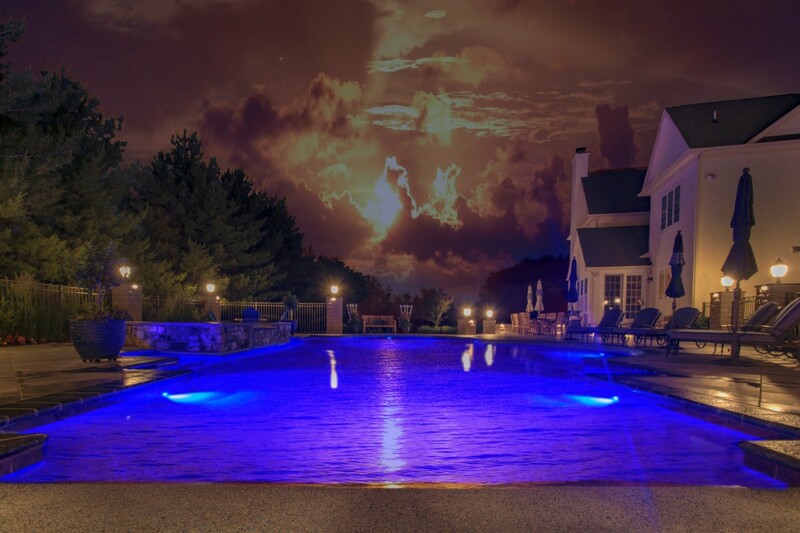 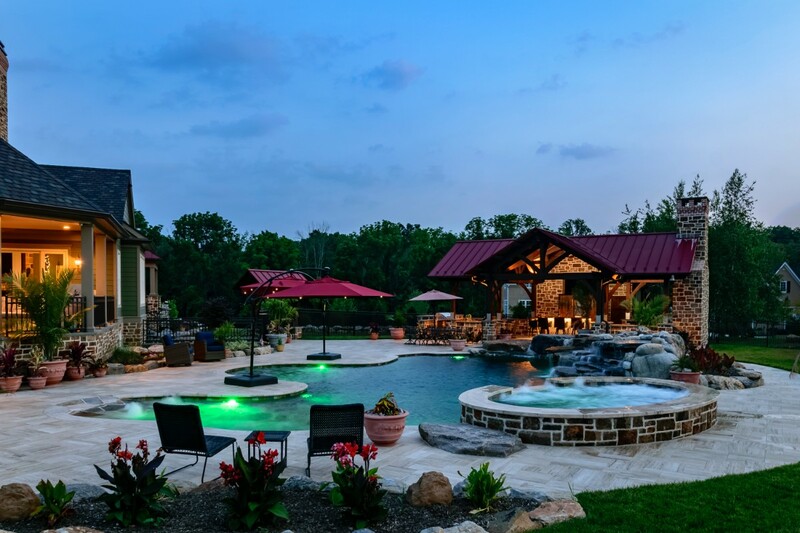 The objective of this project was to create a functional pool with aesthetic value throughout the entire year. 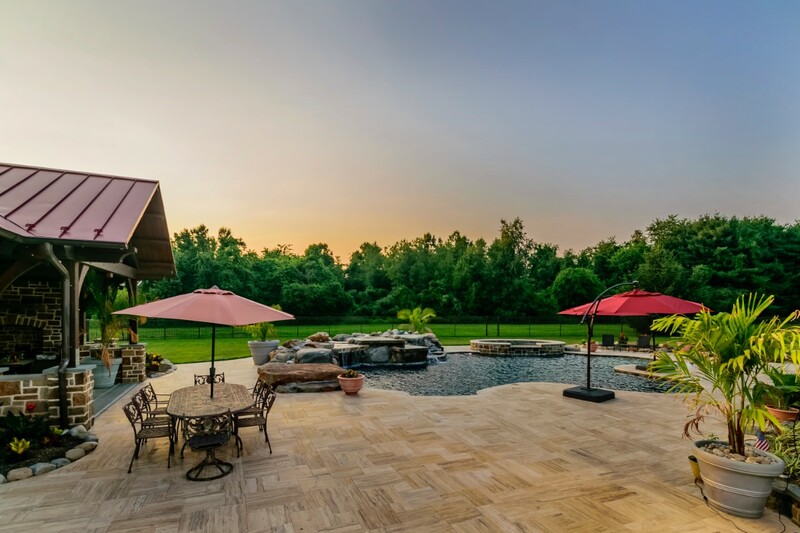 The views from the home are spectacular and elegant. 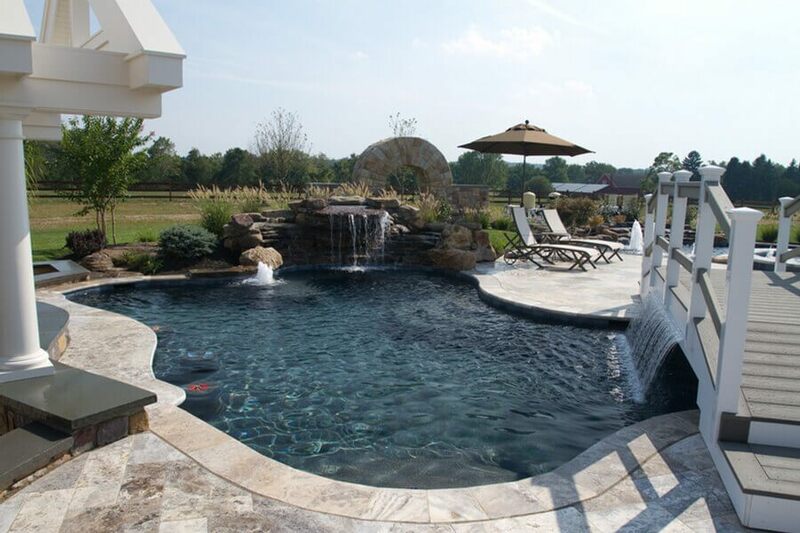 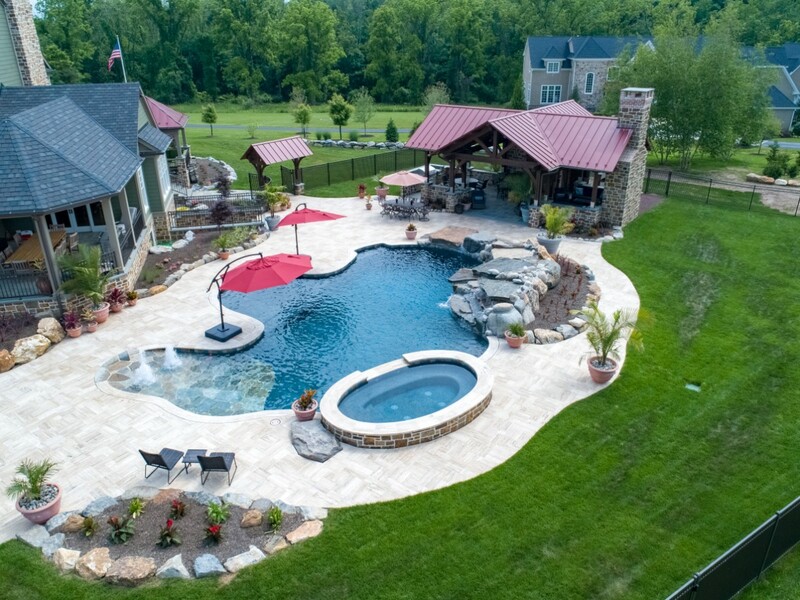 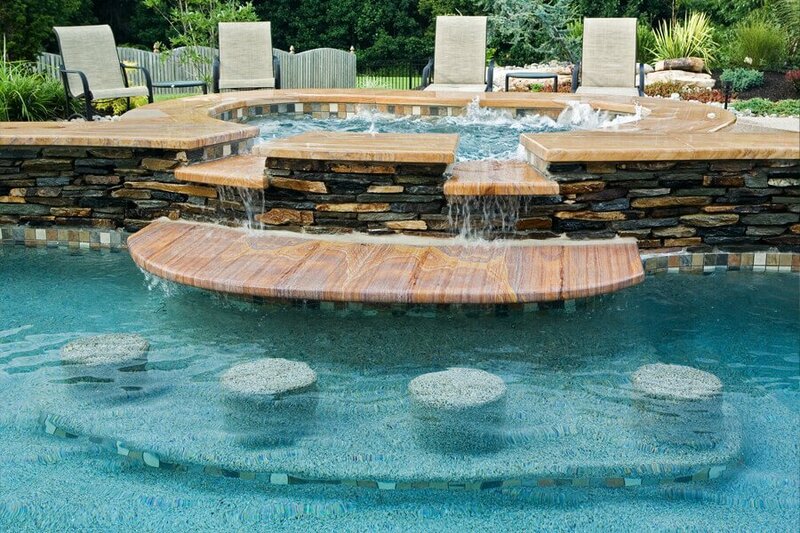 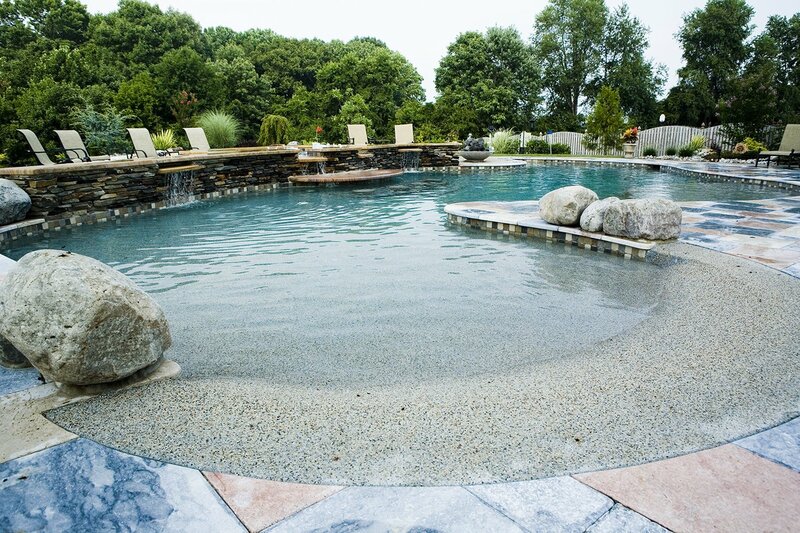 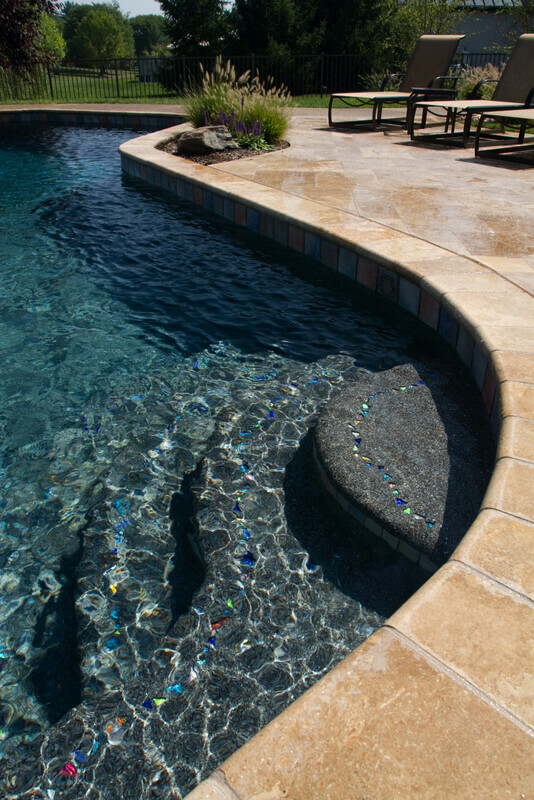 Traditional pools are a timeless classic. 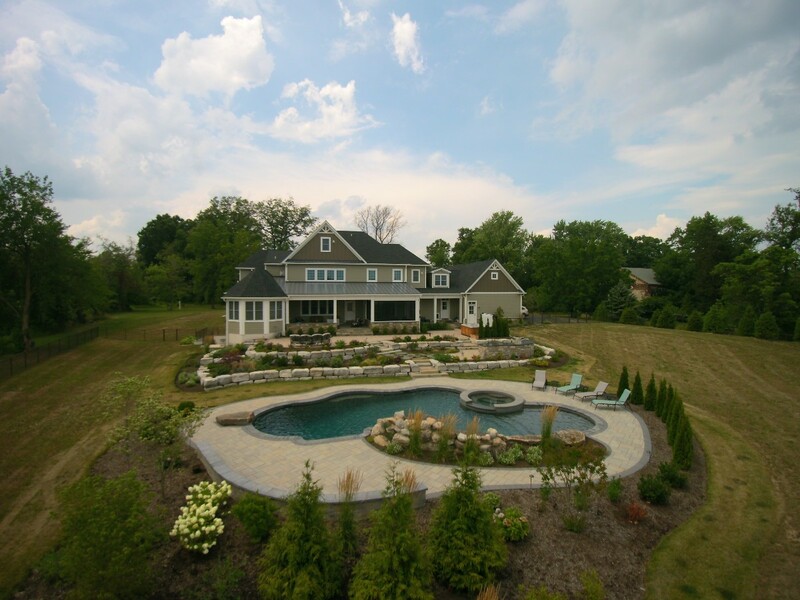 "Beauty on the Countryside" was designed with a free form style to counter the straight architectural lines of the house. 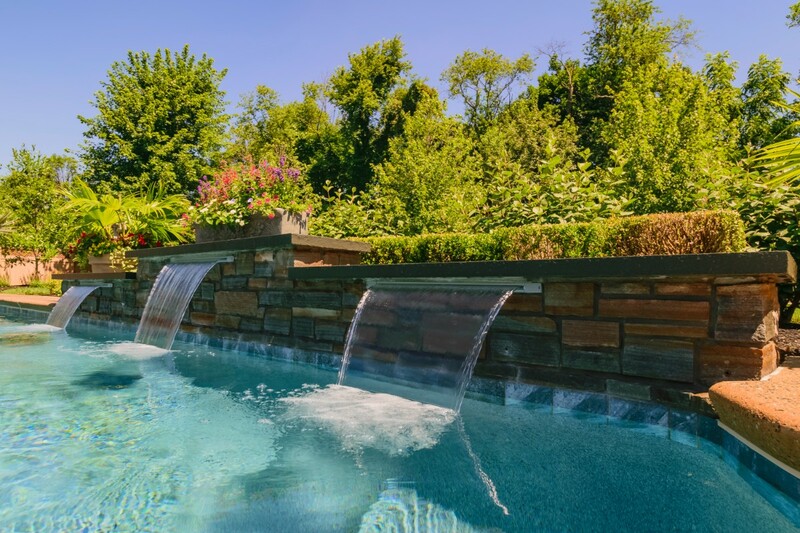 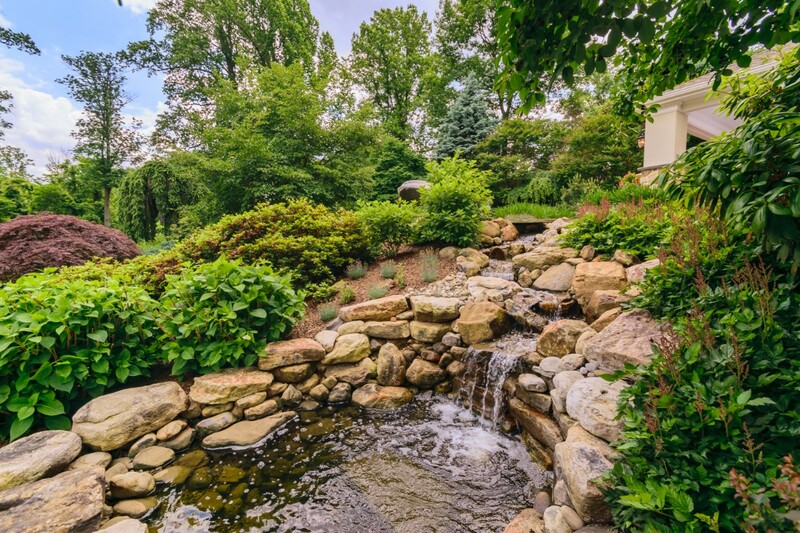 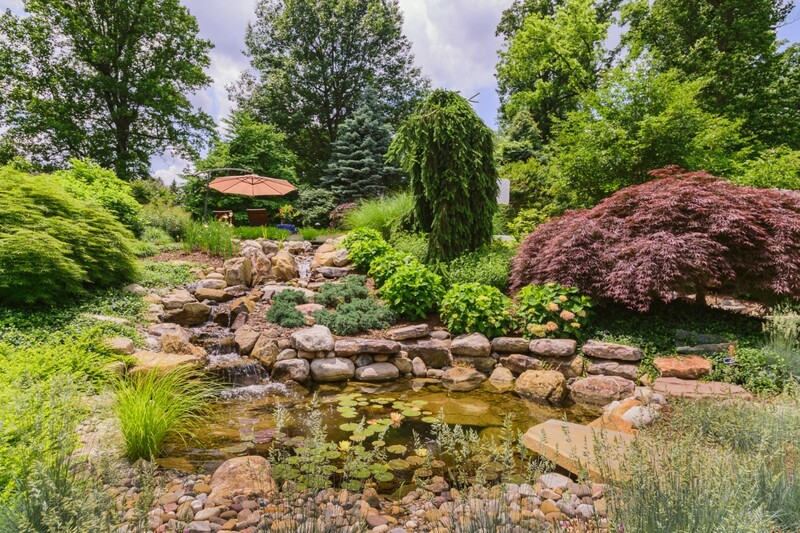 The home is very formal and the intention was to create a natural setting with a free form pool, boulder water features, boulder retaining walls with native plantings, and other features. 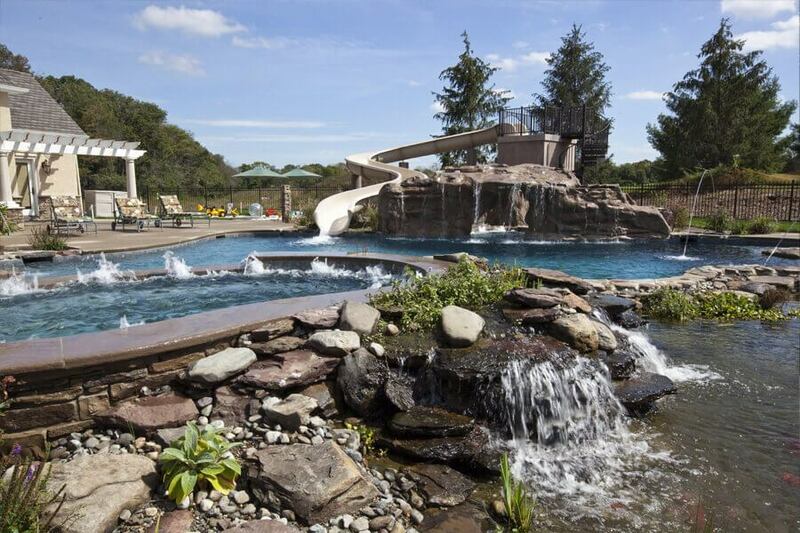 "Architectural Wonderland" is an unforgettable pool. 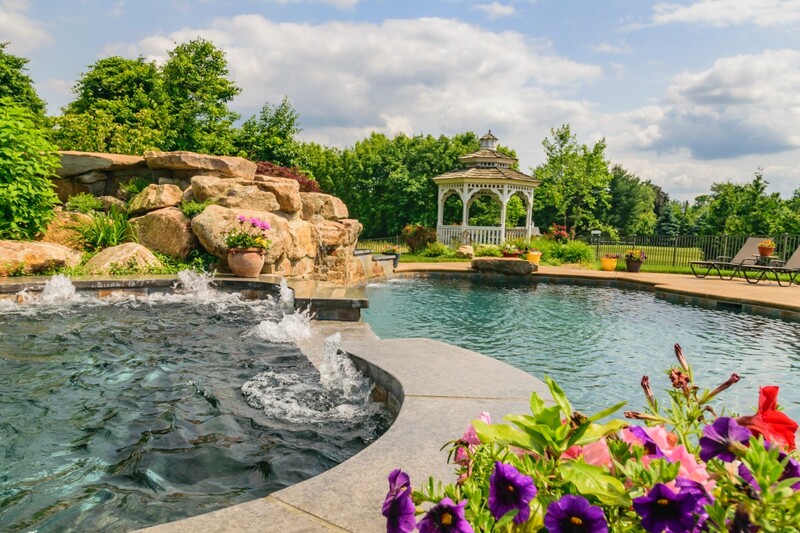 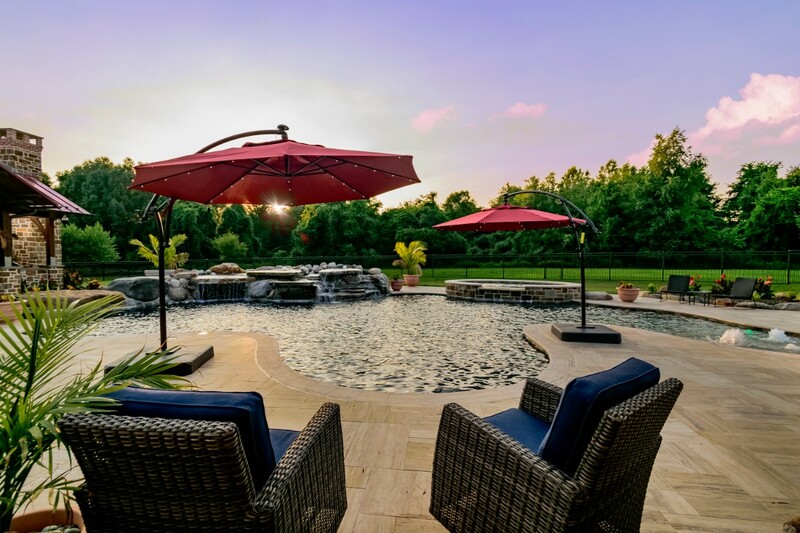 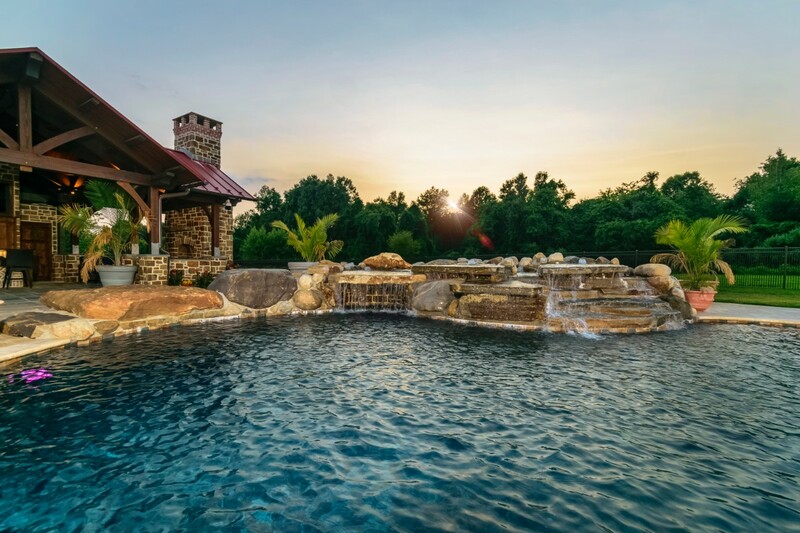 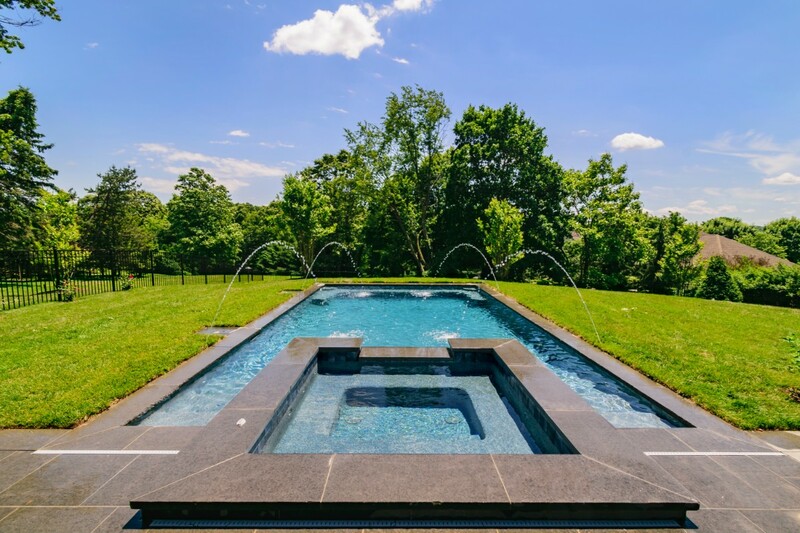 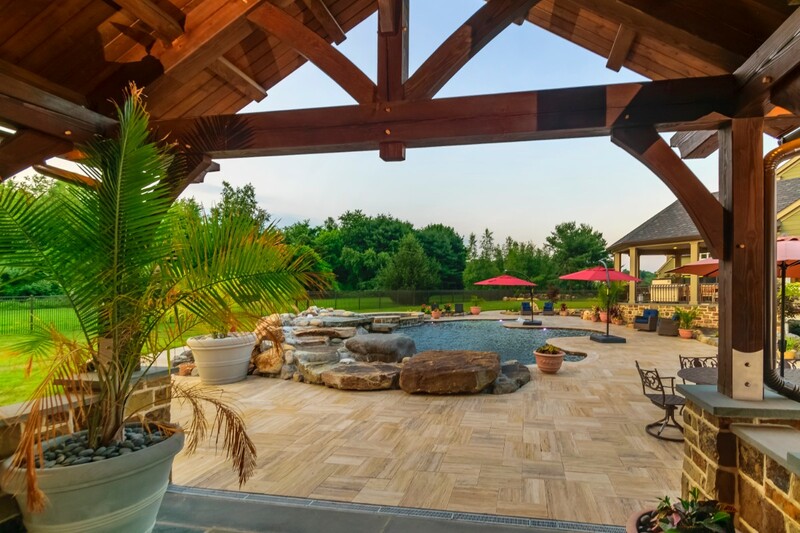 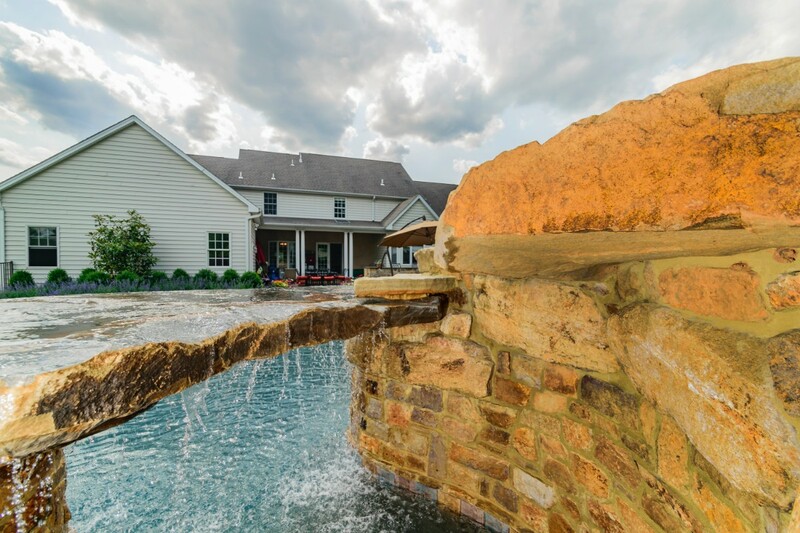 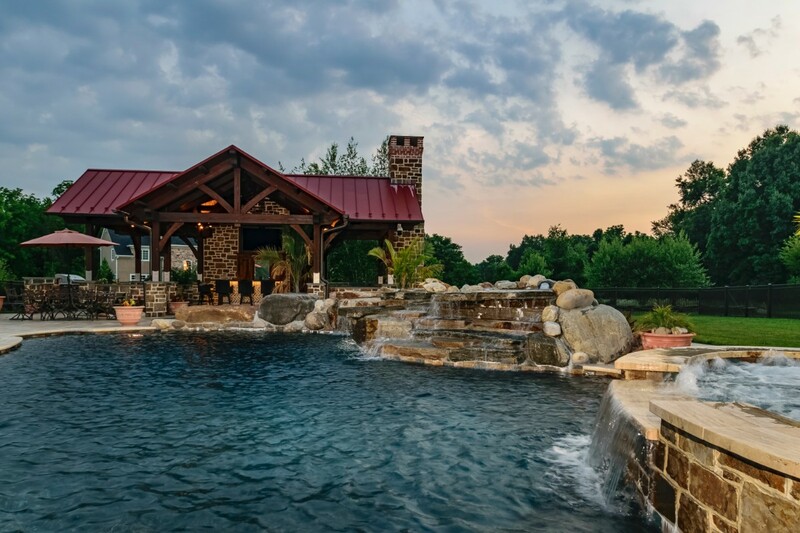 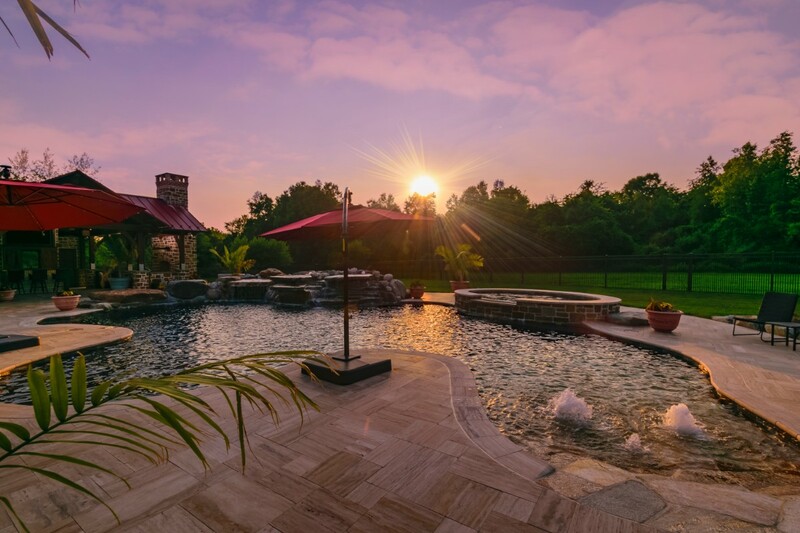 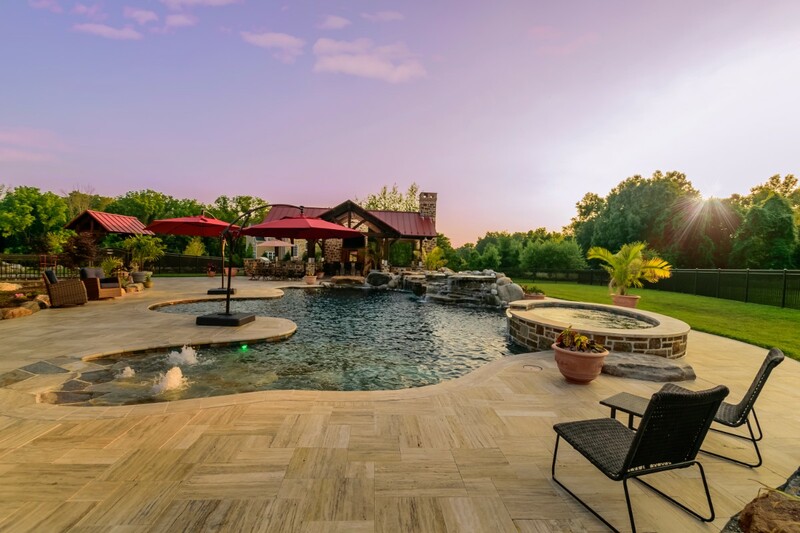 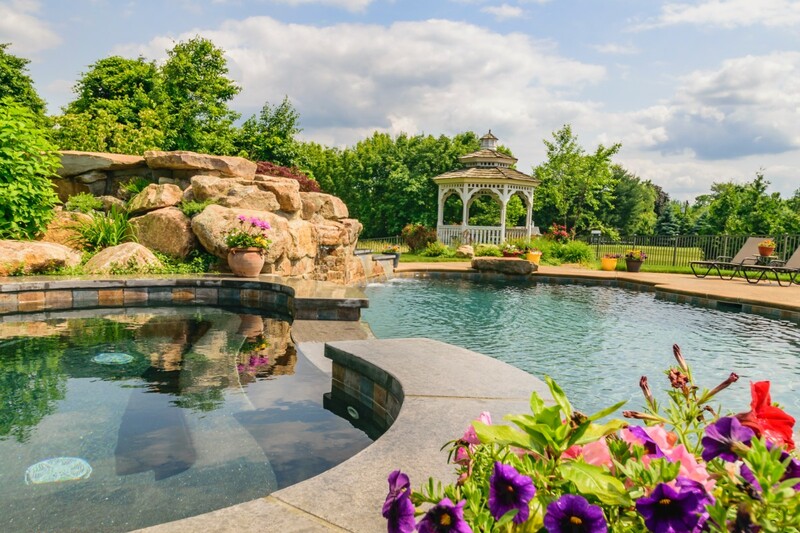 The traditional pool is raised 12" above the grade to create a reflection pond water feature with a focus on the stunning views of the nearby pond. 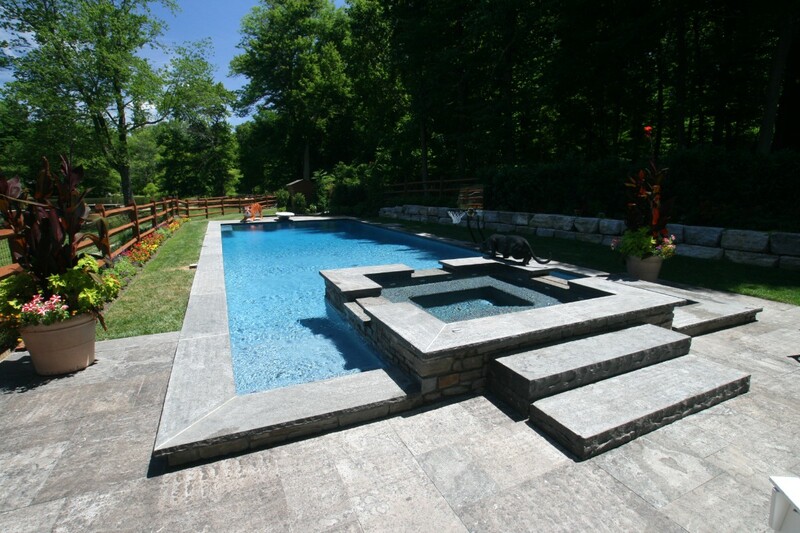 The raised feature of the pool creates a seating element around the entire pool for conversation and ease of entry. 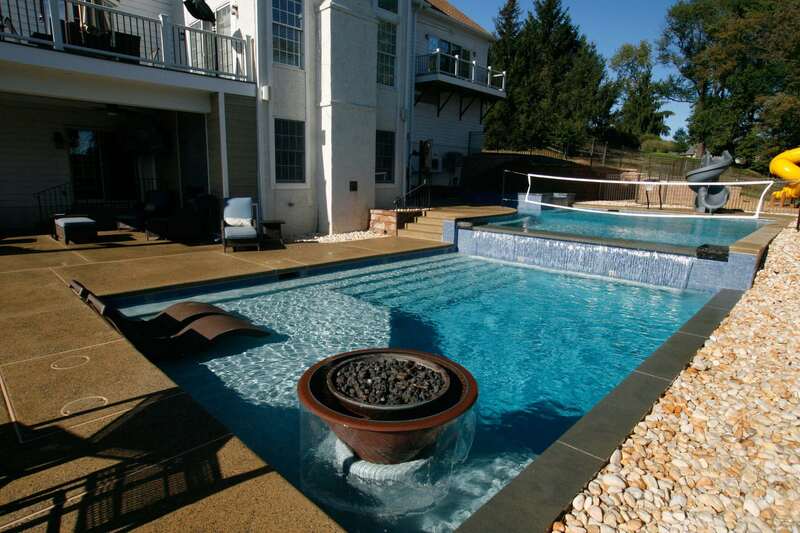 "2 Deck, 2 Pool Party" was designed with the number 2 in mind. 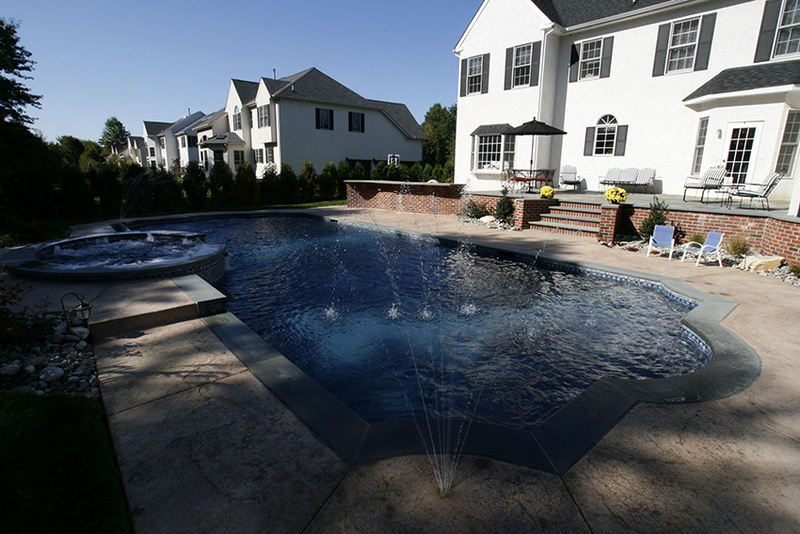 Two pools operated by two separate filtrations systems but connected by vanishing edge. 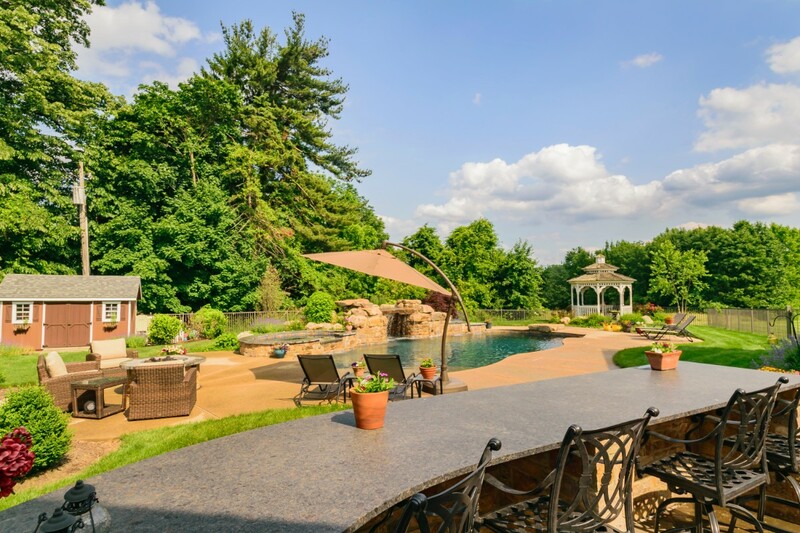 Two raised decks with spectacular views of the pool and landscape setting. 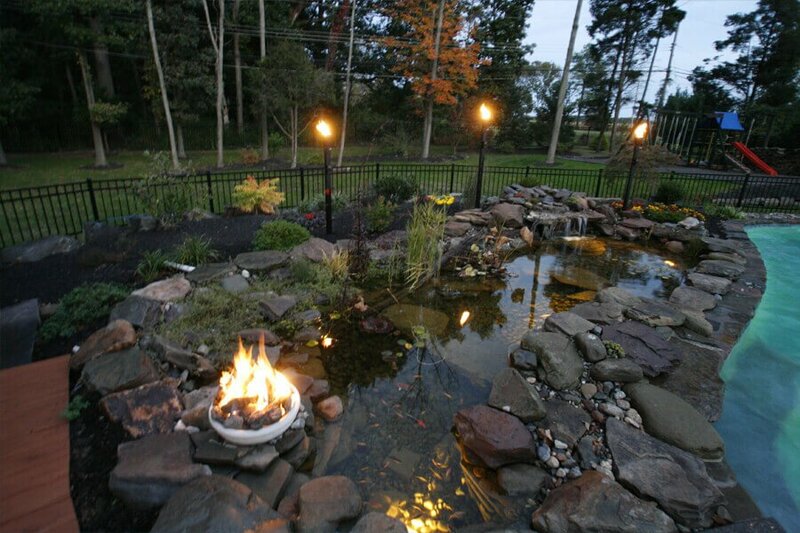 Two separate fire settings with a natural gas fireplace and a wood burning fire pit. 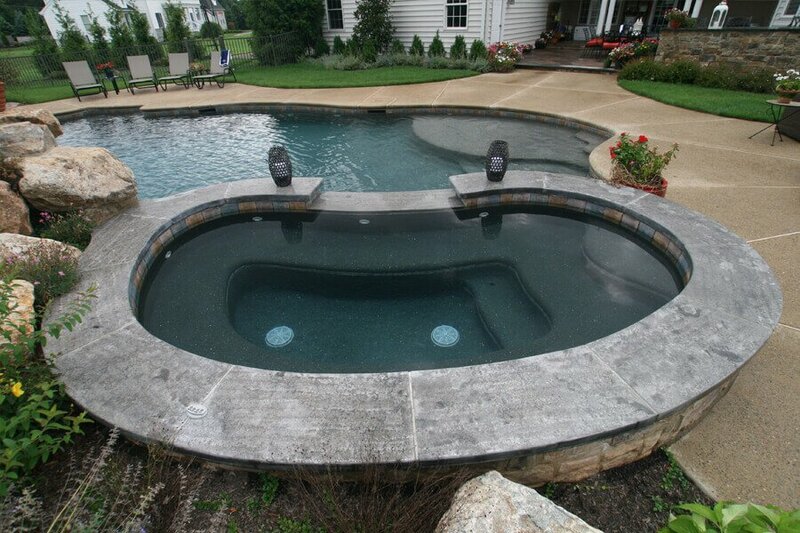 The beauty of the two pool system is the function of an adult style pool and a kid's style pool. 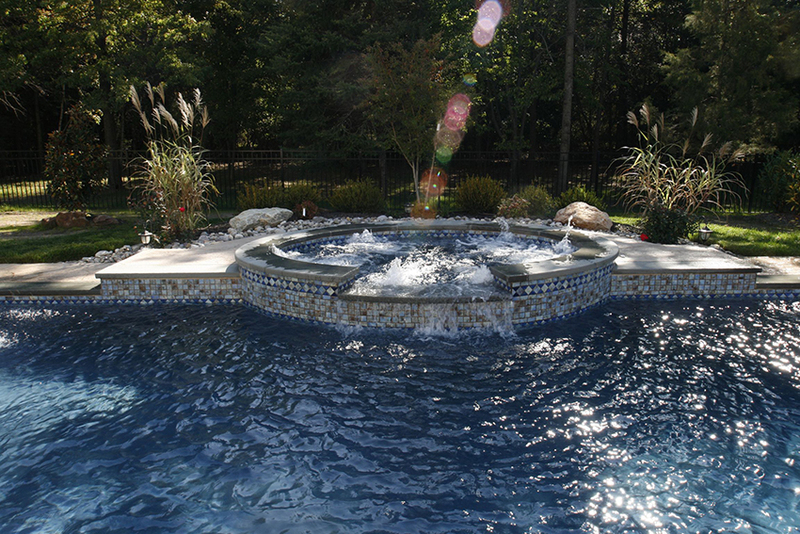 While the kids splish and splash in the upper pool, the adults can bathe in the sun in the lower pool. 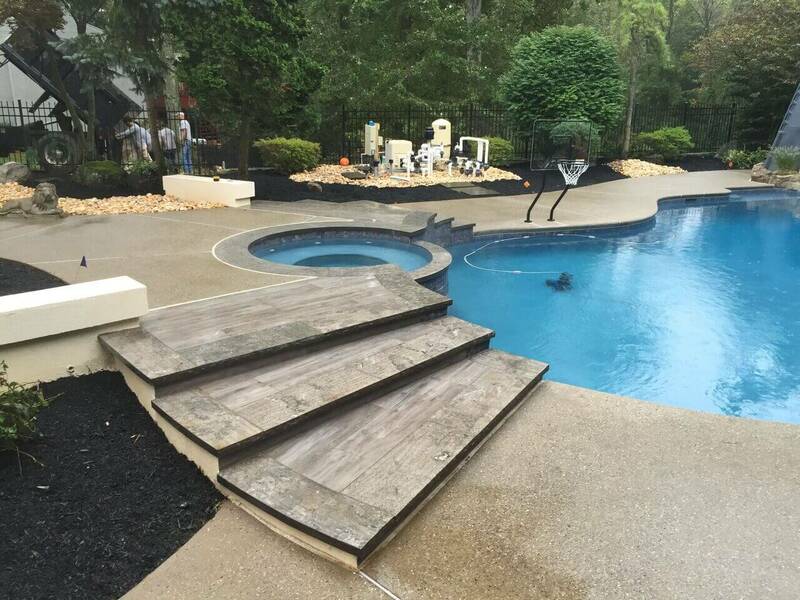 "Ordinary to Extraordinary" takes new life. 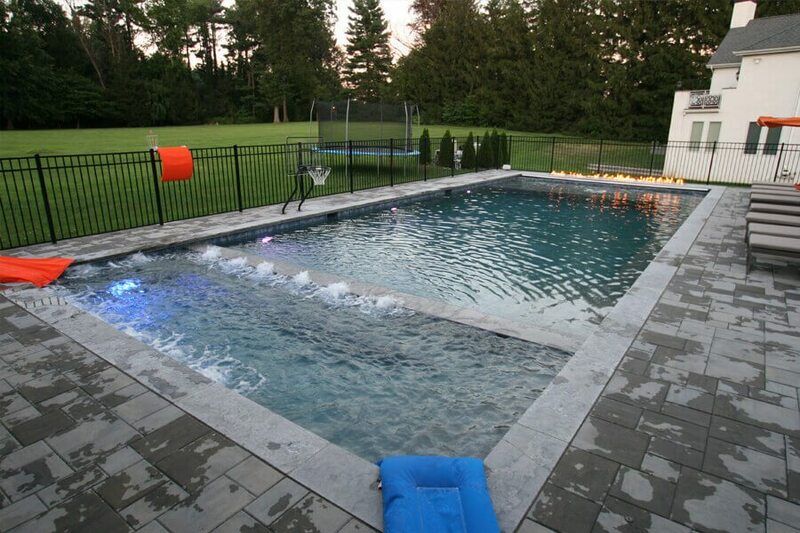 This pool is fun for both kids and adults. 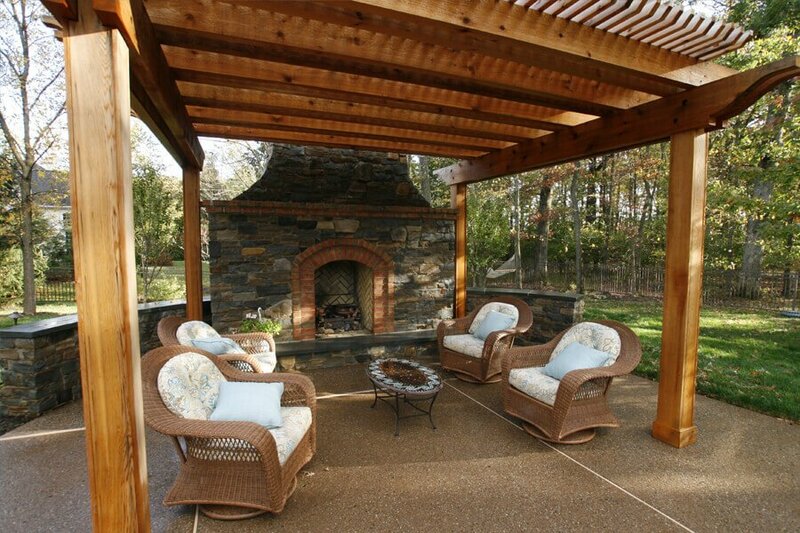 The beautiful renovation is simple but elegant and really gives the backyard new life. 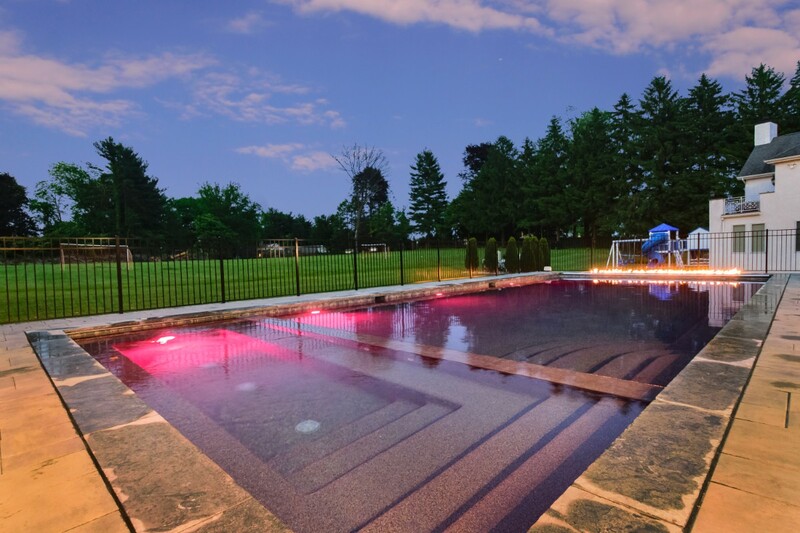 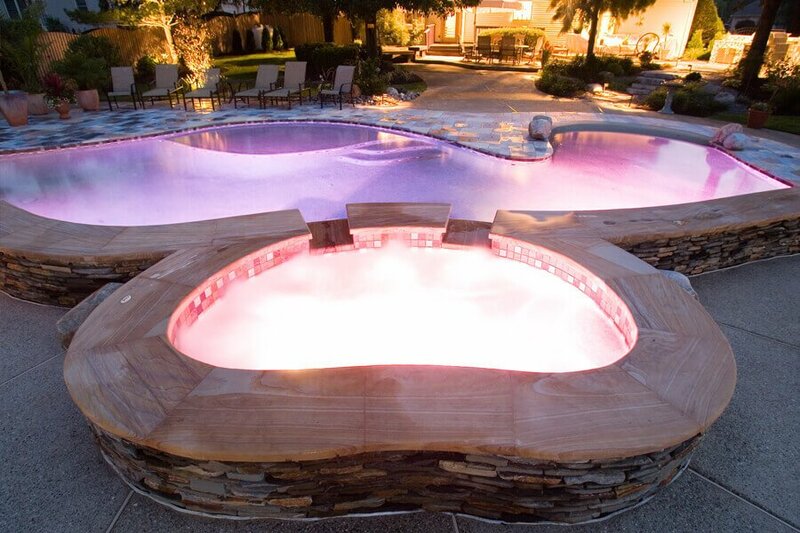 "Curvy Beauty" is a beautiful breathtaking pool that went through the total transformation. 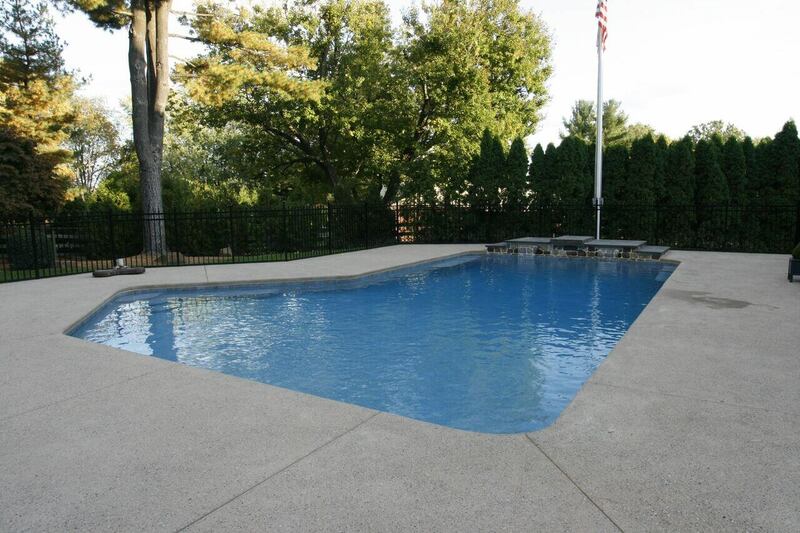 The original pool had broom finish concrete deck with a white plaster. 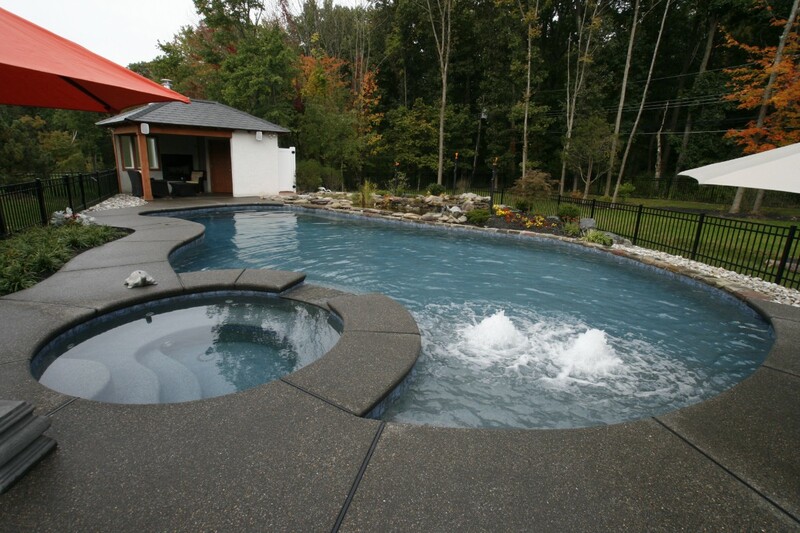 With the renovation, Crystal Clear Signature Pools added amazing features that brought the new and modern pool to life. 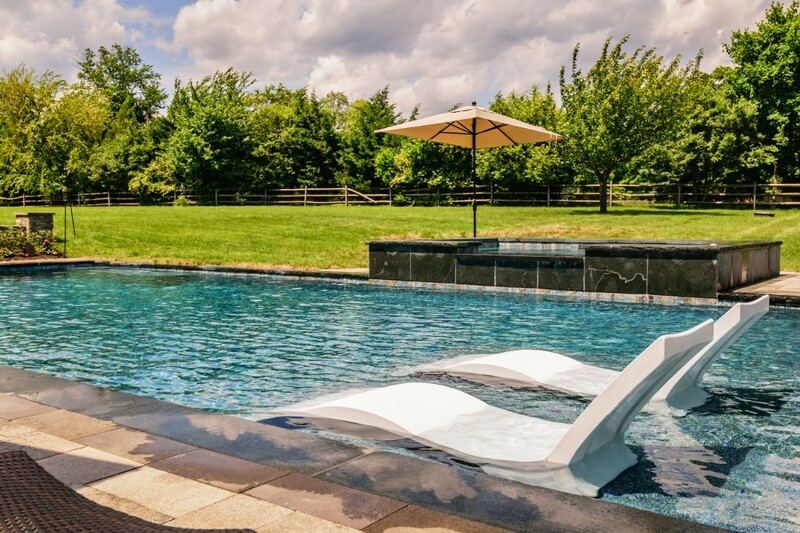 "True Blue America" is simple, elegant and fun. 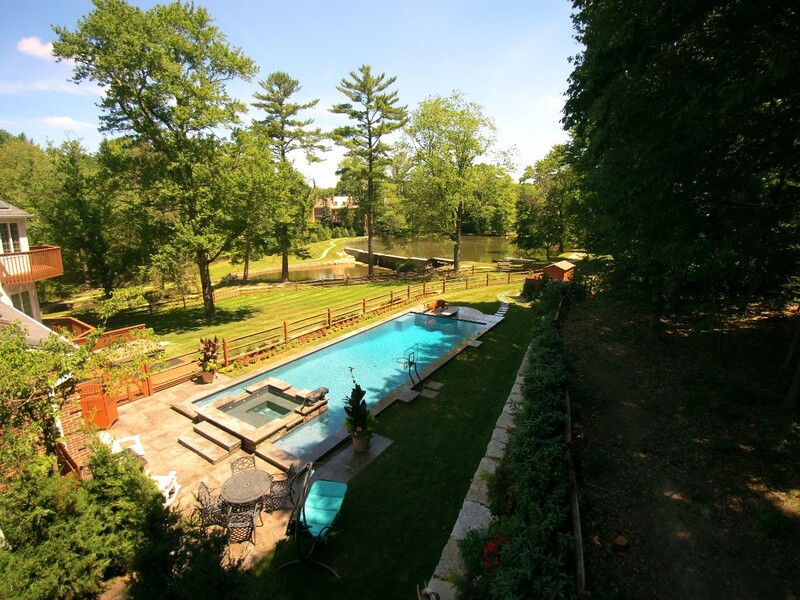 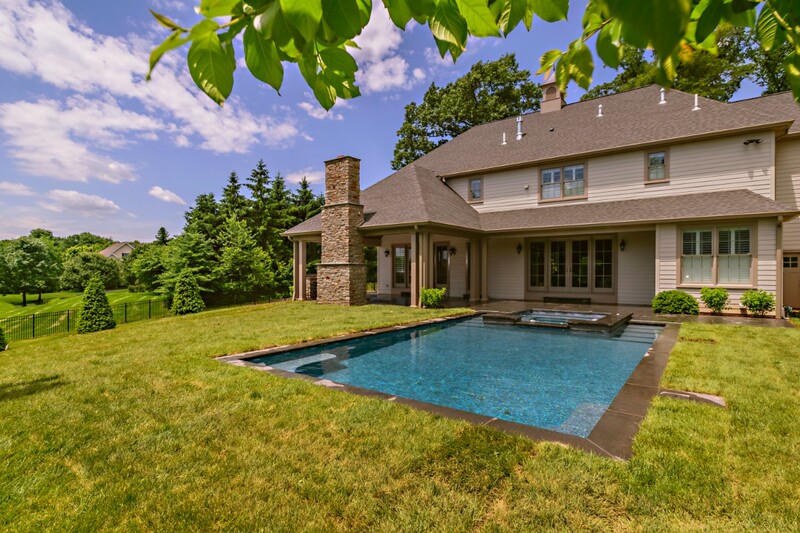 The pool has beautiful form and fits well with the farm house setting. 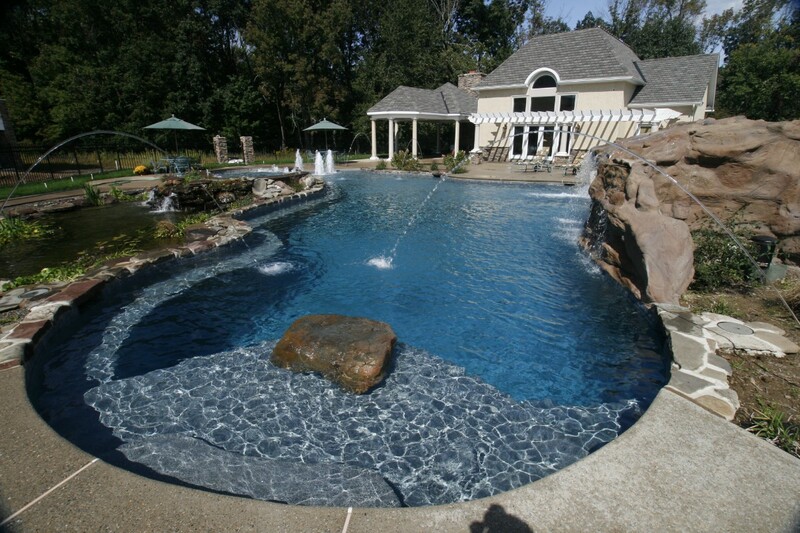 The existing pool was outdated and lacked unique features. 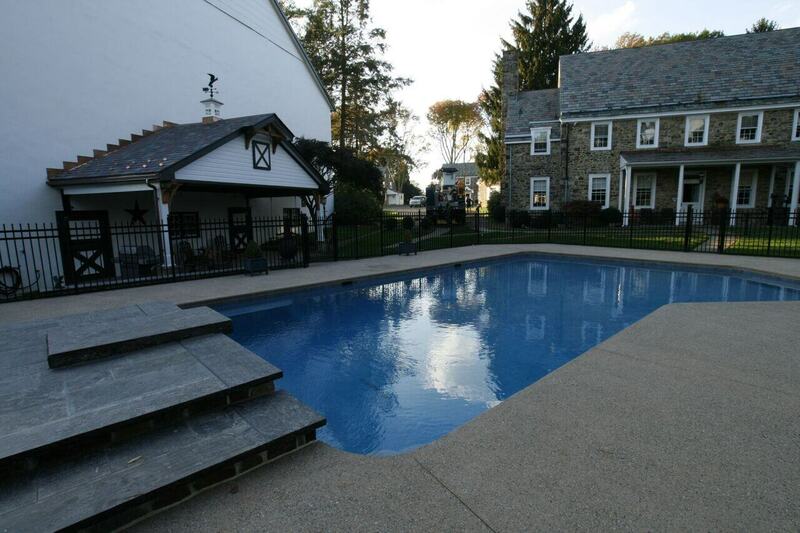 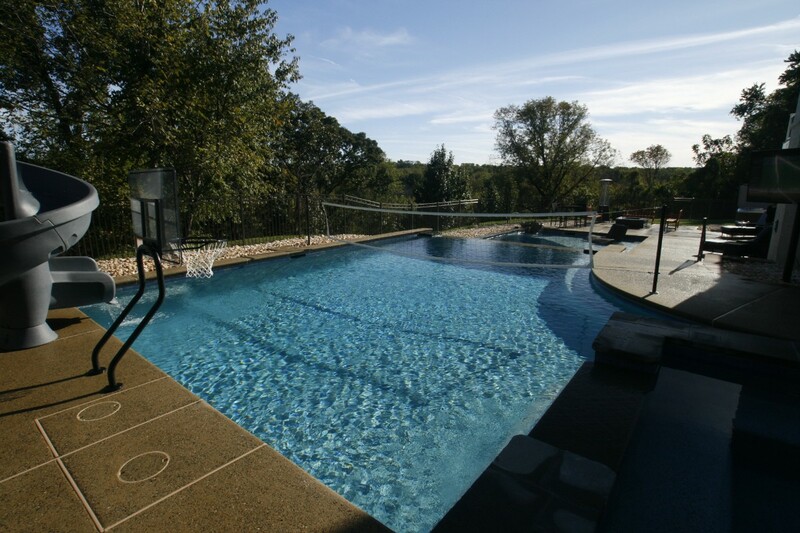 After the renovation, the pool has style and class and is a great addition to this beautiful home.